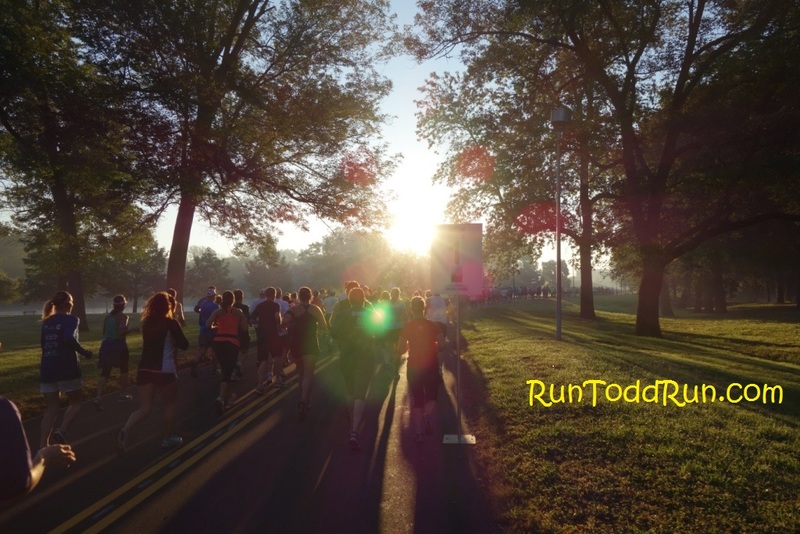 Run Todd Run! | Random thoughts from an average guy trying to run . . . It has been a while, and I suppose I have some catching up to do. 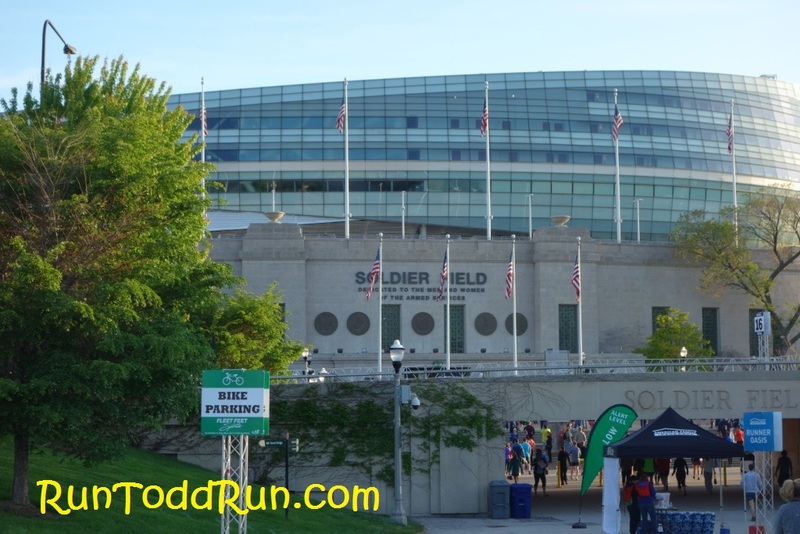 I will start with the Soldier Field 10 Mile in Chicago. We signed up for this one relatively last minute. We decided to make it a weekend trip to Chicago for our anniversary over Memorial Day Weekend. Running a 10 miler gave us a reason to feel a little less guilty about the food we would eat that weekend. 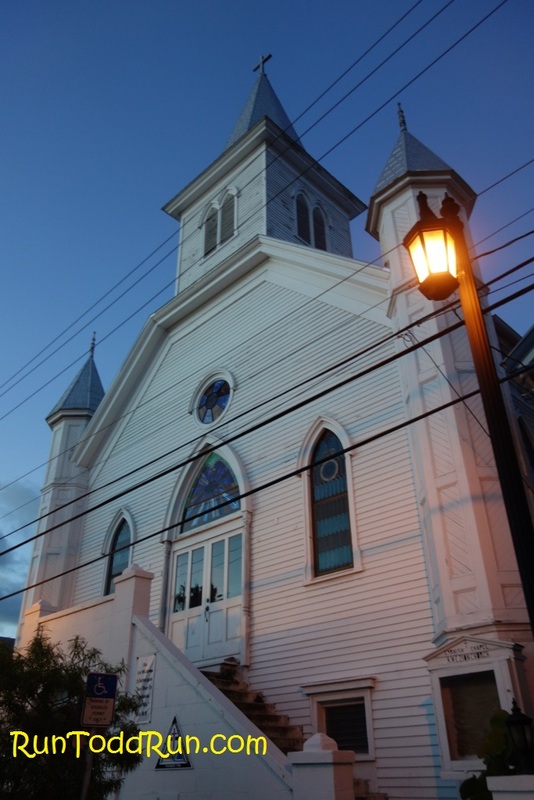 There was an option to have race-morning packet pick-up (for some extra $), which really helped us out-of-towners. We arrived in town late the night before the race, checked into our hotel, which was near the start, and got some rest. The next morning we woke up bright and early for the run. 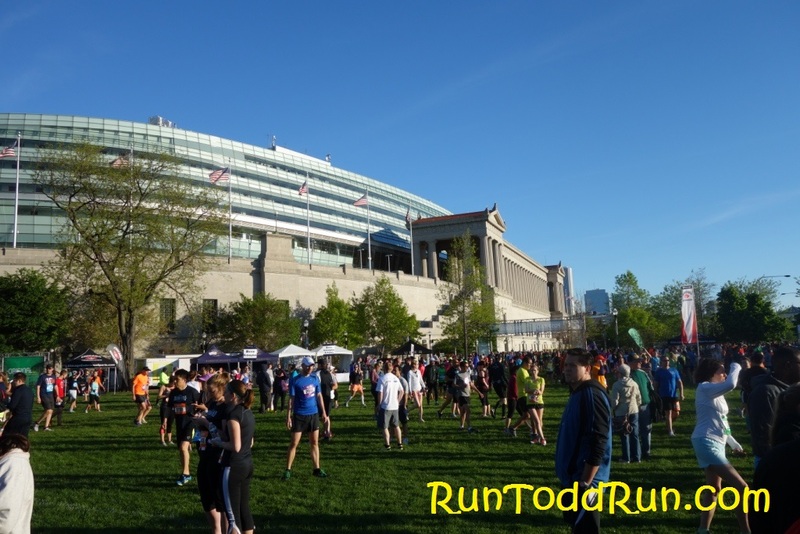 It was a beautiful morning, and it was nice to be able to walk to the start line just outside Solider Field. 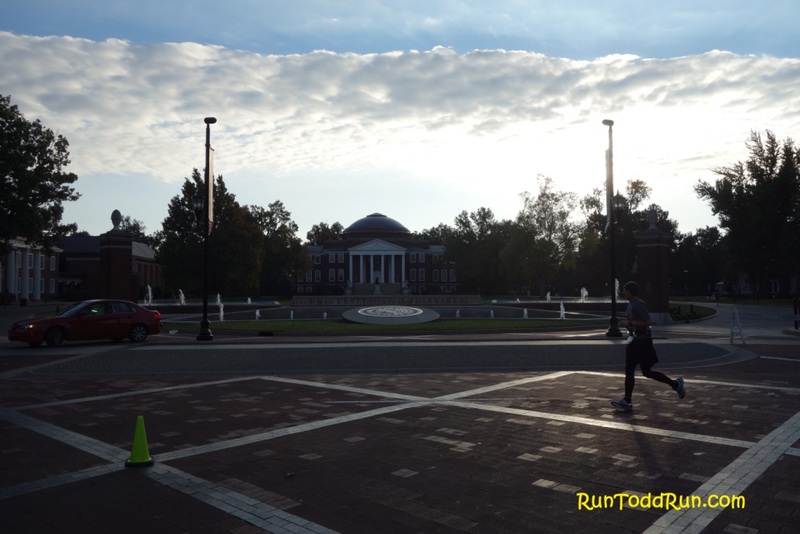 The day would get a bit warmer, but the morning gave us some great running weather. 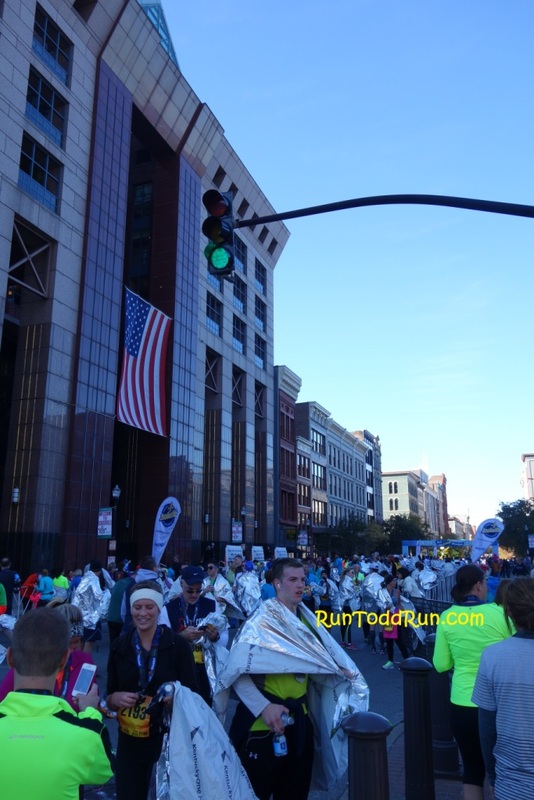 There were 18 Corrals or so, and we started in Corral 9, which gave us a good view of the start line, based on how they arranged the corrals on two different streets. 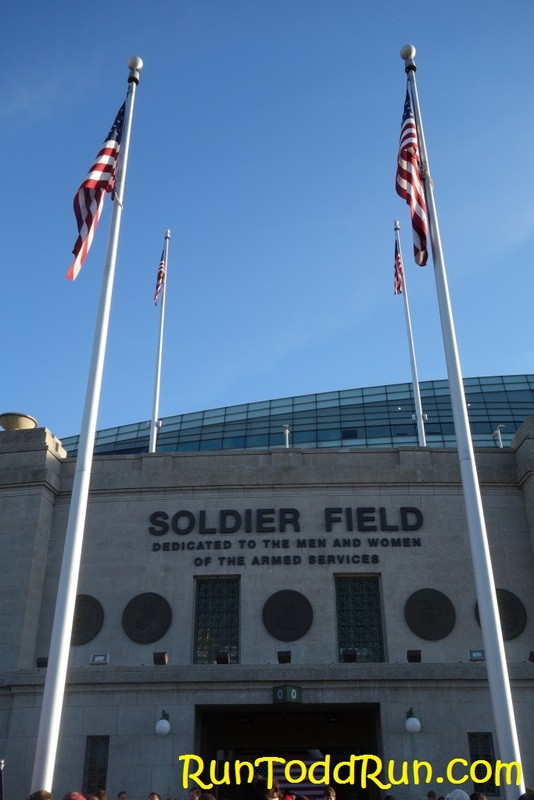 The race, as you may expect, was centered on honoring those who gave all serving our country, and those who continue to serve (Soldier Field and Memorial Day go well together, obviously). The ceremonies at the start were very moving, and about 20 minutes after the first corral went off, it was our turn. 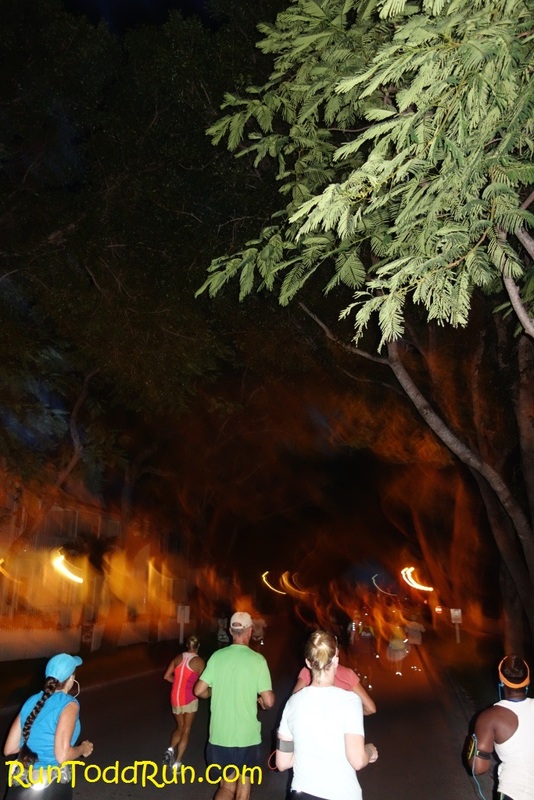 On The Way To Our Corrals – Also the site of the post-race party. 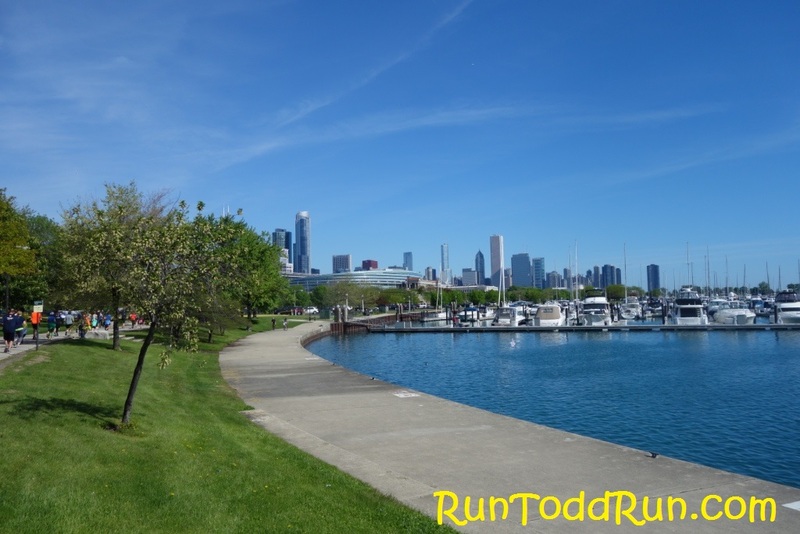 The course was an out and back along Lake Michigan and part of it utilized Lake Shore Drive until the turn-around point. We turned around at about mile 5 and returned via a path along the Lake. All along the way there were pockets of supporters and folks cheering, in addition to a couple of bands which livened things up a bit. 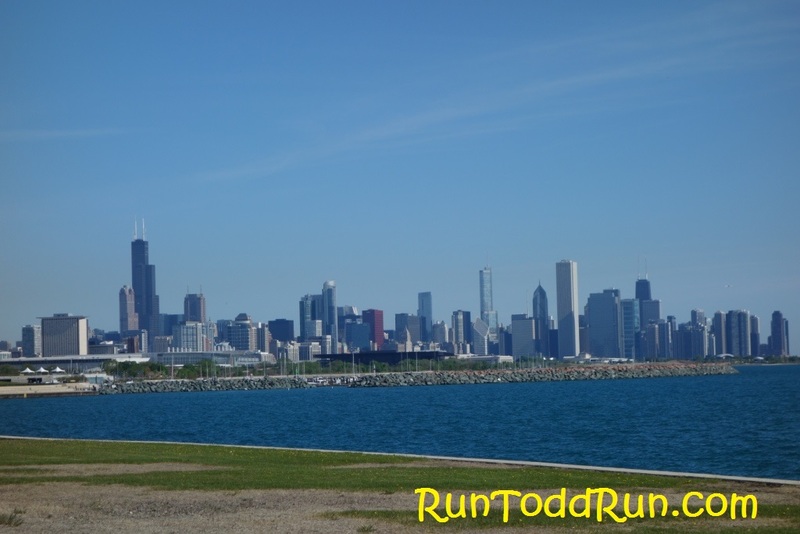 As you might expect, with such a sunny day, the views of Lake Michigan were gorgeous, and the route after the turn-around gave us some great views of the Chicago Skyline. 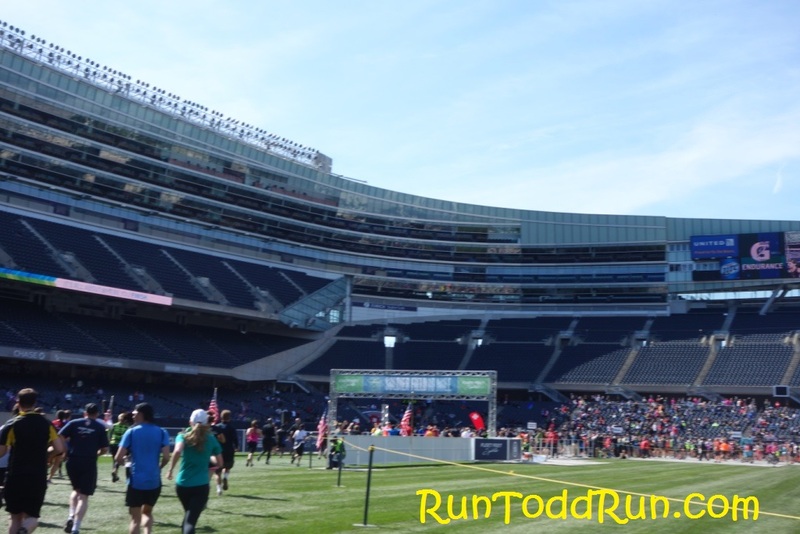 The only little drawback I noticed was that being able to see Soldier Field from so far away was a bit of a tease, as the finish never really seemed to get closer. We had not really trained specifically for this race, so the last couple of miles were a bit of a struggle. The finish line seems so close! 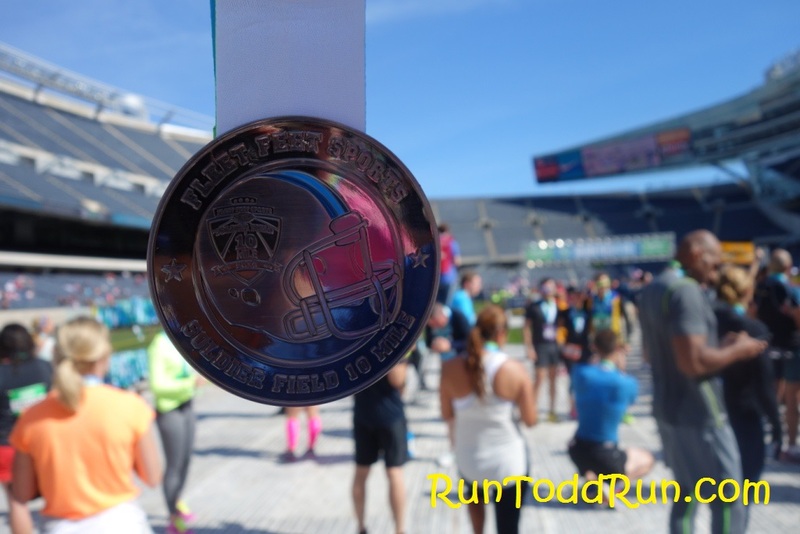 One of the main selling points of the run is that you get to finish on the 50 yard line of Soldier Field (“It’s All About Where You Finish”). The route to get to the 50 took us past the field and through a service entrance. 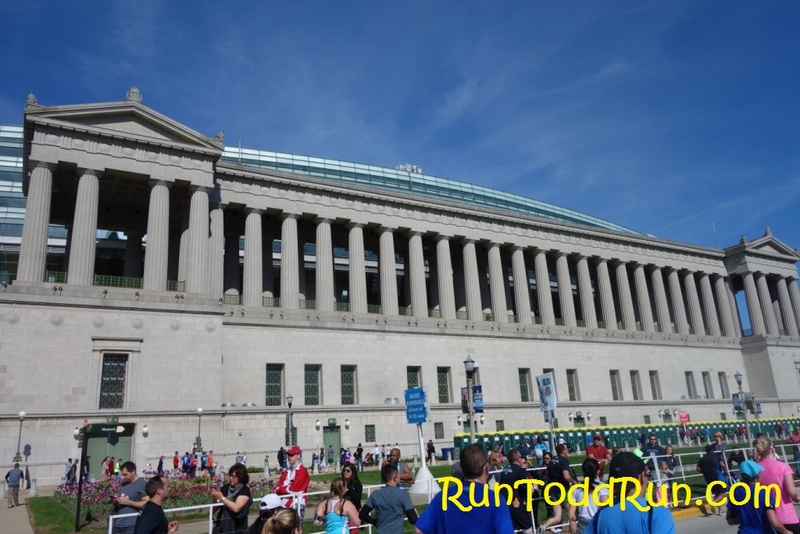 After a quick jaunt through the bowels of Soldier Field (which my Garmin did not like), we entered through a tunnel onto the field. It was a really great way to finish the run. Our time wasn’t great, but this run was more about enjoying the day and kicking off our anniversary weekend by burning some calories that we would make up for later. It was also really great to be handed our medals by active service members, which is another unique touch to this race. Overall, this was a great race. It was extremely well organized, pre-race emails were answered very quickly, and the post race amenities and party were great (free stretching, beer, concert, exhibitors, etc.). The weather really helped as well. 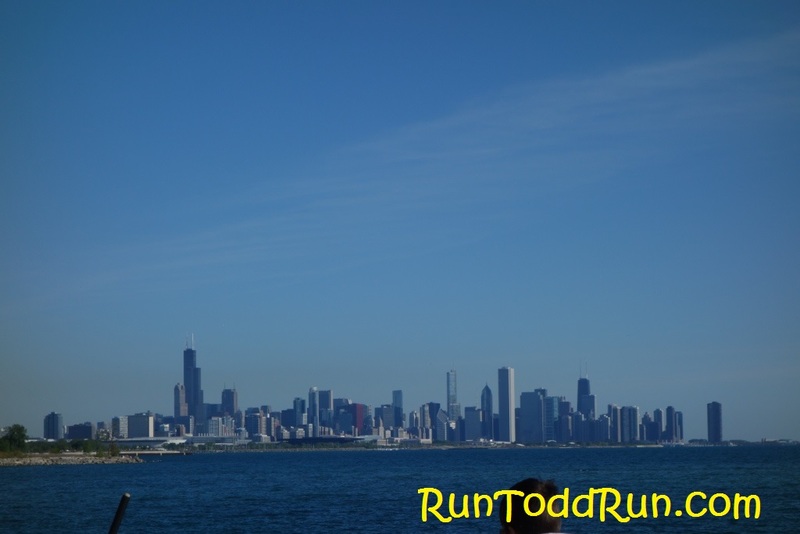 I would certainly recommend it for anyone looking to a good way to run in Chicago. 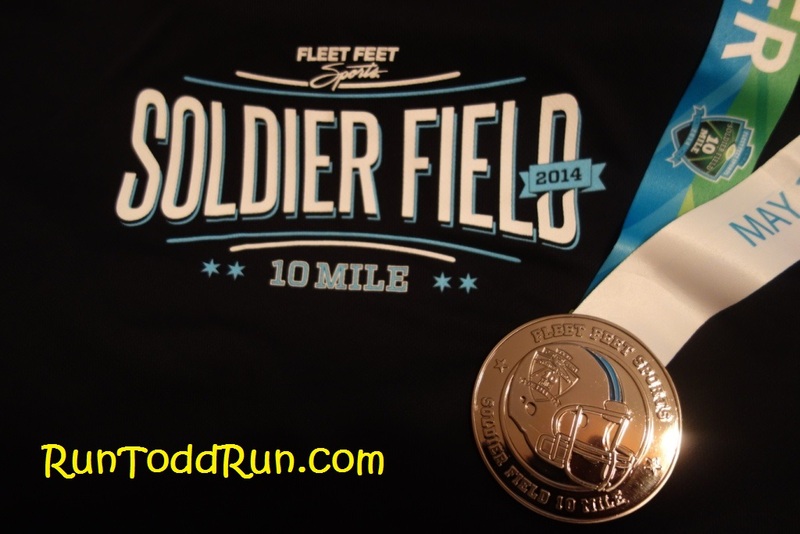 This entry was posted in Running and tagged Average Guy Running, Solider Field 10 Mile on June 28, 2014 by jtspurge. It has certainly been a while. 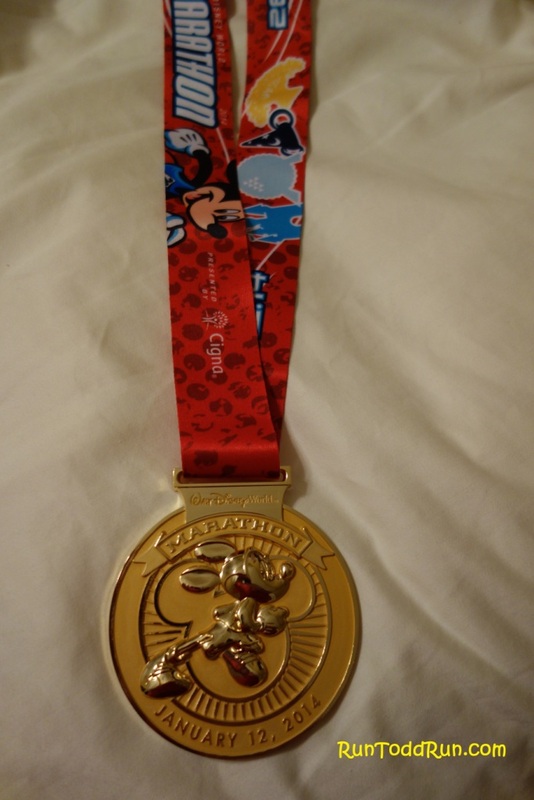 It seems like forever since we were finishing the Walt Disney World Marathon. After taking some time off to recover, rejuvenate, getting back into the swing of training has been tough. With weather and work, finding time to make those training runs has been a chore. We were successful in getting in our long runs, albeit on a delayed schedule. 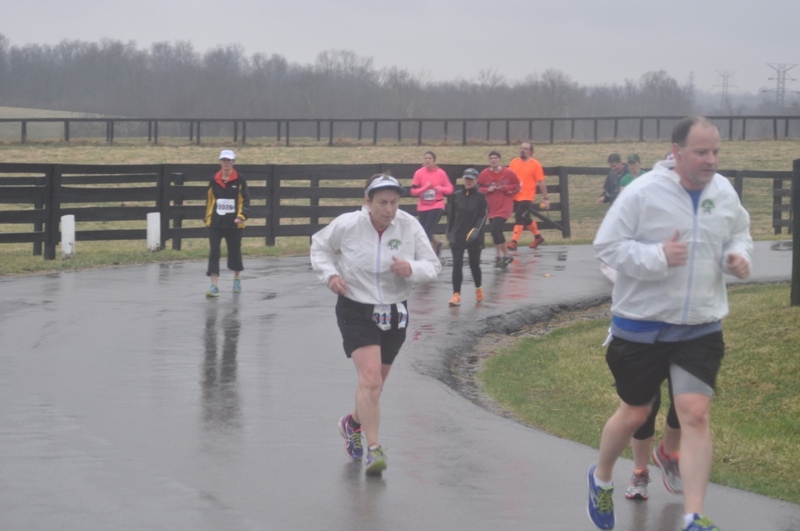 For our last long run before before America’s prettiest half marathon, Run The Bluegrass, we decided to join 6000 or so others for the Papa John’s 10 Miler. 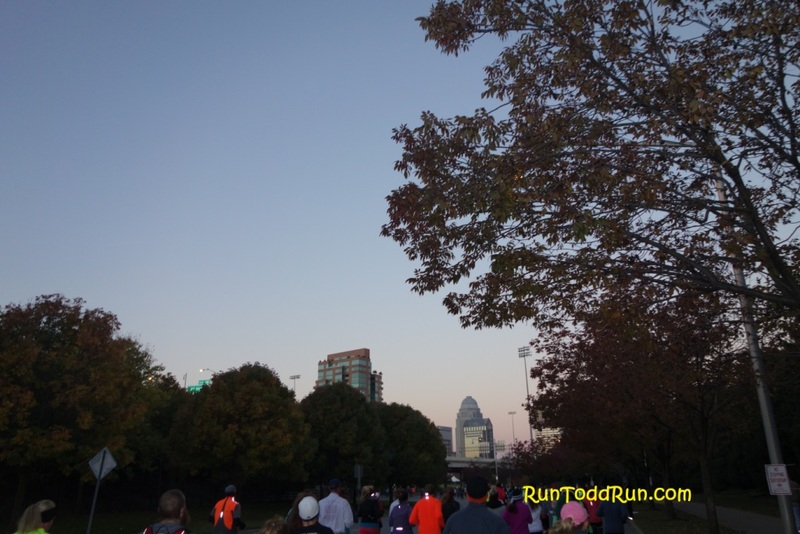 This was our first try at the 10 Miler, which is the third leg of Louisville’s Triple Crown of Running, which earlier featured a 5k and 10k. We registered the day before, and headed out at about 7:15 for the 8:00 start. We parked a bit farther away than we had expected, so we were cutting it close to get to the start with time for a pit stop beforehand. 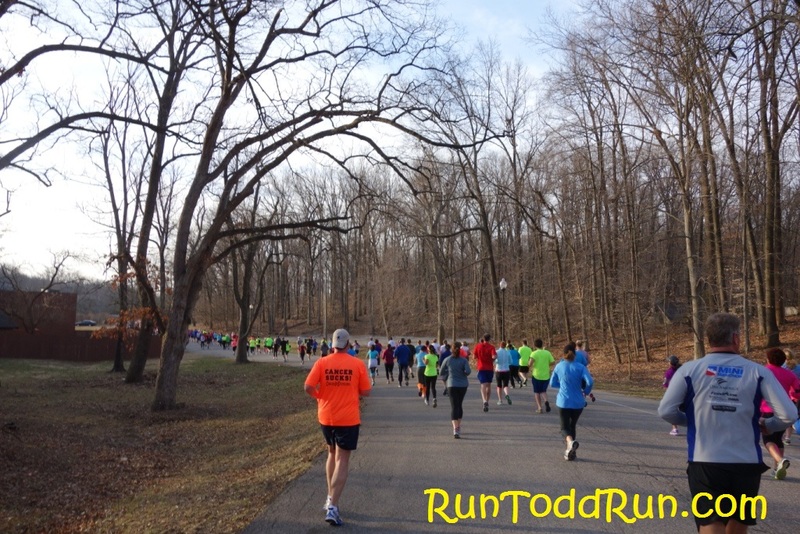 It was a perfect morning for a run, with temperatures in the mid 40s and a slight cloud cover. We got to the start line after the National Anthem, and really never stopped moving prior to the time we got to the start line. The course was new to us, which was nice. We weren’t sure what to expect, and I did not have time to really study it much before the race. All I knew is it was 3 miles of flat, 3 miles of hills, and 3 miles back. 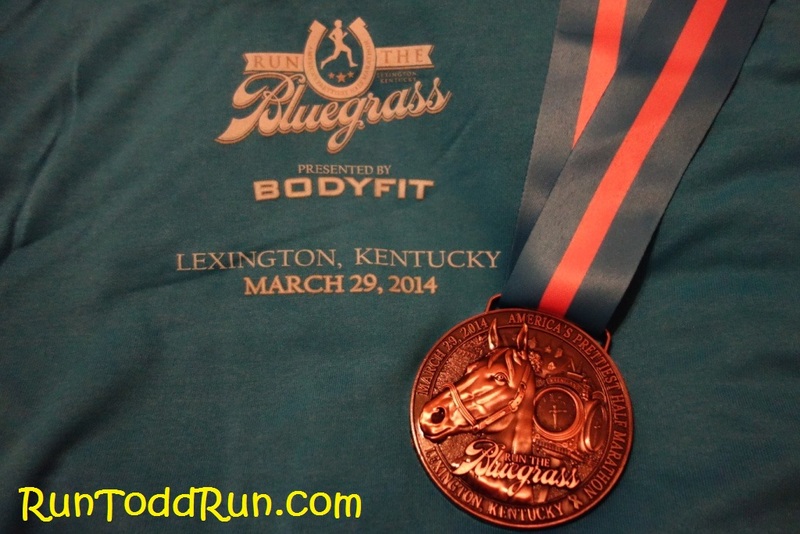 We wanted to try this race to help us prepare a bit for the hills of Run The Bluegrass. The highlight of this race was the “threat” of violence toward Joyce, my wife. Joyce had it goin’ on for this race, if I might say. 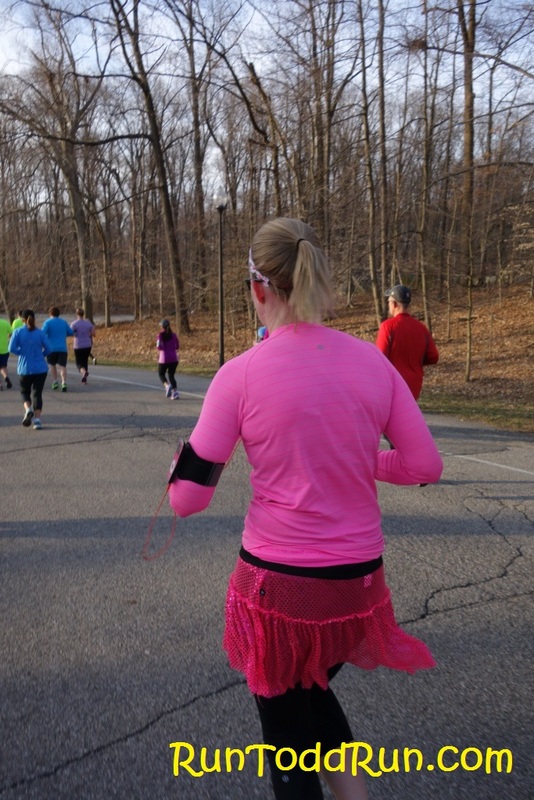 She had on a very well-coordinated outfit accentuated with a pink SparkleAthletic skirt, pink Lulu top, and a pink daisy Sweatyband. Around mile 2 we heard a group of ladies exclaim, “you cannot be that cute! Look at that pretty skirt, and top and bouncy pony tail. I am gonna take her out at the finish for that skirt!” It was all in jest, and it was a fun start to the race. Needless to say, no one fawned over my sweaty shirt. 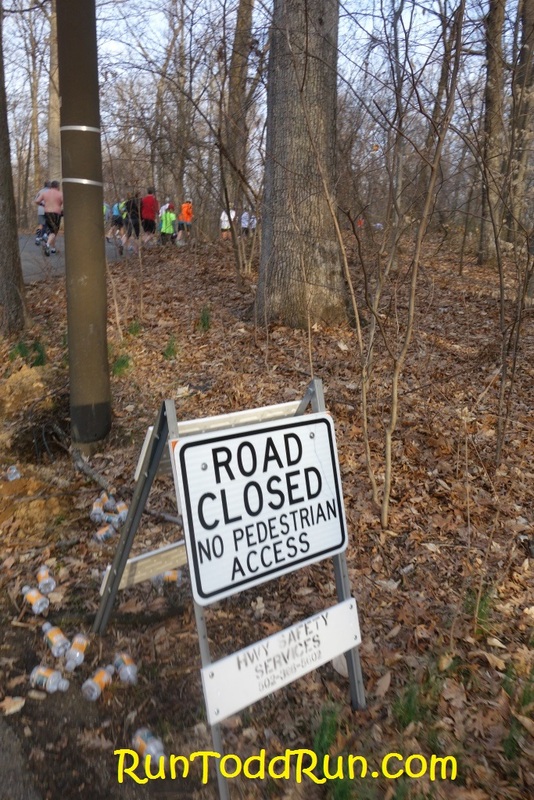 A little after mile 3, we entered Iroquois park. This is where the hills started. We did pretty well through this section, passing a lot of people. We ran up each hill, taking our walk breaks at the top or bottom. After about the third hill, we hurt, but it wasn’t too bad, especially knowing there was a major downhill exiting the park at mile 6. We do what we want. . . The park was really nice, and added a bit of natural beauty to the course. However, the run out and back was through a residential parkway, and it was nice to have folks cheering us on from the front of their homes. As we exited the park, we had about 4 miles left. 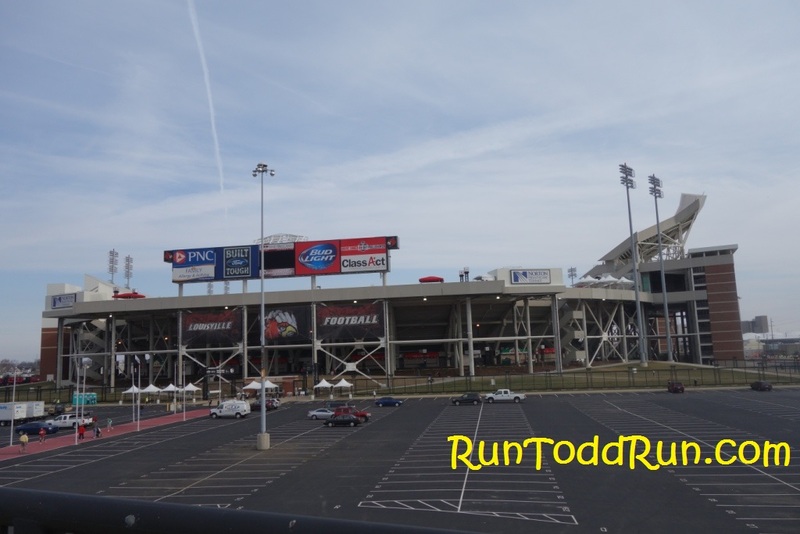 The finish was at Papa John’s Cardinal Stadium, home of University of Louisville football. This would be the first football stadium we got to run through, after having previously run through minor and major league baseball stadiums. We made really good time (for us) through the park, and I was letting Joyce run her pace, without a goal or pace in mind. On this day, her pace was pretty quick, and some of our quickest miles were in the park. Out of the park, we made our way back to the stadium. The finish line was at the 50 yard line. 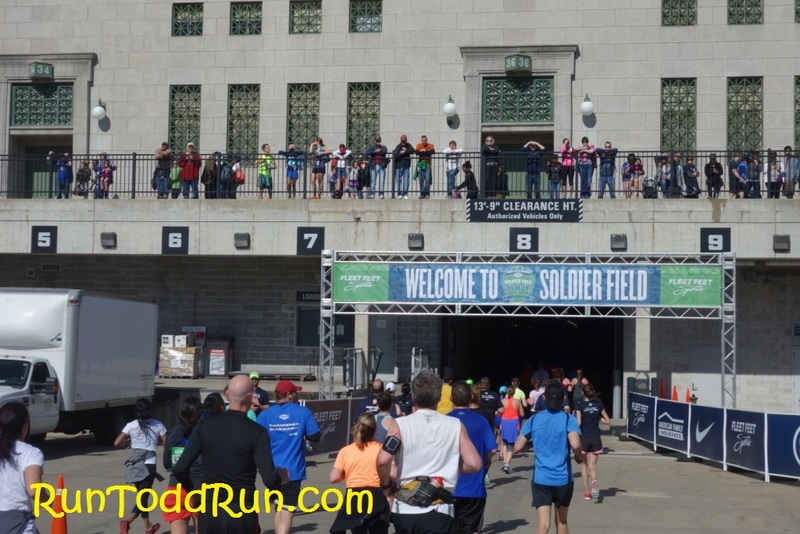 As we neared the stadium, I noticed we were on pace to finish around 1:45. I know we didn’t have a pace in mind, but now that we were in the last half mile, I thought, oh what the heck, let’s see if we can make it in 1:45. 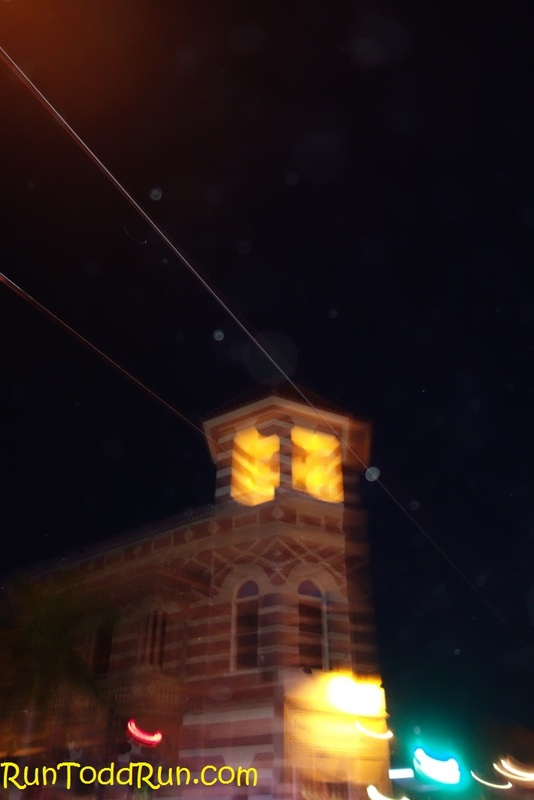 We were well on our way to that time, and I picked up the pace to make sure we made it, much to Joyce’s chagrin. I didn’t tell her what I was doing, but she figured I had some time in mind. I thought it would be no problem until we entered the stadium. 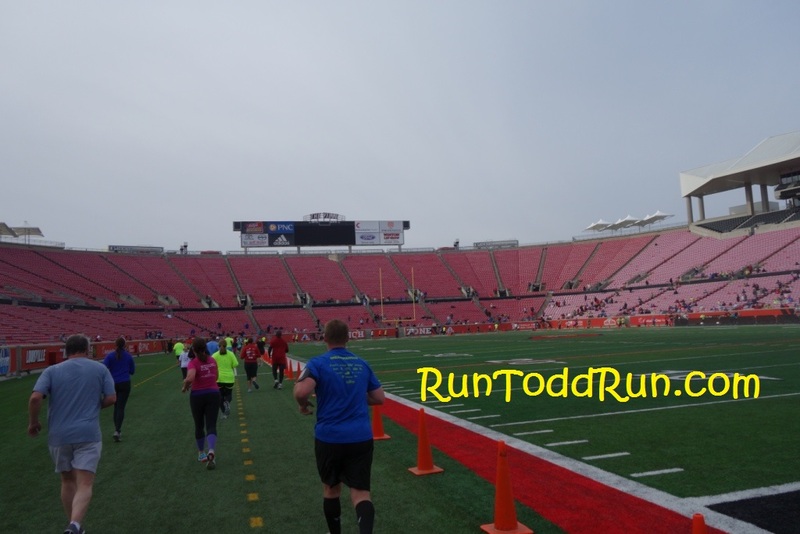 Instead on only having 50 yards to go, we had to run AROUND the field to the opposite side to the 50 Yard Line finish. We really had to kick it in now to make that time. Joyce kept up, and we made it in 1:45. You mean we have to run AROUND the field? There was no medal or other bling for this race. Just the satisfaction of knowing this was a 10 mile PR for us. They had Papa John’s pizza after the race (naturally), but we didn’t really feel like pizza that early, so we grabbed a G2 and made our way home. Overall, the race was a great experience. We had to do a lot of weaving to get around the 4-5 wide walkers or slower runners, but the course thinned out a bit as we moved along. The volunteers were great, and the water stops were ample, staffed by firefighters. We may make this an annual thing, who knows? Now it is on the Run the Bluegrass. This 10 miler had two miles of hills. RTB has 13, with the first big one before mile .5 and a max incline of 9%. It should be interesting. . . 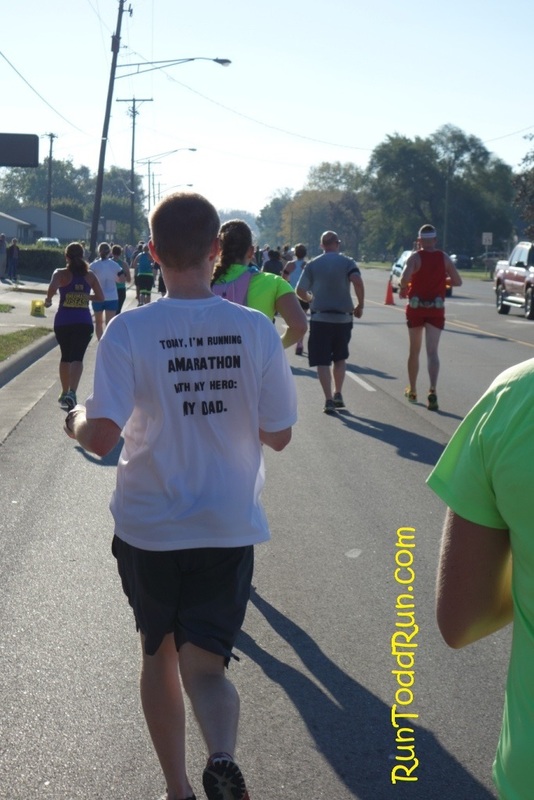 This entry was posted in Running and tagged Average Guy Running, Papa John's 10 Miler on March 24, 2014 by jtspurge. 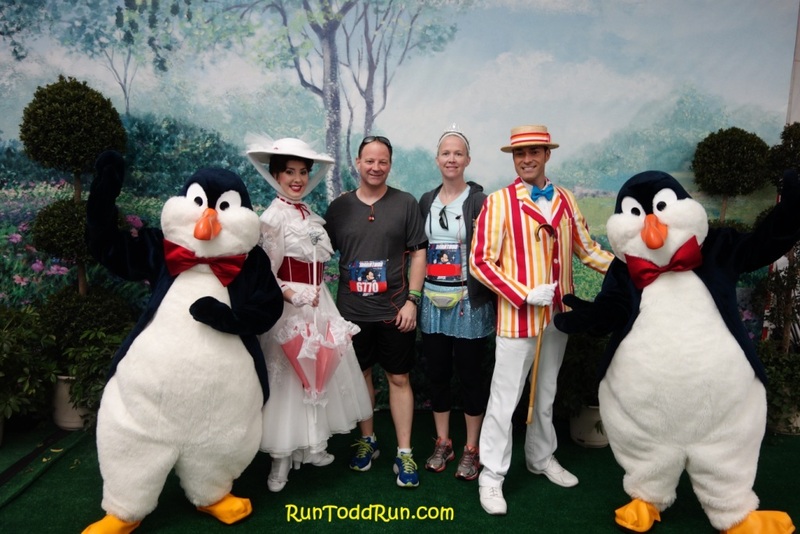 Since my Walt Disney World Marathon recap was so long, I figured I would keep this one a bit shorter. It was only a 10K after all. 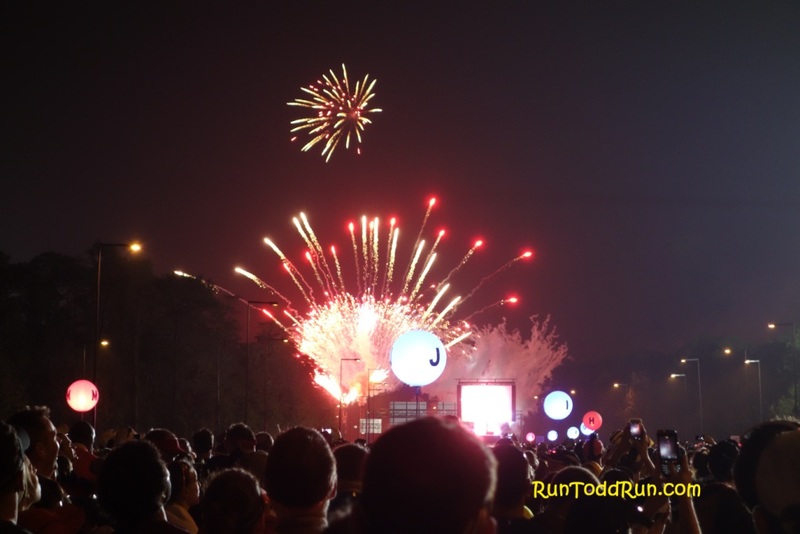 In fact, it was our second inaugural 10K, following the Disneyland 10K last August. Ironically, the weather was very similar. 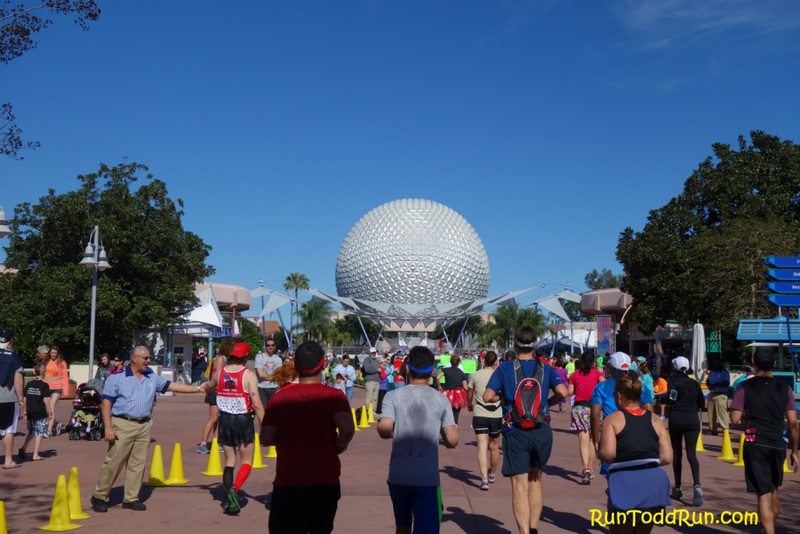 Although the temperature may have been lower at the WDW version, the humidity was definitely high, which pegged the sweat meter. Not knowing what to expect, we were on the first Monorail to the race at 3 a.m. That was a mistake. We were among the first dozen or so people there it seems. Now I know what I quiet start area looks like. If we ever do it again, we know we can sleep in a little. The race was divided into 5 corrals, A-E. We were in the middle in Corral C. I think the corral process for this race worked great as far as moving people though the start is concerned. Also, the corrals were right next to the staging area, avoiding the long walk involved in the Marathon. 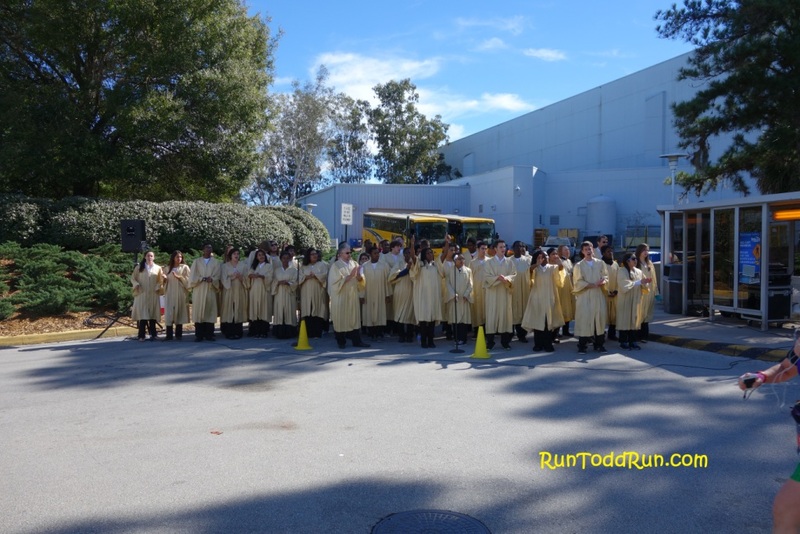 The first 3 miles of the course took us out of the Epcot parking lot and back around to the back stage area of Epcot. The start of the race was slow, and did not thin out until after the first mile or so. I will echo the thoughts I have seen elsewhere that many of those participating in the Dopey challenge made the pace of the 10K artificially slow (even for me) and really crowded the course. I am not sure what could be done about that, however, since they made up 7000 of the 10,000 participants in the 10K. After passing under Test Track back stage, we entered Epcot in Norway at about mile 3.5. 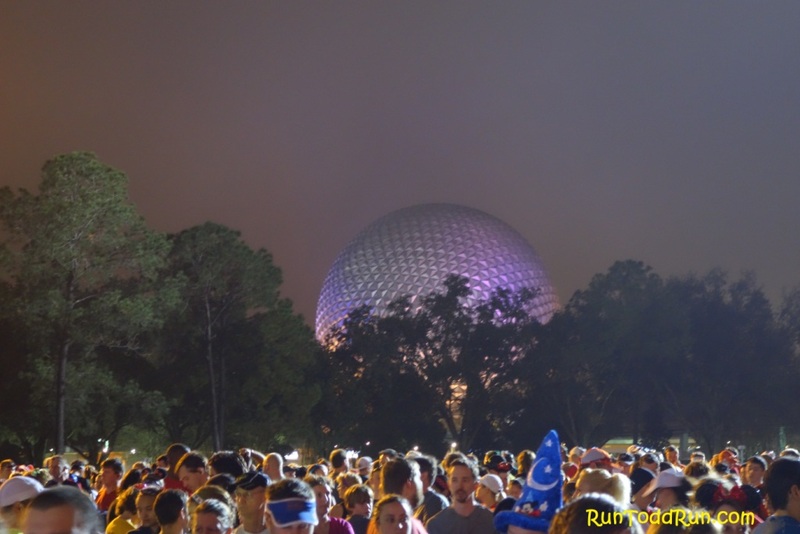 It was really cool seeing Epcot lit up in the dark, and it made for a very pretty run, despite the humidity. We rounded World Showcase and headed toward the boardwalk. I could be heard several times saying, “I won’t be this happy next time I run here,” foretelling the upcoming Marathon. We left World Showcase at about mile 4.5 and ran around the Boardwalk area, passing the ESPN Zone and other Boardwalk attractions. There were several characters out, but the lines were too long for us to get pictures, so you will just have to take my word for it. After rounding the Boardwalk, we re-entered Epcot at mile 5.5 near Journey Into Imagination and headed through Future World West to the finish, back in the Epcot parking lot near where we started. Almost to the finish. . .
We were certainly not running for a PR, as we were treating this as a warm up for the Marathon. Still, we passed a lot of folks making a quite leisurely jaunt of it, mostly all Dopey runners. As a result, there was a lot of weaving in this relatively short run. 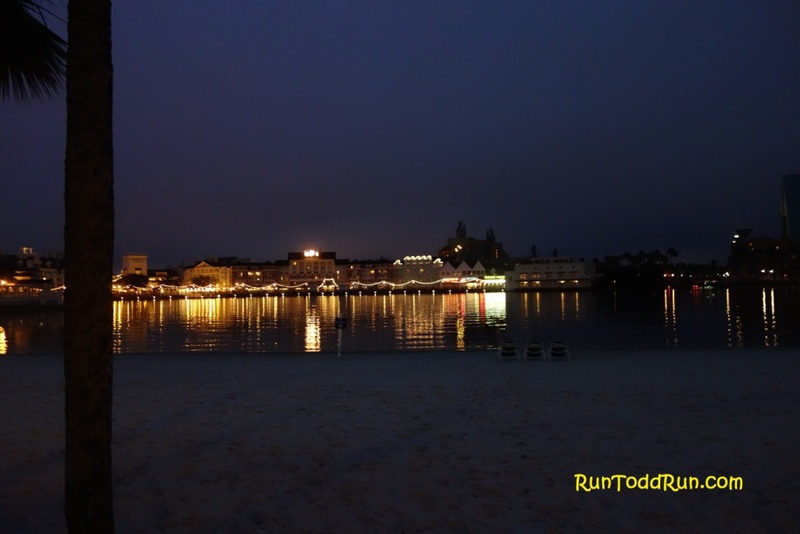 However, I did enjoy running in the dark, enjoying the lights of Epcot and the Boardwalk area. It really made for a unique experience. Overall, I liked the race, and would probably do it again, even knowing there will be more walkers than usual due to the Dopey runners taking it easy. This entry was posted in Uncategorized on January 21, 2014 by jtspurge. 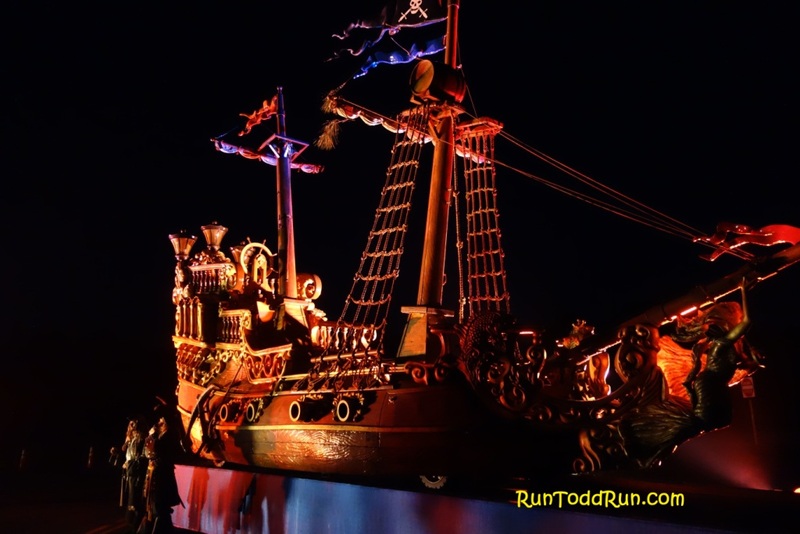 Last year we ran the 2013 Walt Disney World Marathon as our first Marathon, and to say it did not go well is an understatement. The first half went according to plan. However, at about mile 15 I stopped sweating and it went downhill from there. Our final time was almost 6 1/2 Hours. Immediately after the run, I swore off marathons. However upon further reflection, I decided I was not going to let the Marathon win. 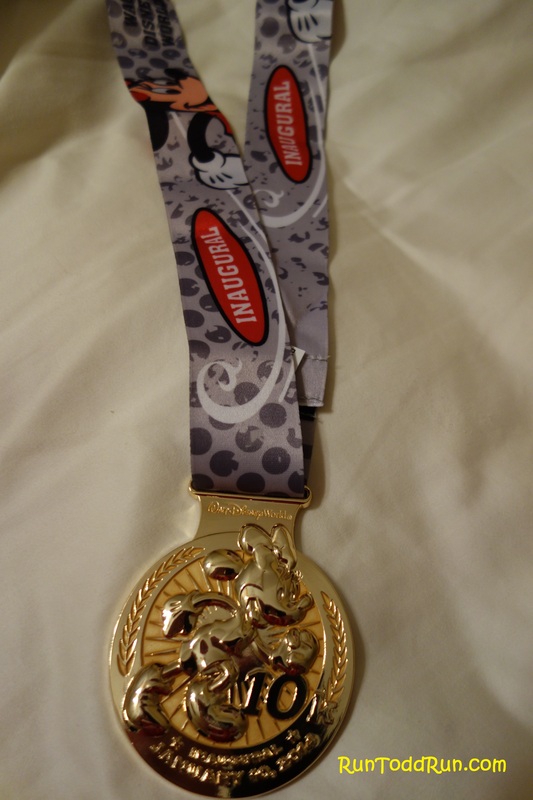 So, we signed up for the 2014 Walt Disney World Marathon, which I dubbed my redemption Marathon. This is the story of that Marathon. 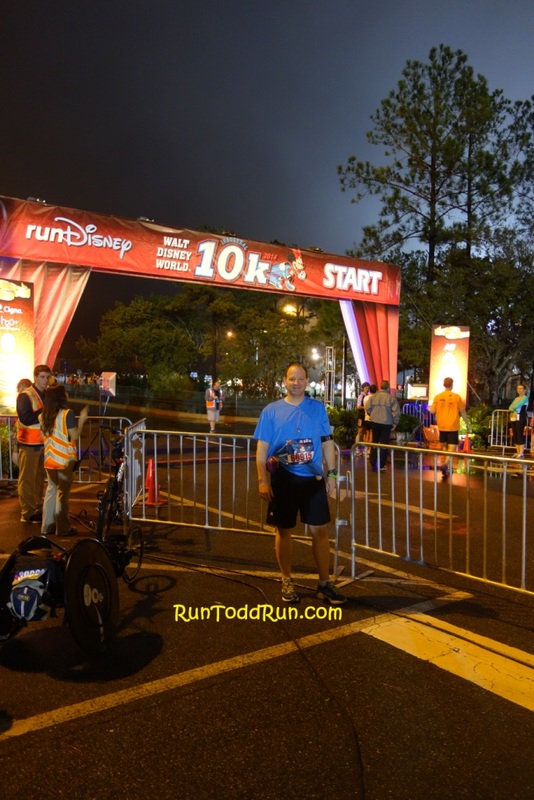 (My WDW 10K recap will come soon). I did not change a whole lot heading into this race, except our last two long runs were better than our last two long runs last year. Also, I switched to eating raisins during my long runs instead of gels. I think that made a big difference. Most importantly, the weather this year was almost perfect. Our 2:30 am wake up brought us temps in the mid 50s. As usual we took one of the first monorails to the Race Retreat outside Epcot. This year, there were 16 corrals instead of the 8 the year before. This seemed to make the cattle drive to the start line much smoother. 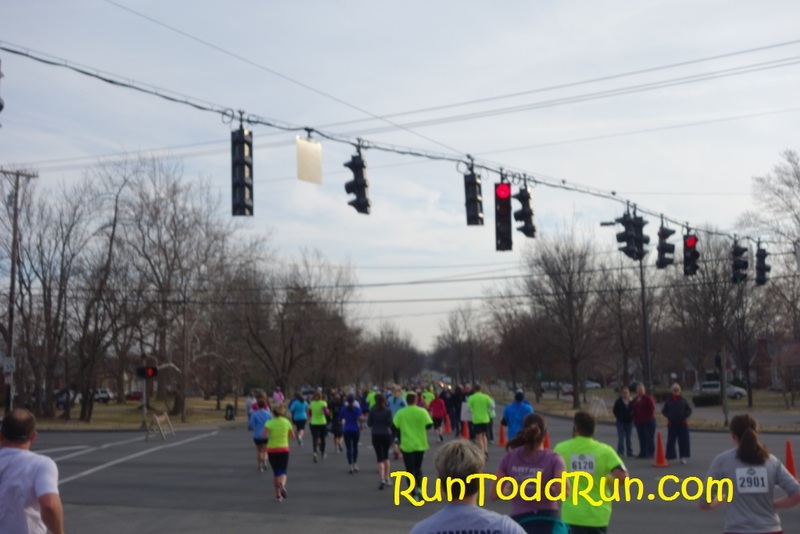 It also seemed to thin out the course in the first few miles. Not so much in the narrow miles from 6-8 though. 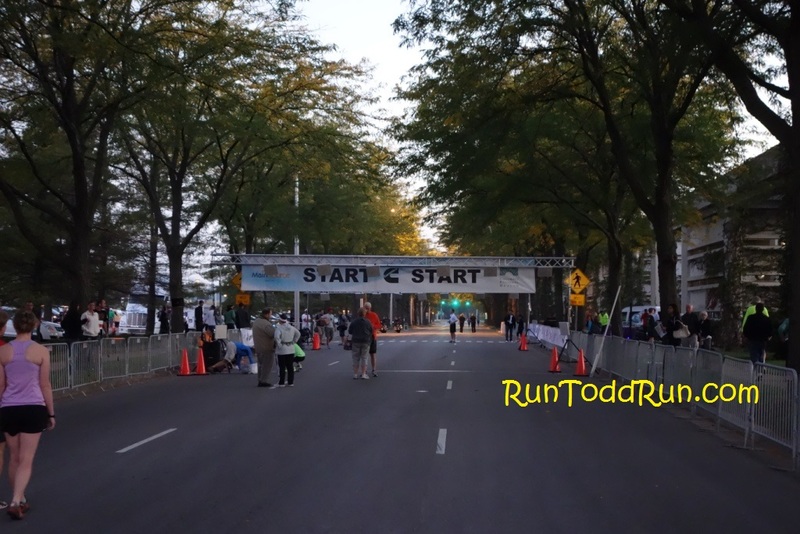 The race started at 5:30 a.m. We were in corral K, so we crossed the start line about 35 minutes later. 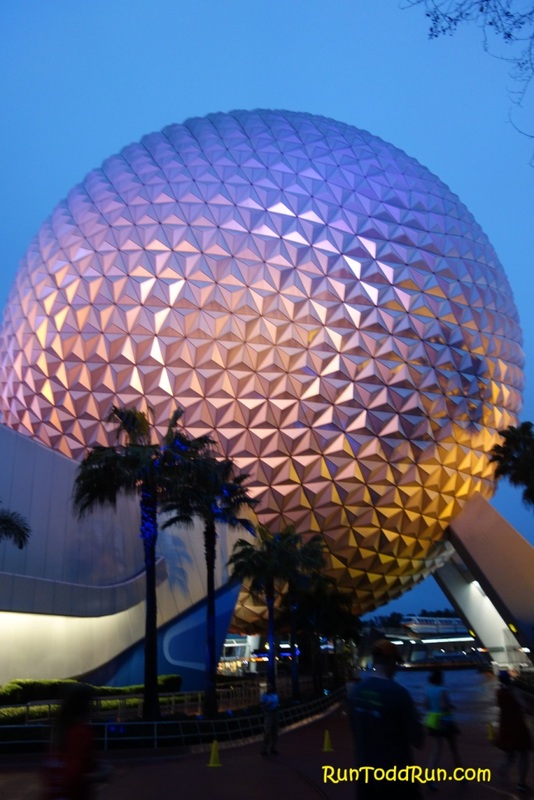 We left Epcot and headed to the Magic Kingdom. 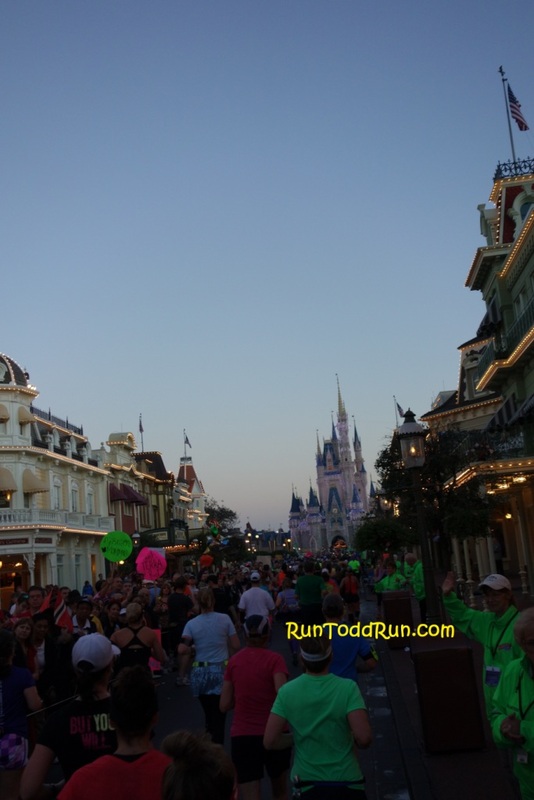 Just past the 5 mile mark, we entered the Magic Kingdom and headed up Main Street, probably the most magical part of the run. Then, it was through Tomorrow Land, along Fantasy Land, and through Cinderella’s Castle – another highlight of the run. Things were going according to plan at this point. First character stop on World Drive – Pirates! 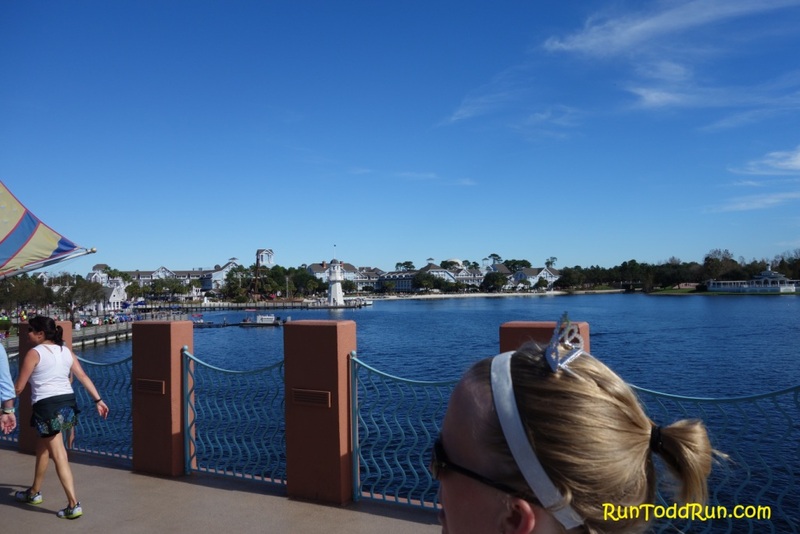 We then headed out of the Magic Kingdom through Frontier Land and made our way through the narrowest part of the course toward the Grand Floridian. 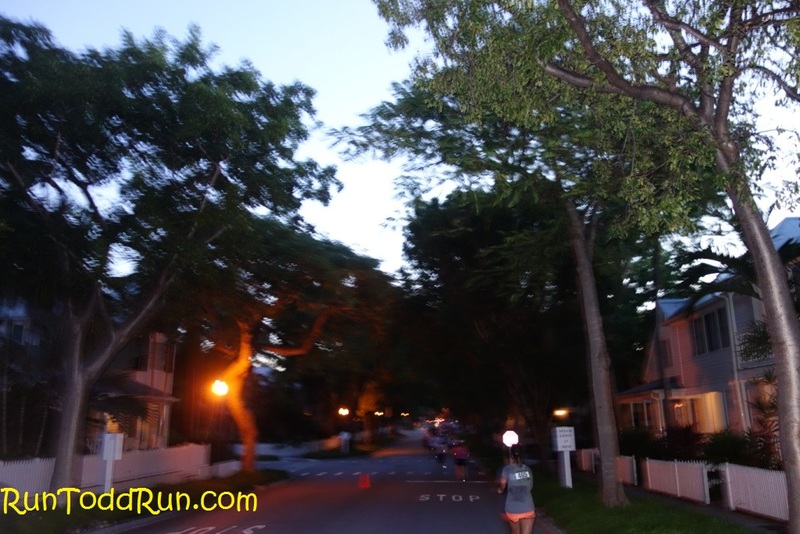 This is where we first met up with the 5:30 pace group, running 5 wide on a narrow part of the course. When they stopped to walk, they stayed five wide. It was either a bulldozer running up on you from behind or a slow-moving wall in front of you. 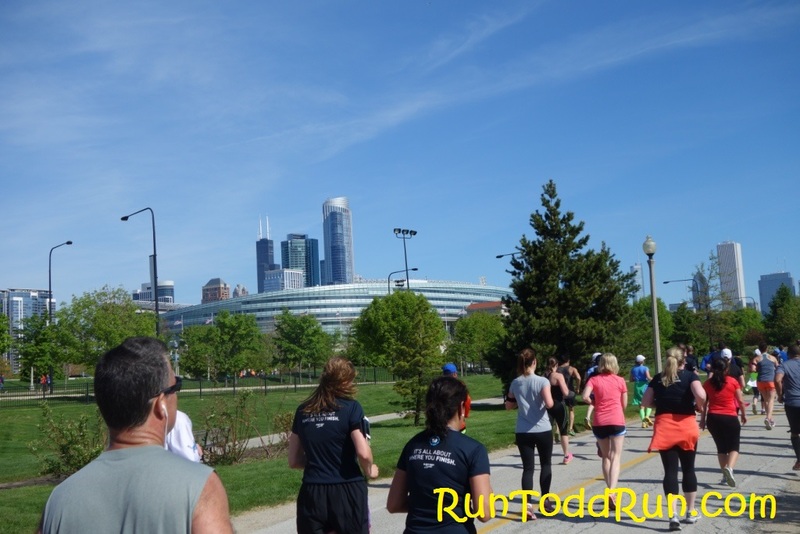 We do the run/walk as well, but at least we know to go single file when we walk and try not to run more than two-wide. We kept up our pace to get clear of the group. 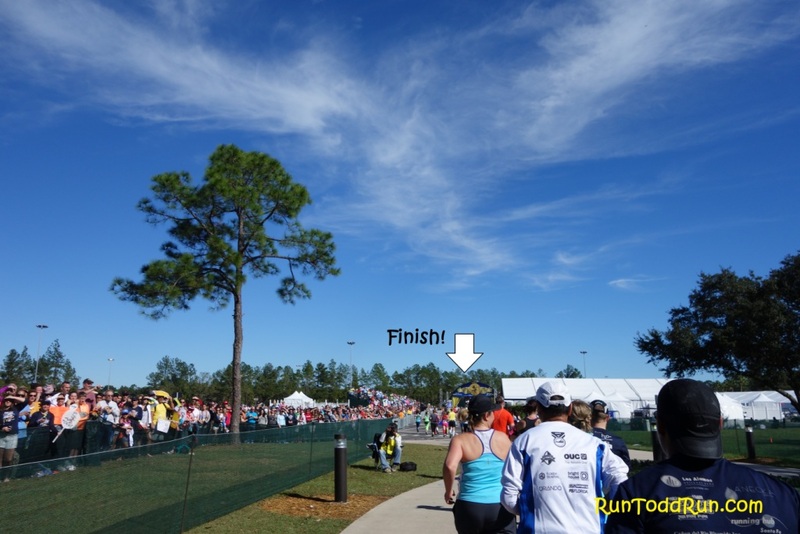 Then, we ran past the golf courses and entered the Walt Disney World Speedway just after mile 8. Once again there were race cars, exotic cars, and classic cars lining the track, and it is certainly another highlight of the run. 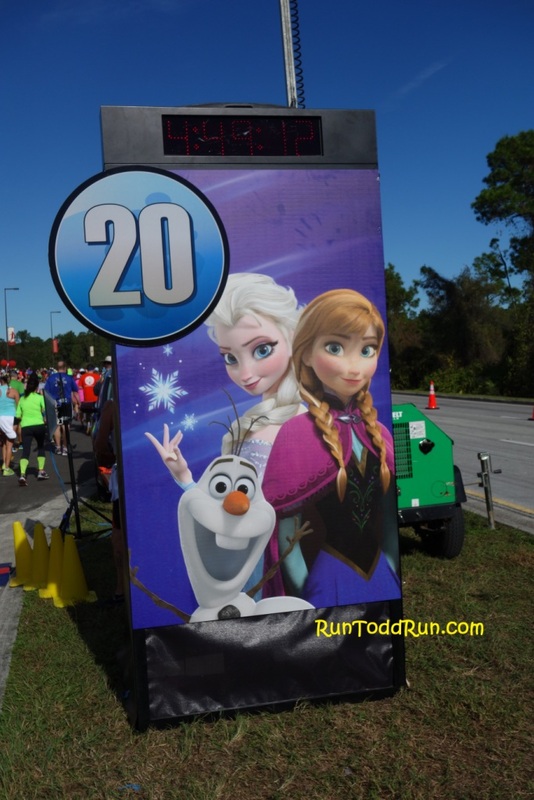 We exited around mile 9 and headed onto the least interesting part of the course which passes the trash and compost facilities on the way to Animal Kingdom at mile 12. 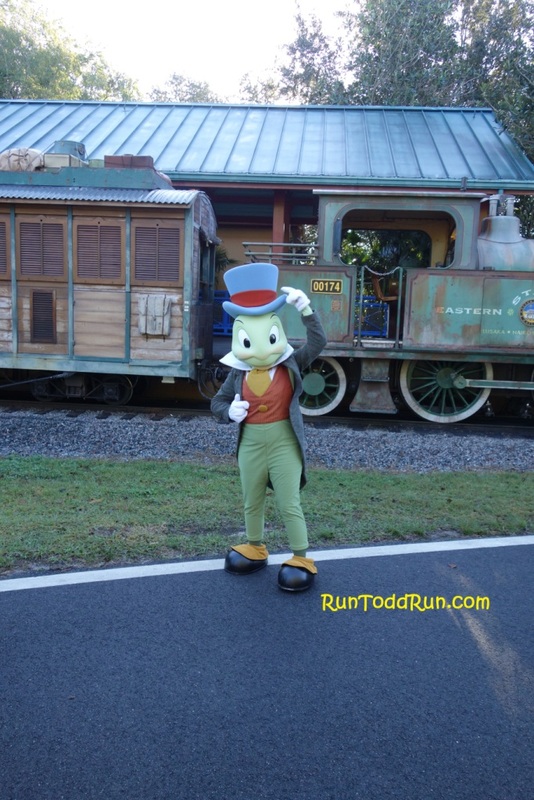 First time I have seen Jiminy Cricket! Just after we exited Animal Kingdom we passed the halfway point. I still felt good and our time was respectable. 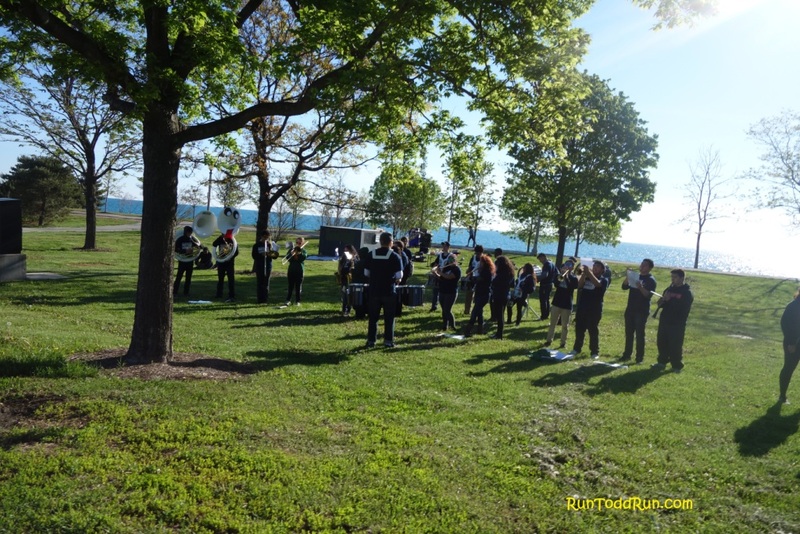 Again, the weather was certainly cooperating, which helped. However, it was just after this point last year that it all seemed to fall apart, and that was certainly on my mind. The miles from 15-20 are my least favorite, probably because that is when I fell apart last year. This is also the hottest part of the course. However, I felt OK this time around. 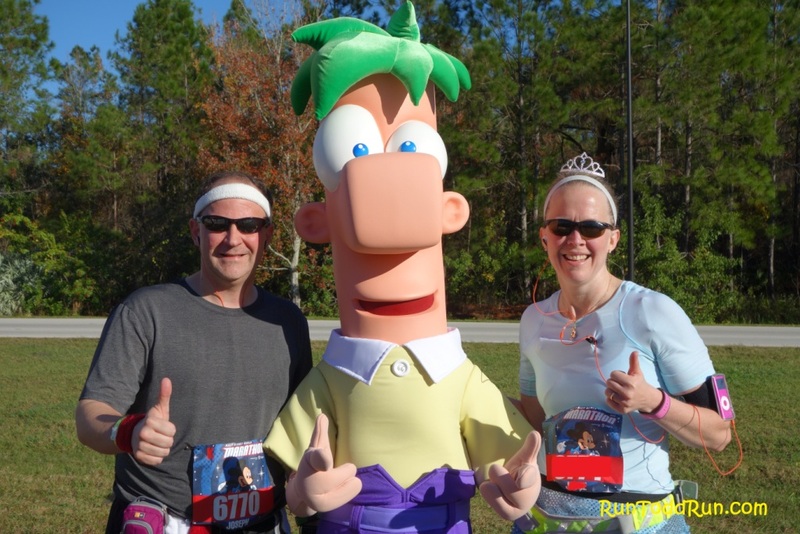 We trudged on through these miles, said hi to Ferb, and made our way through Wide World of Sports (where they handed out water-soaked towels, which really helped for the rest of the race). Unfortunately, the 5:30 pace group passed us as we exited the Wide World of Sports. Fortunately, it was on a wider part of the course. Exiting Wide World of Sports, we passed mile 20 still feeling OK, but realizing that those tell-tale signs were creeping in again. For me, that sign was the fact that my headband wasn’t wet with sweat any more. I had gone through two prior to that point, and the third was barely damp. (Yes, I carried 4 with me – I am that headband guy). As you may be able to tell from the photos in this post, I was sweating less at the end. But, we kept on and headed toward Hollywood Studios. As painful as it was at this point, it was much better than last year. As we headed to the Studios, and miles 21-23, Joyce began to struggle a bit, and we increased our walk breaks some more. Around mile 23, the lower part of my legs began to cramp in muscles I didn’t even know I had. It hurt with each step. Ironically, it felt a little better when we ran than when we walked. However, by this point we began to call it “shuffling” rather than running. Still, our walk breaks were reasonable, and I was able to keep shuffling, rather than just walking like last year. We made our way through Hollywood Studios, around the Boardwalk, and finally made it to the back entrance of Epcot. 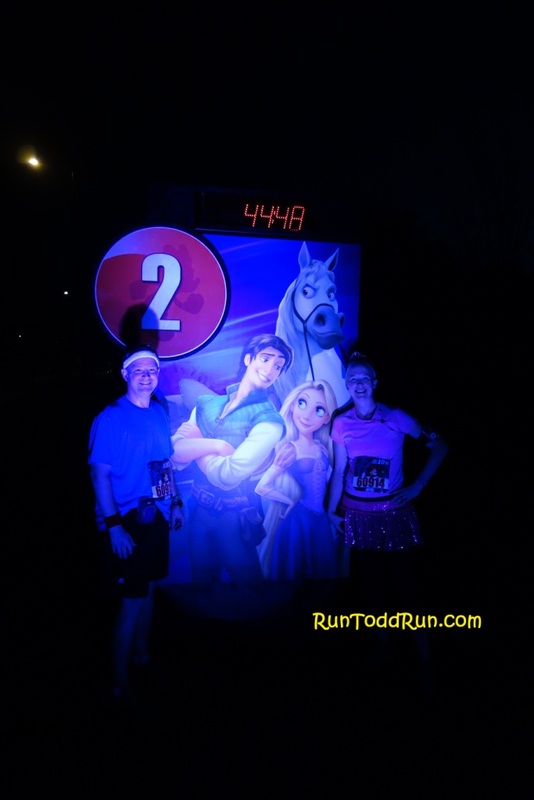 After taking a picture with Sleeping Beauty at mile 25, we made our way to the finish. That last 1.2 miles around World Showcase are the longest 1.2 miles I know of. We kept up with our run/walk and made it to the finish. End result: a personal Best that was 40+ minutes faster than last year. A sure sign the finish is near! There it is! GREAT crowd support! Mission accomplished? I think so. Do we have a faster time in us? Probably. Are we going to do it again next year? Nope. I feel OK about this Marathon, so I am OK retiring to half marathons. I’ll never say never, but I have no interest in doing it again at this point. I feel I redeemed myself from when my body failed me last year. I still had some issues in this one, but they were certainly less severe than last year. 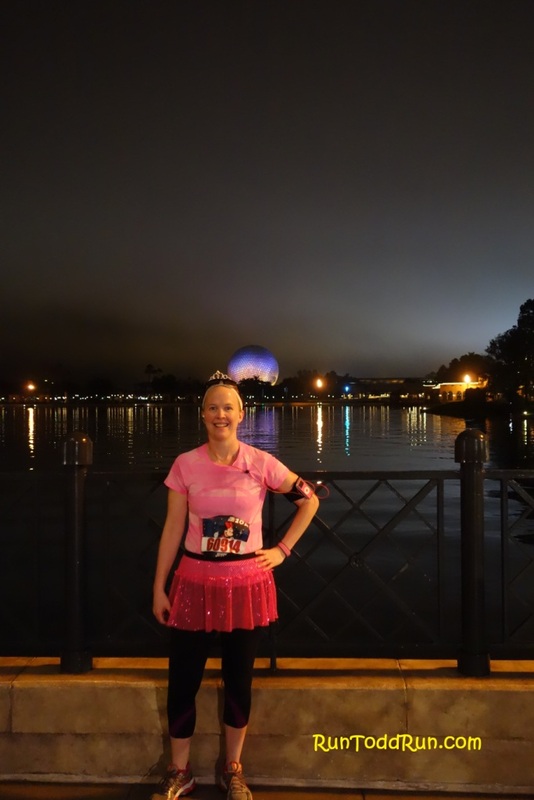 I love the RunDisney races. The courses are great, the entertainment on the courses is awesome, the crowd support is unmatched, and the volunteers are first class. Even though the run was tough, I had a smile on my face most of the time. 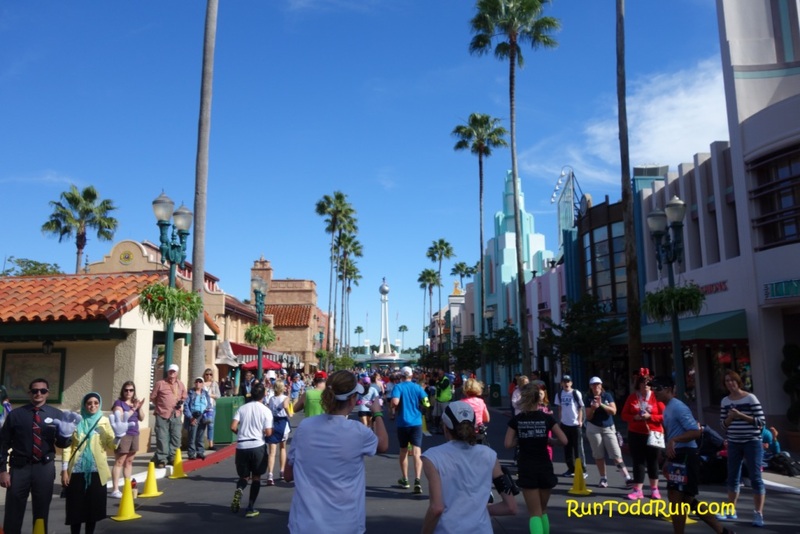 From the characters and entertainment on course, to the thrill of running through the parks, to the inspirational runners all around us, I’m not sure the experience can be matched anywhere else. I can now proudly say “I did it.” Last year, I wasn’t so proud to say that. This entry was posted in Uncategorized on January 17, 2014 by jtspurge. 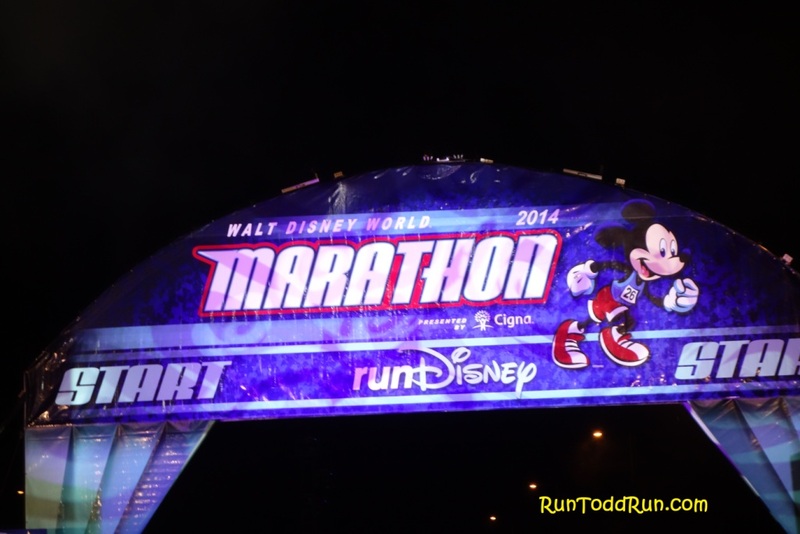 The time is near for the Walt Disney World Marathon. Most of our long runs are behind us. 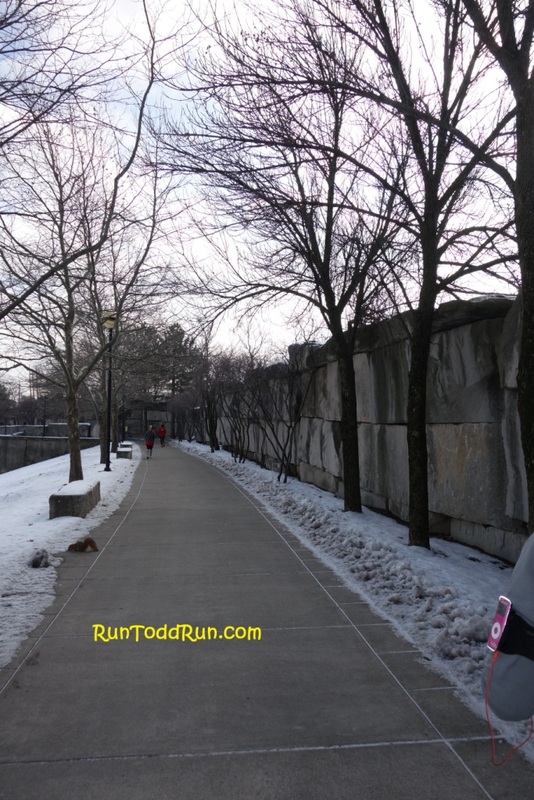 However, that last long run in marathon training is always a daunting one. You have spent so much time in training building up to this point. For me, it is almost to the point of burnout. That is why we like to use races for our longer runs as much as possible. 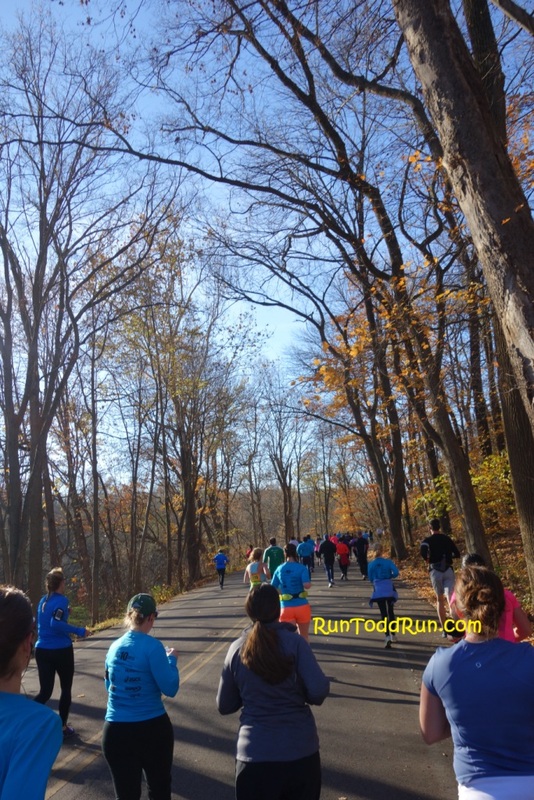 Running with a large group of folks makes it easier, and the atmosphere around a race helps with the motivation. 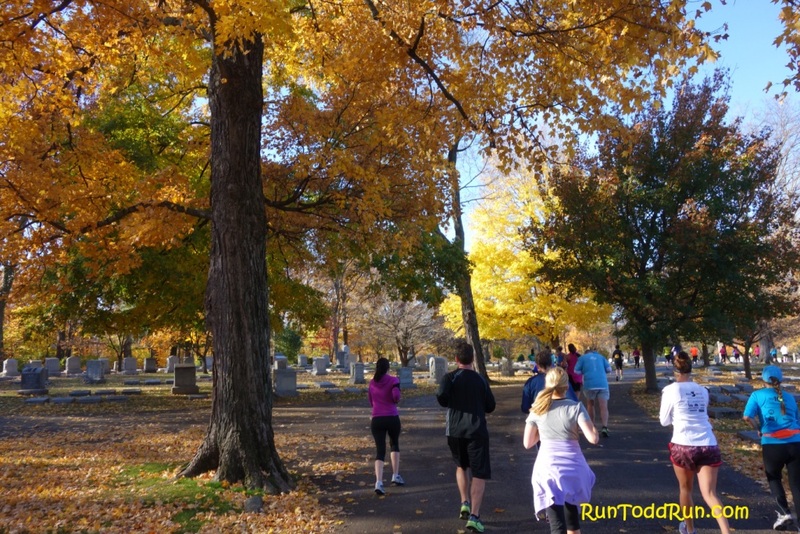 Luckily, this fall, several half-marathons have fallen in line with our scheduled long runs. 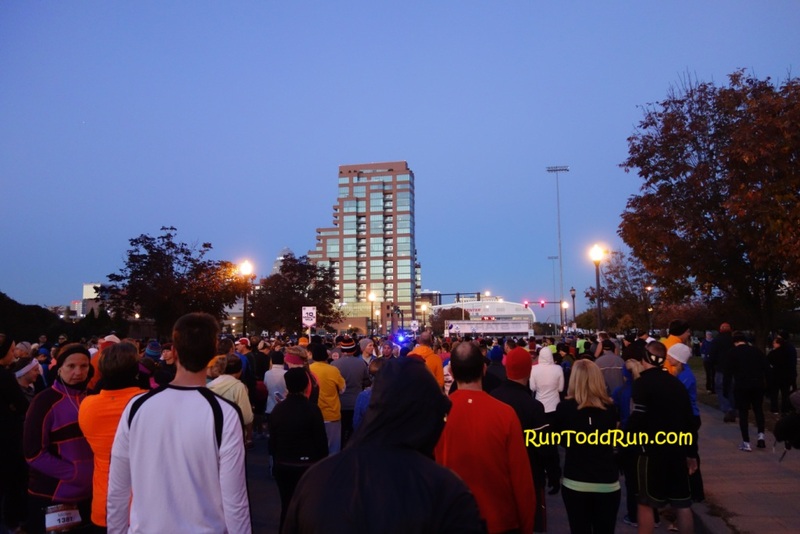 Unfortunately, we had run out of half marathons for our longest run, until I found this race in Indianapolis. It looked like it would be a lot of fun. 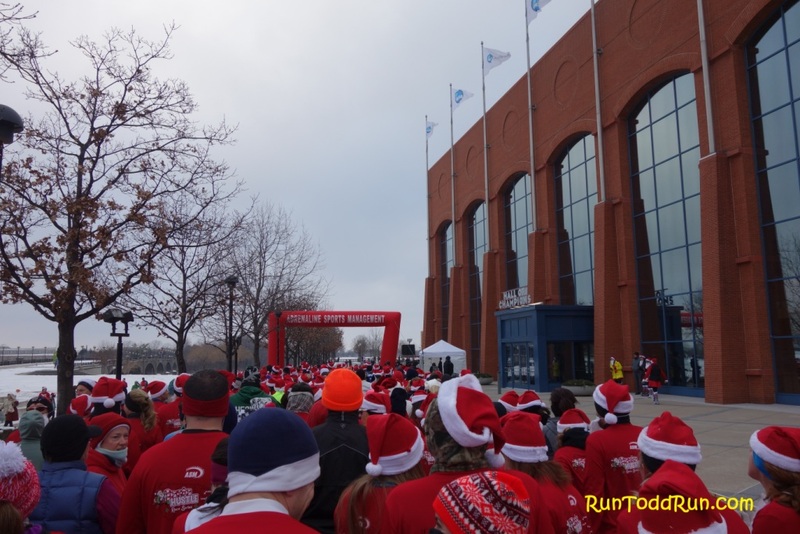 All runners received a Santa hat, beard, and tech shirt. As with any December race in the midwest, however, you are gambling on the weather at this time of year. It could be 70 or 20. Sun or snow. This year, it was 20, snowy, and windy. 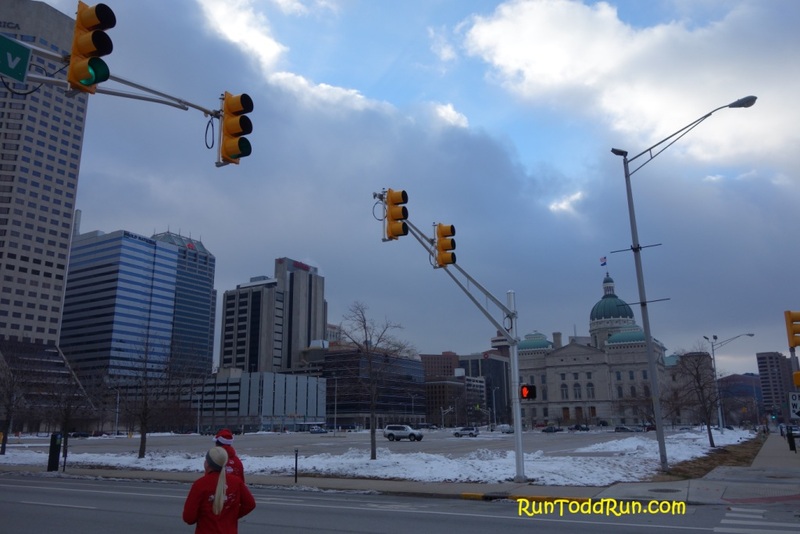 So we headed north to Indianapolis last weekend for the Santa Hustle Half Marathon. It was our 20 mile long run day, so the plan was to run an additional 7 miles after the race. 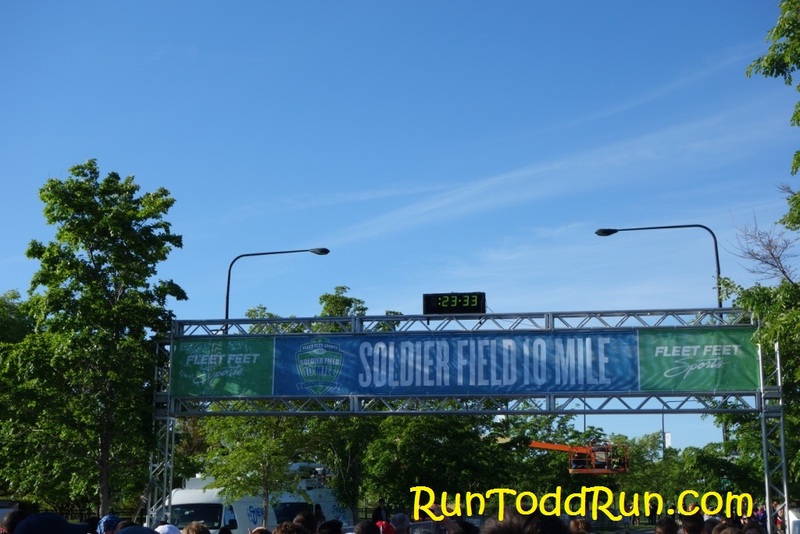 I usually like to add miles prior to a race so the finish line is actually the finish, but our schedule simply would not allow for that this time. The best I can say about the weather is that it could have been worse. It could have been a snow squall. 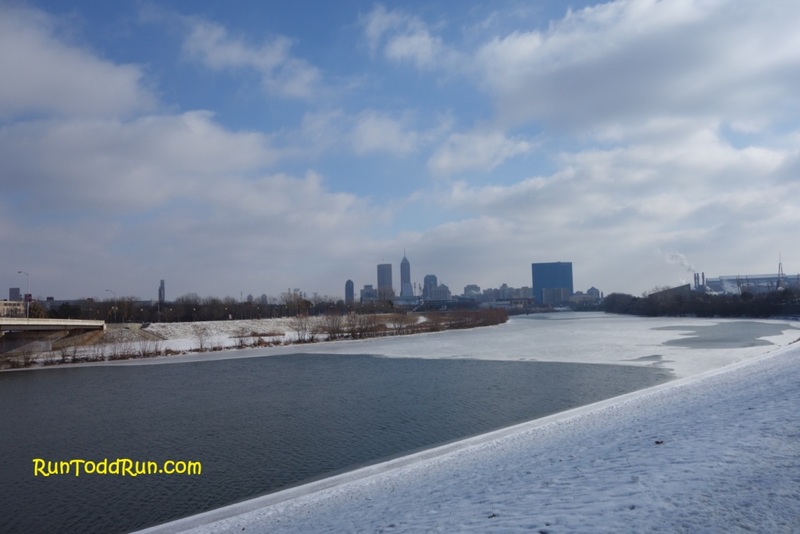 Indianapolis had just received about 5 or 6 inches of snow, and it was COLD with temps in the 20s and wind chills in the single digits. 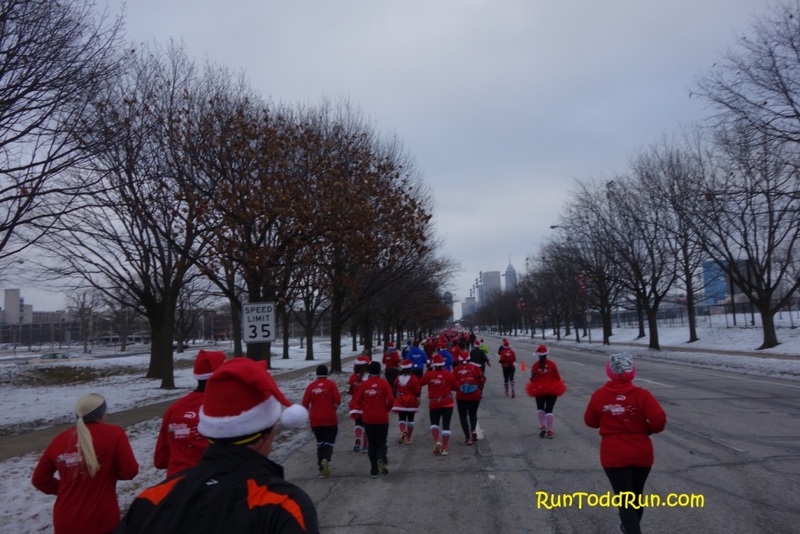 Undaunted, we set out with hundreds of Santas for our run. 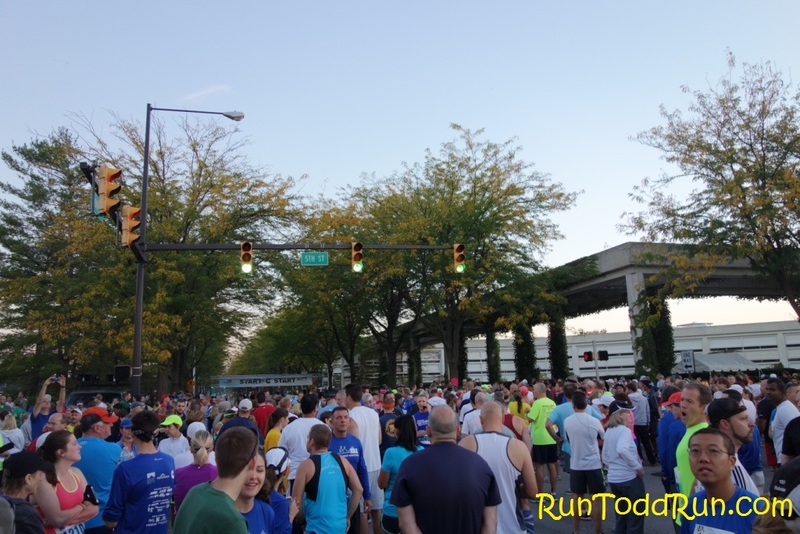 Along with many other runners, we waited until the last minute to exit the parking garage (the exit to which was fortunately right next to the start area). 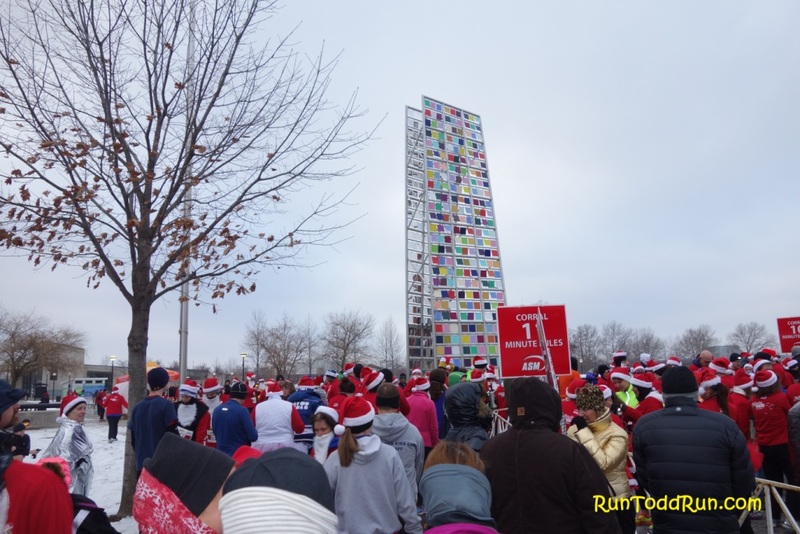 It seemed like all the runners had some sort of holiday garb on, and the mood was festive despite the cold. I couldn’t run in the beard or hat due to my sweating issues, but we did have Christmas light necklaces to wear. They had large pace signs at the start, and sent the half-marathoners off in two waves. 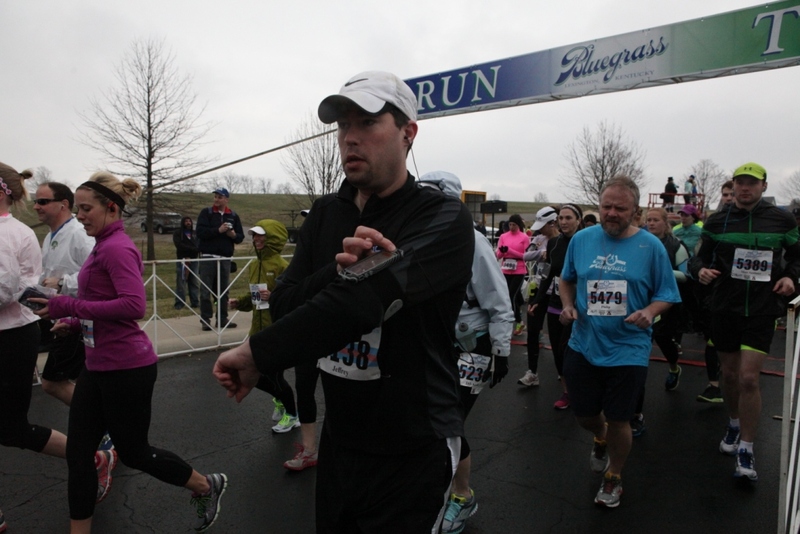 The race started right on time, and we started under cloudy skies with snow flurries and a stiff breeze. Crisp? No. Biting? Yes. 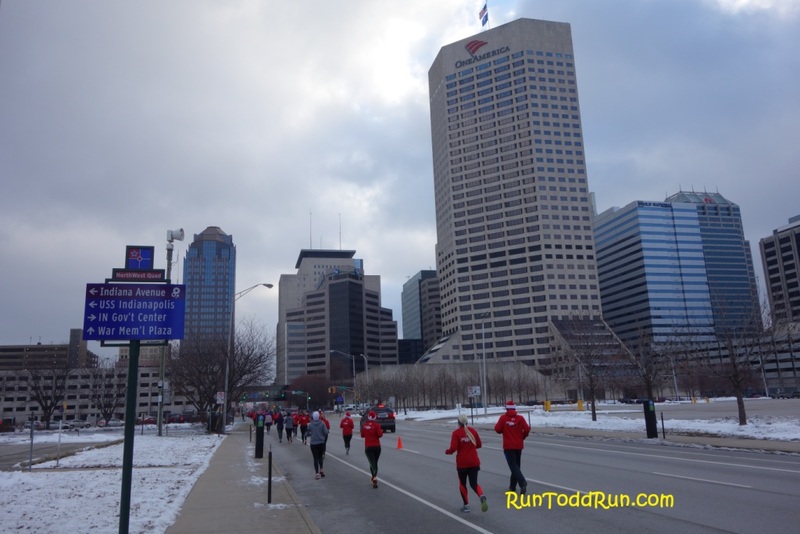 The course mostly followed the White River through Indy, but did make a detour at the start into downtown. 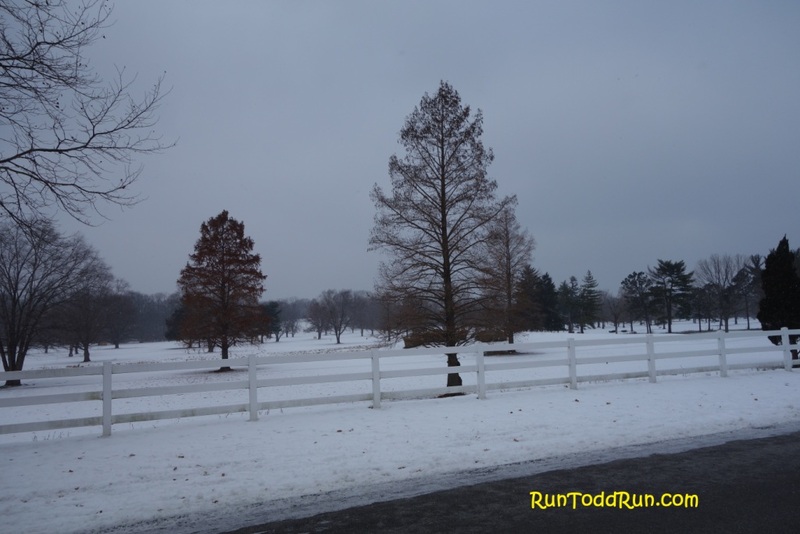 With the snow on the ground, it was a very pretty, although cold, run. Did I mention it was cold? 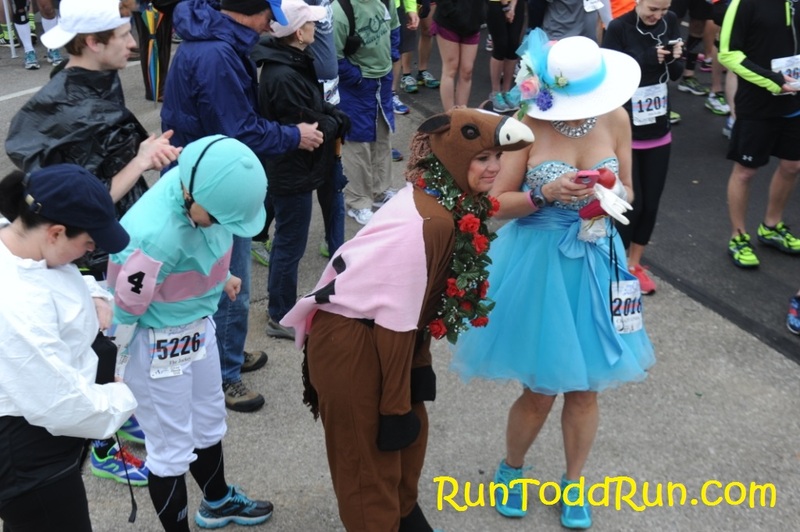 Luckily, we were dressed for it, but it certainly added an interesting aspect to the race. They had plenty of water stations, and the Gatorade slushies were a nice, although unintended, addition. Any liquid left out for more than a few minutes froze. 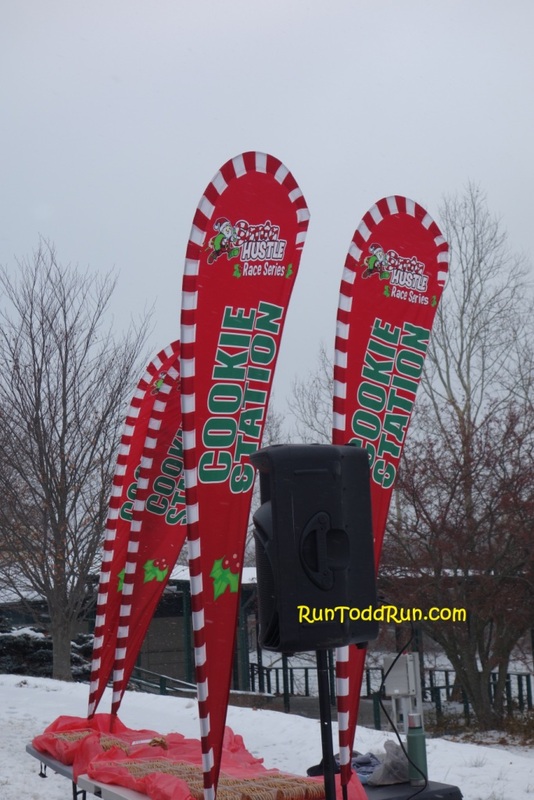 Each water station had Christmas Music playing, and they also had a candy stop and cookie stops along the course. Taking the M&Ms at the candy stop was not the best decision I have ever made. (Taking them again at the finish was also a poor choice). After leaving downtown, the race headed back toward the White River and generally followed roads around White River State Park. Cookie stop with Christmas music! 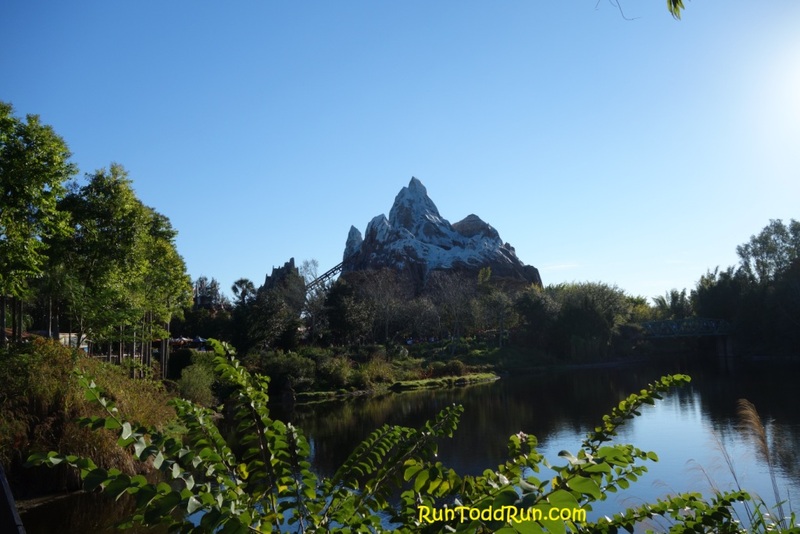 Since this was designed to be a long run for our WDW Marathon training, we were not running for time. That being said, we both wanted to get it done so we could get out of the cold. It seemed no matter which way be turned, the wind was in our faces. I really commend the volunteers and police officers who stood out in the weather all day long with smiles on their faces. 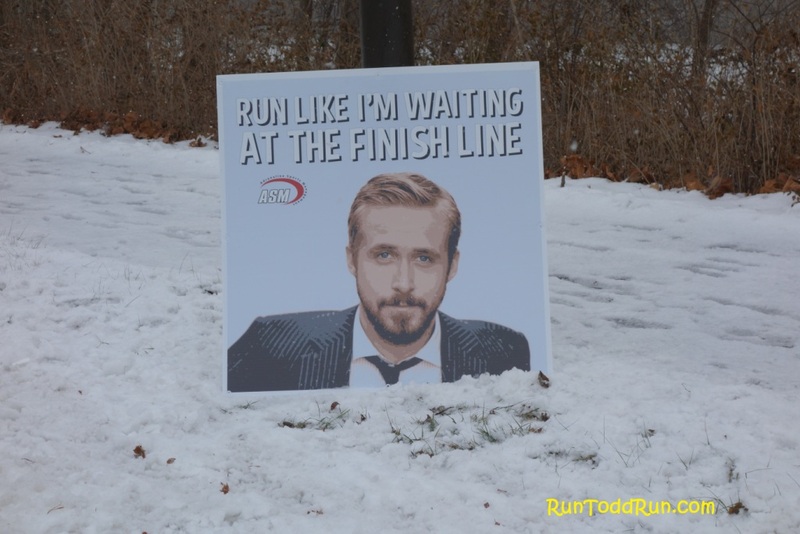 They even had unique motivational techniques for those struggling in the cold. Didn’t do much for me, but several ladies did pass me after this. . . The sun finally started to make an appearance around mile 9 or so for brief periods. When it did, it certainly made a difference. Heading back along the river, we had a nice view of the Indy skyline. It was nice to be able to see the general area of the finish line from a few miles out. “We just have to make it to that building.” I avoided telling my wife at mile 10 that rather than almost being done, we were only halfway through the day’s run. Nothing good would have come of that. Finish area is by the square building on the right. The last few miles followed the banks of the White River and closed out the loop back at the same place we started. 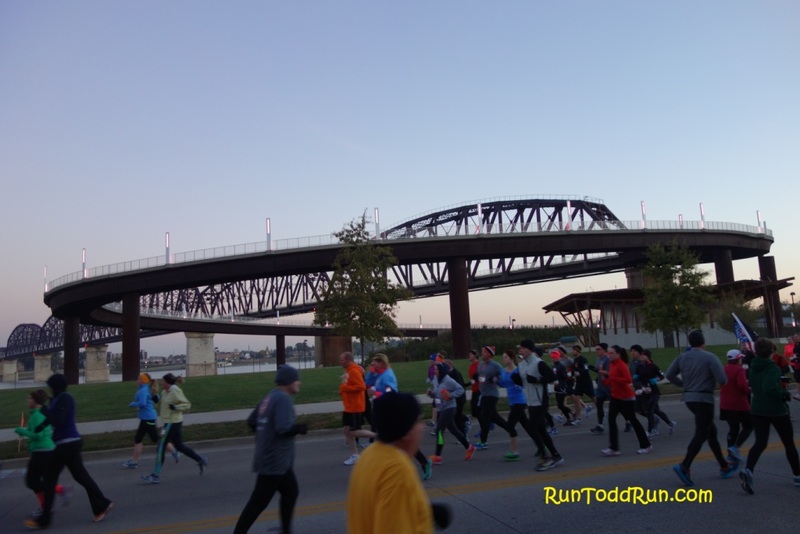 In the last mile or so, we ran behind the Indy Zoo, where the large limestone walls provided some cover from the wind, and crossed a bridge back over the river to the finish of the half. Again, we weren’t running to break any time records, but we finished with what I would call a respectable time for a long run. We crossed the finish line and headed to the car for a short break to warm our hands and to change ear warmers (for me). After that, we waddled back to the start line to get started on the remaining 7 miles of our run. I had no idea how I would do it due to the way I was feeling, and feeling how cold it felt when we went back out. We ran back up the last few miles of the course a couple of times, and remarkably, we did pretty well. It did not get any warmer, and the sun disappeared, but we completed our 20 miles. 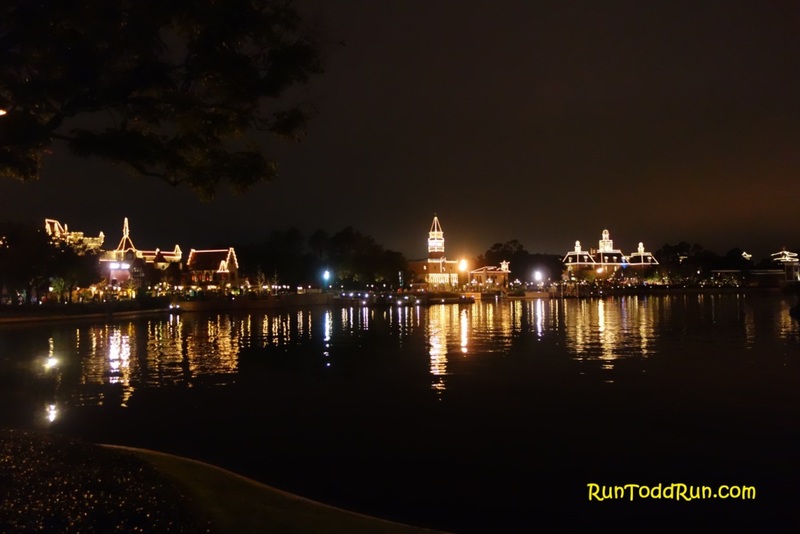 Now it is on to the taper for the WDW Marathon. 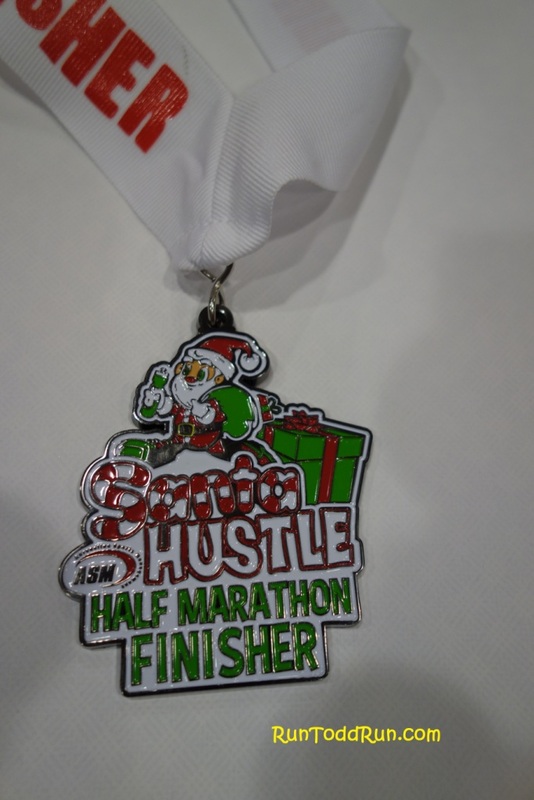 Overall, I liked the Santa Hustle. It would have been a lot more fun if it was just a 13.1 mile run for us, or if the temps even sniffed 35 or 40. However, the mood was really upbeat, and all the Santa outfits were really cool. 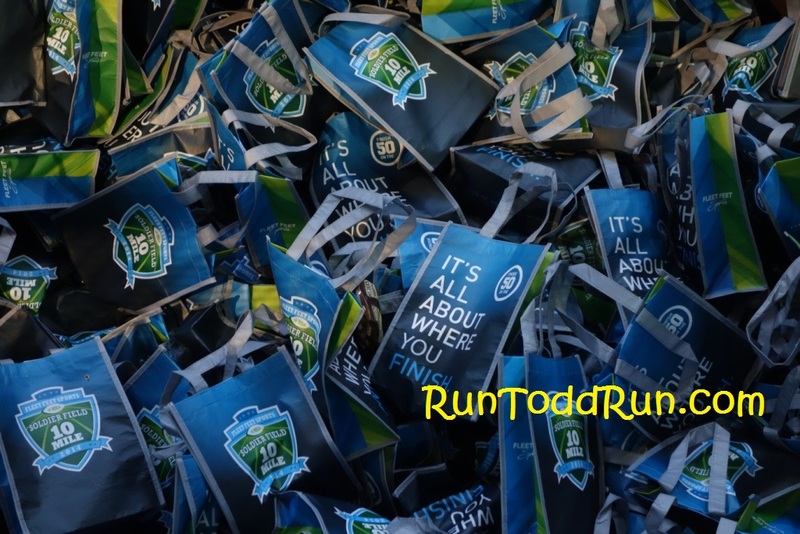 Best of all, the organizers shipped race bibs and packets ahead of time if you requested it. That saved us a trip to Indy. 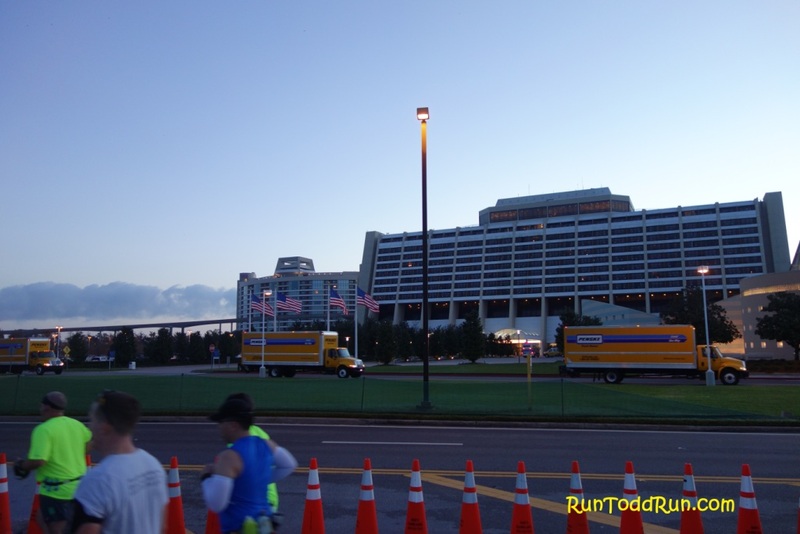 Now, it’s on to Disney World and the redemption shot at the WDW Marathon. Hopefully, the weather and my body cooperate this year. This entry was posted in Uncategorized on December 23, 2013 by jtspurge. 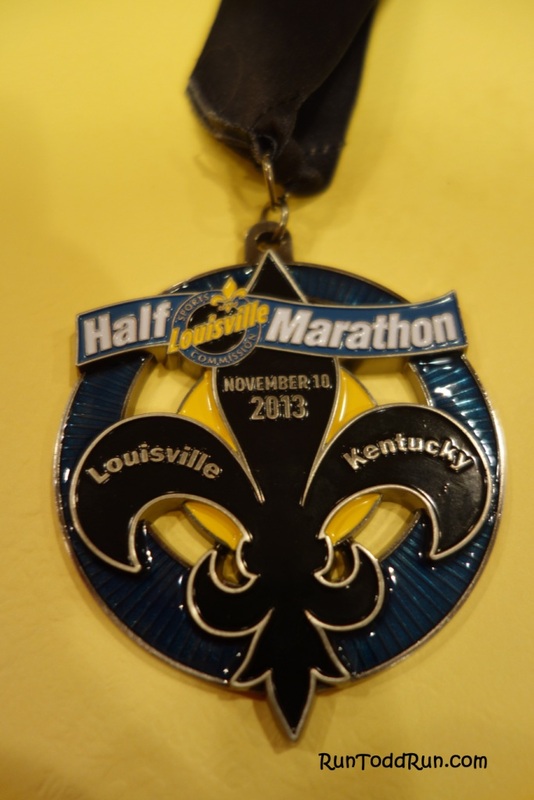 The Louisville Sports Commission Half Marathon was supposed to be the 12th Half Marathon Joyce and I had run together. In fact, neither of us had run a solo half marathon. 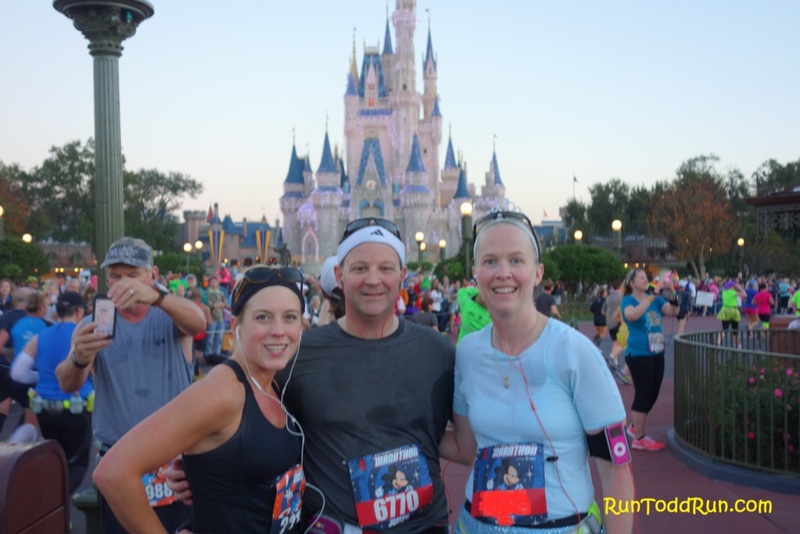 Two weeks earlier, we had run the Big Hit Half Marathon, adding in a few miles to fit in 15 miles on our training for the Walt Disney World Marathon. Our plan was to add in 4 miles before the LSC Half Marathon to get 17 miles in for our long run. However, nothing went as planned. The night before, our oldest started having serious stomach pains. That ended with a trip to the ER later that evening. We were hoping it was a quick fix. Not so much. He was up most of the night, and Joyce and (to a lesser extent) I got very little sleep. Late into the night, we were both determined to make the race the next day. We had arrangements for our sitter to arrive at around 6:30 so we could leave early to get in the extra 4 miles. However, the oldest was still having spasms well into the early morning. We couldn’t leave the sitter with him like that. So Joyce decided she would stay home with him. However, by the time we decided that, it was too late to call the sitter, and she was greeted at our door with $20 for her trouble, and she got to go back to bed. Now, what to do about the race? Well, I am a horrible father. At almost the last minute, I decided I would still run the race. I am still not sure exactly why. 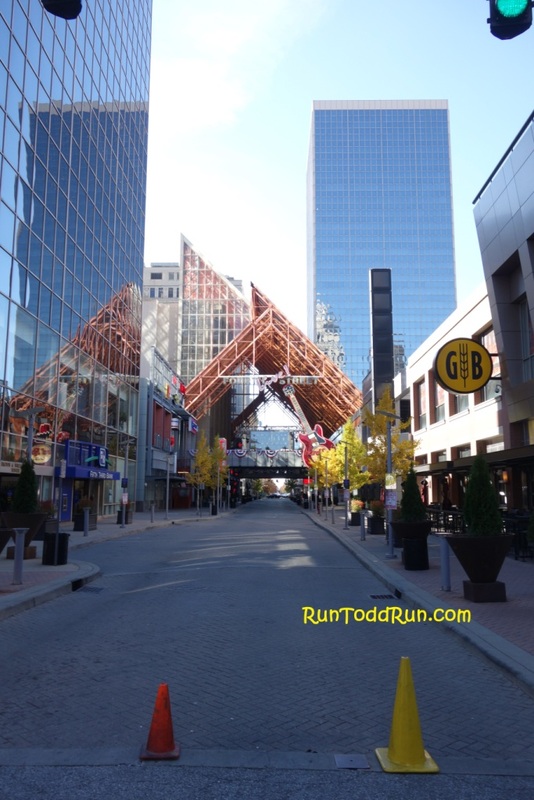 Regardless, I got dressed and headed over to Louisville for the start of the race outside the KFC Yum! Center. I got there just in time to get in line near the very end of the runners. 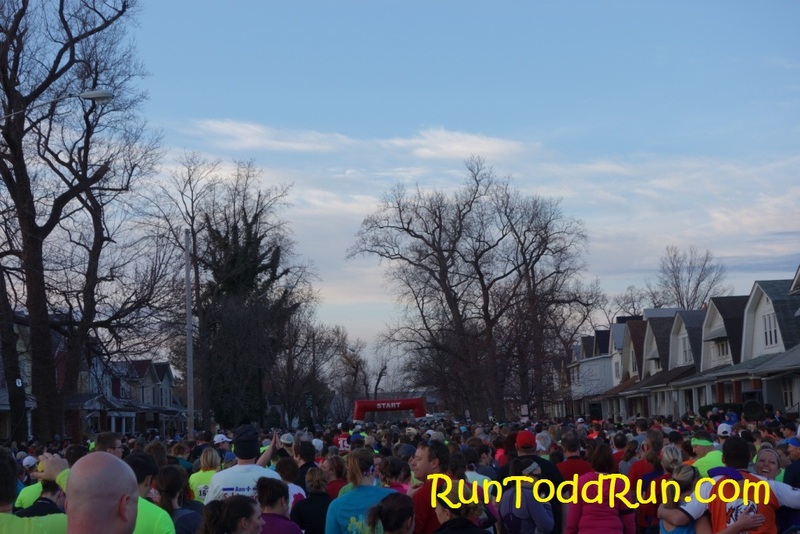 There was no reason to be in the middle of all the folks, as I had no plan for this run at all. 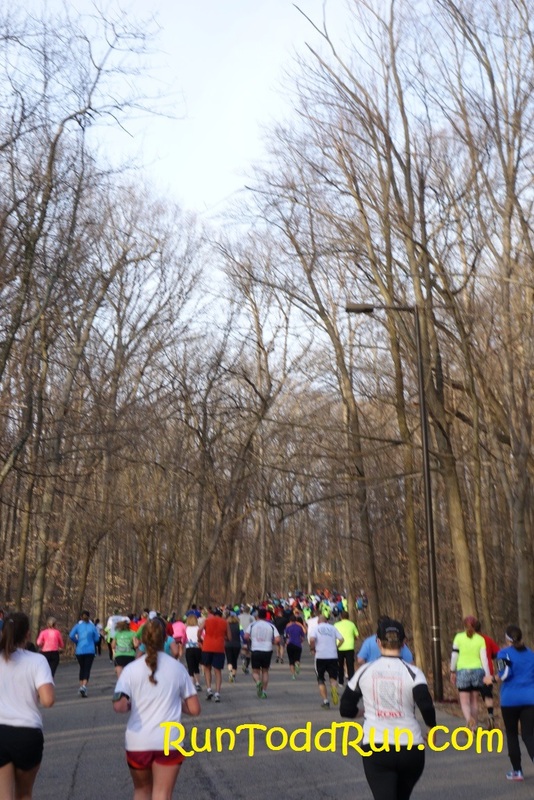 There was a nice crowd for this race, and it was a perfect day for a run. Before I knew it, we were off. I settled into a comfortable pace, determined to keep it consistent. 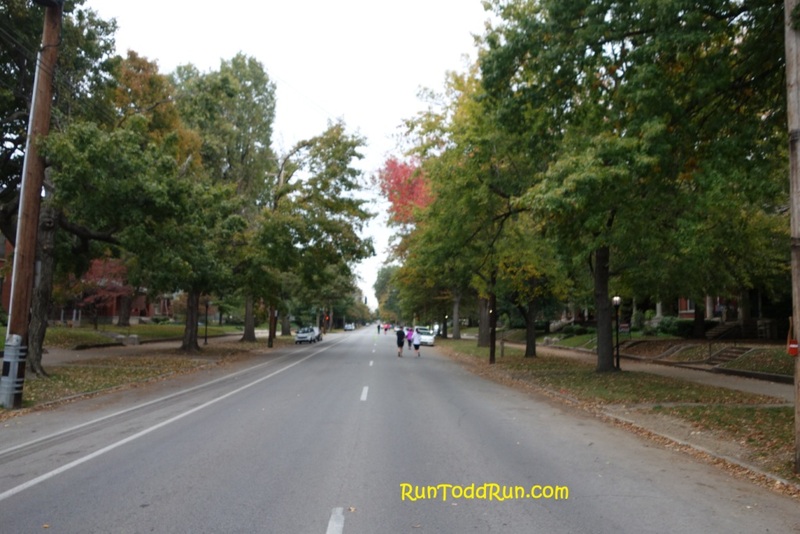 The course heads out of downtown Louisville toward Cherokee Park. The park portion of the course is gorgeous in the fall. It is rather hilly, but is my favorite part of the course. 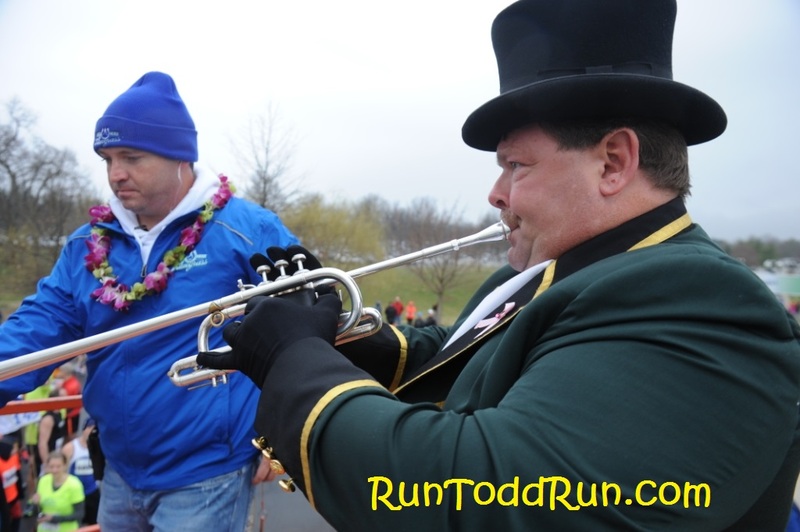 There was some pretty good crowd support and bands along the course as well. The views in the park were gorgeous with the fall colors and vistas at the top of the hills. The best part about the hilly park portion is that there is a nice long downhill section coming out of the park. 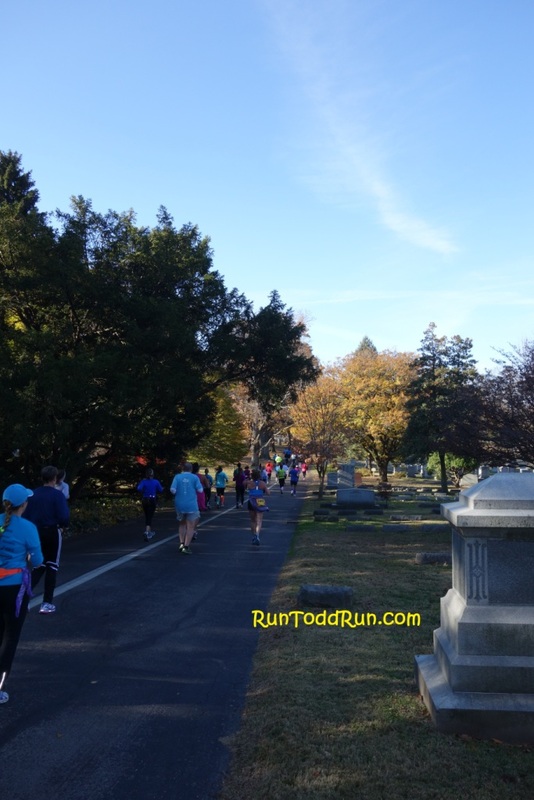 A highlight of the course was a new section that was added this year that took the runners through Cave Hill Cemetery just past the halfway point. 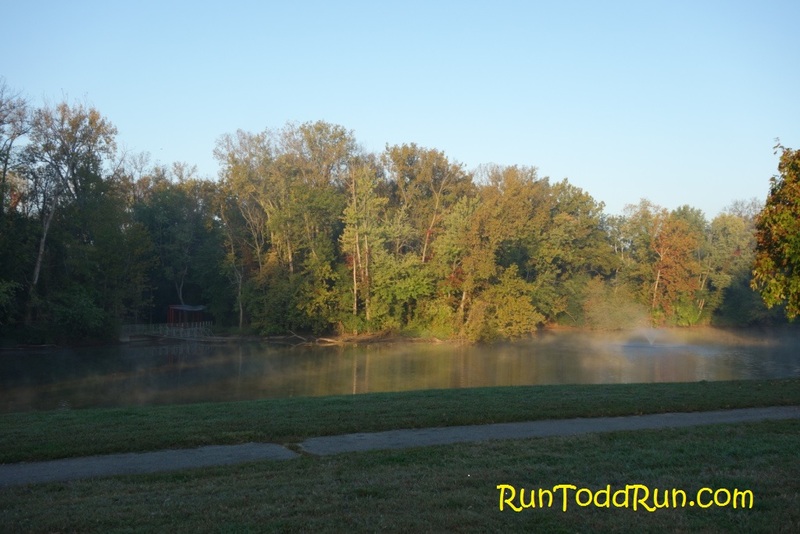 This part of the course was definitely a great addition, and added to the beauty of the run. I exited the cemetery just before mile 8. 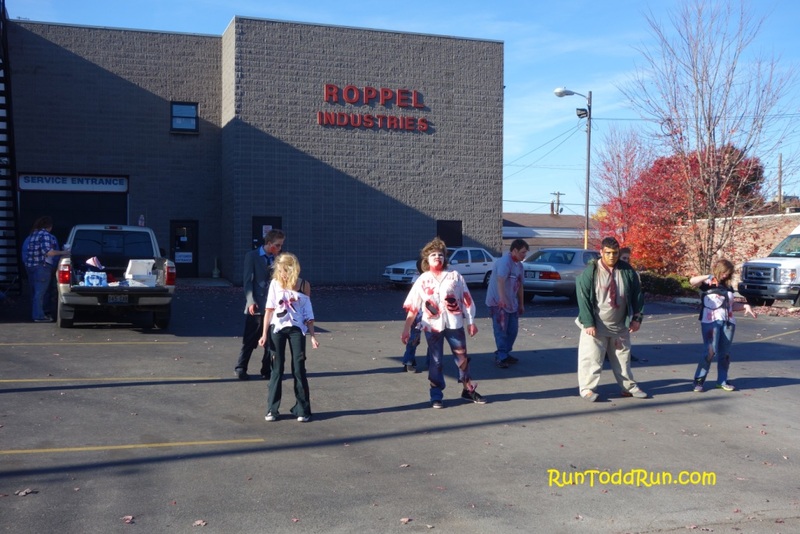 Just outside the cemetery exit, a group was dancing to “Thriller” in full character. At this point, my pace was well ahead of my personal best, and I was feeling pretty good. I was getting my hopes up that I could smash that PR. 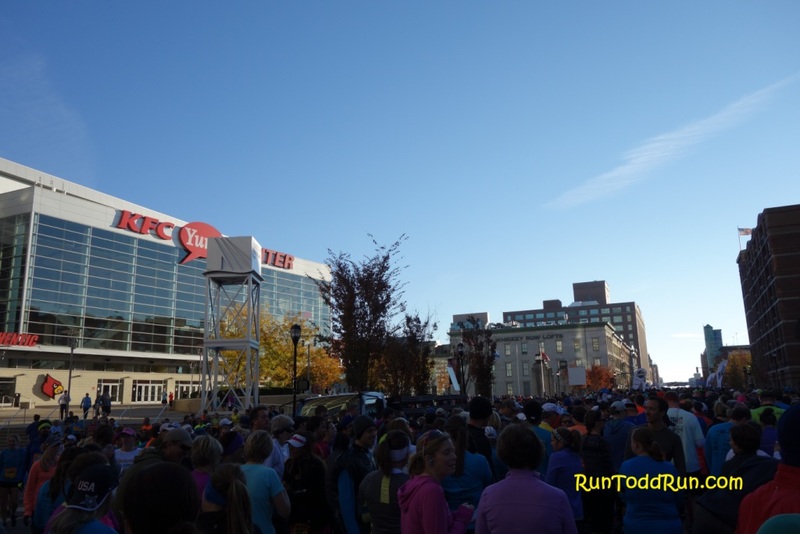 However, since I was running a bit behind arriving for the start, I had neglected to use the restroom. Holding it was no longer a comfortable option. Luckily, by mile 8, the restroom lines are relatively non-existent. Mile 8 was a bit slow as a result, but I knew I would be much more at ease heading to the finish. 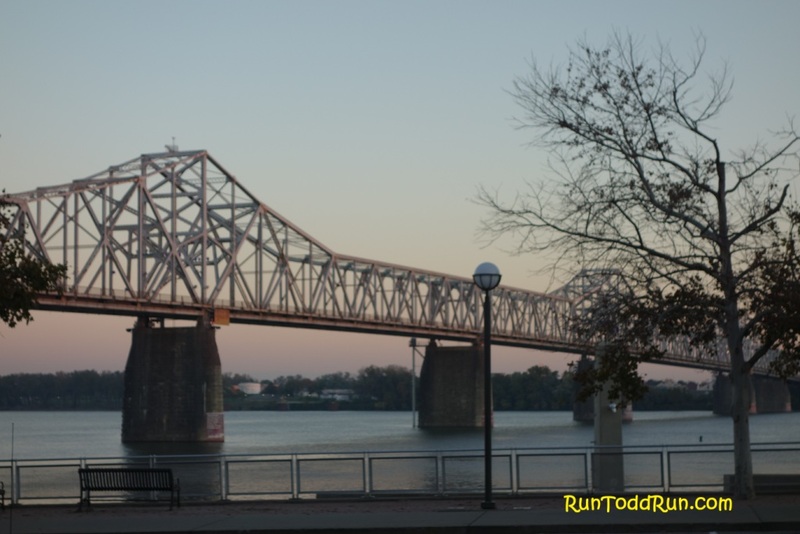 At this point, the course heads back toward downtown Louisville for the finish. 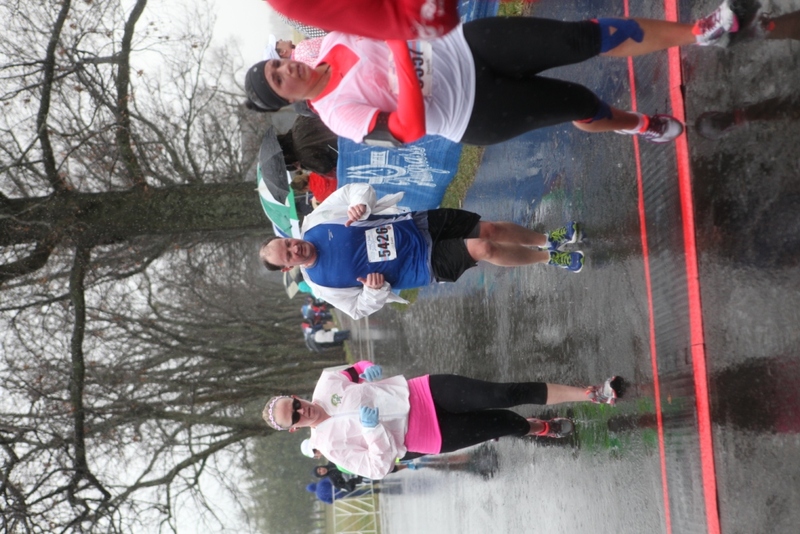 Last year, it started to rain/sleet rather heavily at this part of the course. 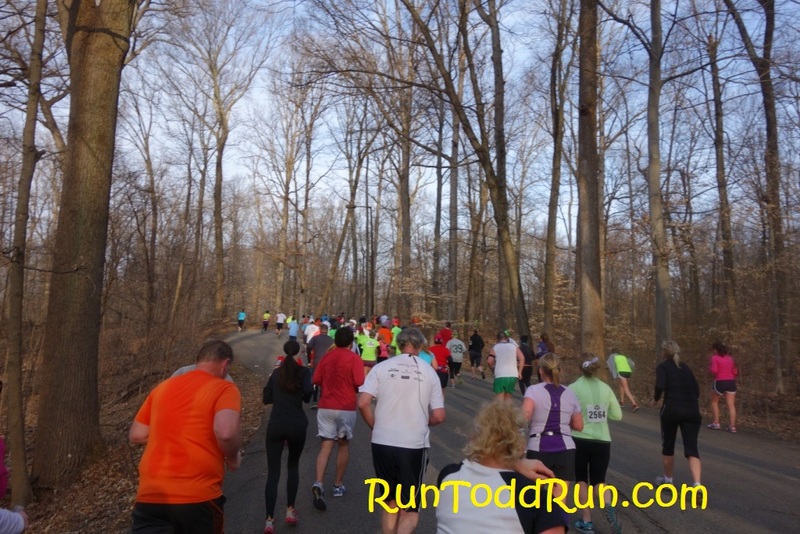 This year treated the runners with perfect weather. 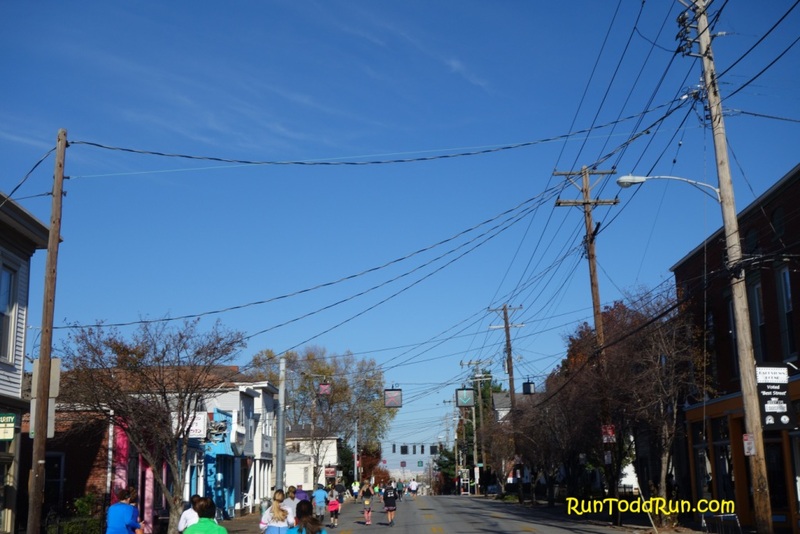 They tweaked the course this year, adding an out-and-back portion between the 11.5 and 12.5 mile points. I think that was the longest mile I have run in a long time. As usual, I was still feeling pretty good at mile 10, and was well ahead of PR pace. However, as usual, at about mile 11, that good feeling began to fade. To top that off, an out-and-back at this point in a run is a bit depressing. You get to see all those people ahead of you that are heading to the finish, and you keep wondering where the hell that turnaround is. I hit the turnaround, still ahead of PR pace, but I was certainly beginning to struggle. My legs were rebelling. However, from that point, I could see the finish area, and once you get past the turnaround, you are on the positive side of the out-and-back, seeing all the people behind you. Being that I started shotgun on the field, it was nice to see all the people I was able to pass in the race. That did not help my legs much though. The last couple of miles were well off my pace for the rest of the run. I had to take a couple of extra walk breaks between miles 12 and 13, which I never like to do. Usually, we skip the break during that mile. After one last short break, I powered toward the finish. The time was not what I had been hoping for, but I was still able to beat my previous PR by over two minutes. It was probably the most disappointing PR ever. Not because I could have gone faster (I think I could have), but because it was MY PR. Up to this point, it was OUR PR. 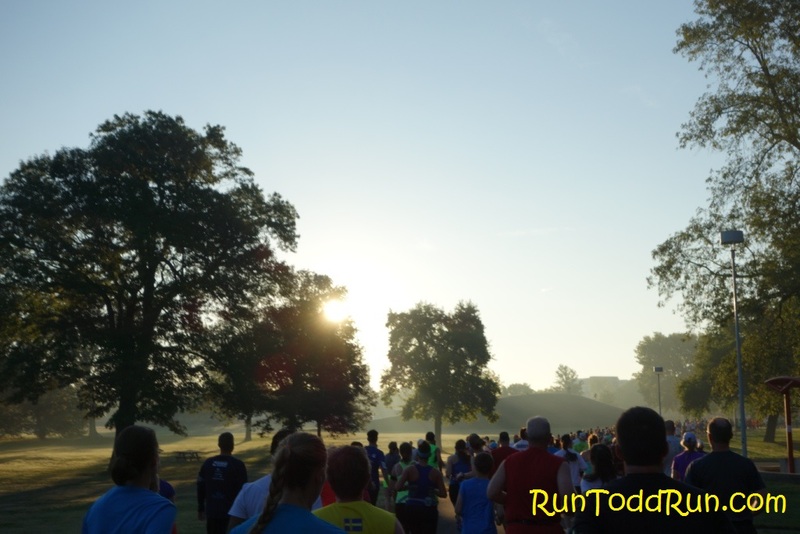 I was without my running partner for this one, and it was certainly not the same. Anyone who knows me will tell you that I enjoy my alone time like few others, but the PR Joyce and I achieved last fall felt better than this one. Running is our thing. It is that thing we get to do together. I enjoyed this run, but I would have liked it a lot better if (1) our son wasn’t sick and (2) we had run it together. In the end, it was nothing serious with our son, but I suppose I am still a horrible father. 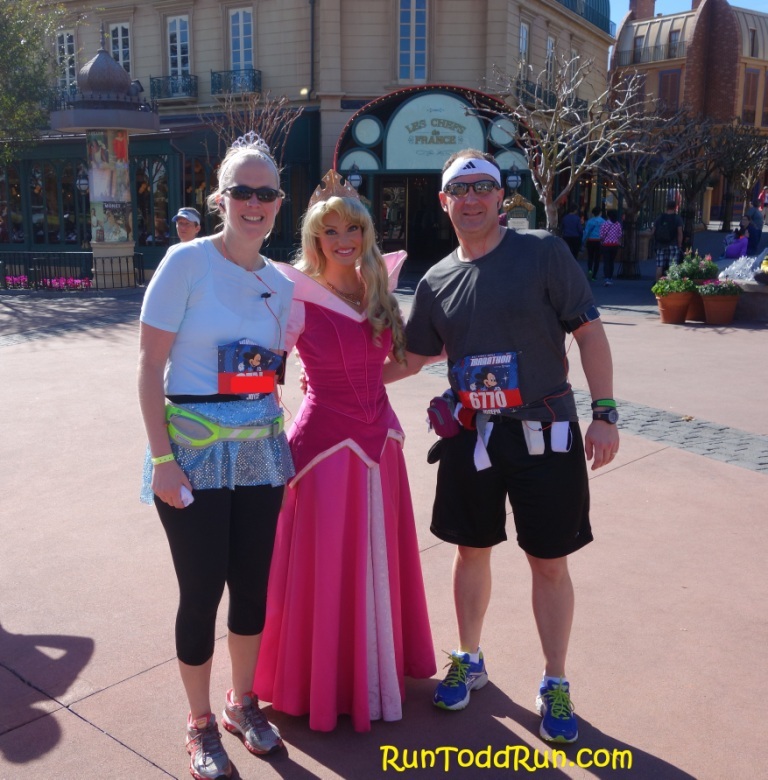 I told Joyce she should go with the girls to run the Princess Half in Disney World. Does that make it better? Probably not, but it is worth a shot. 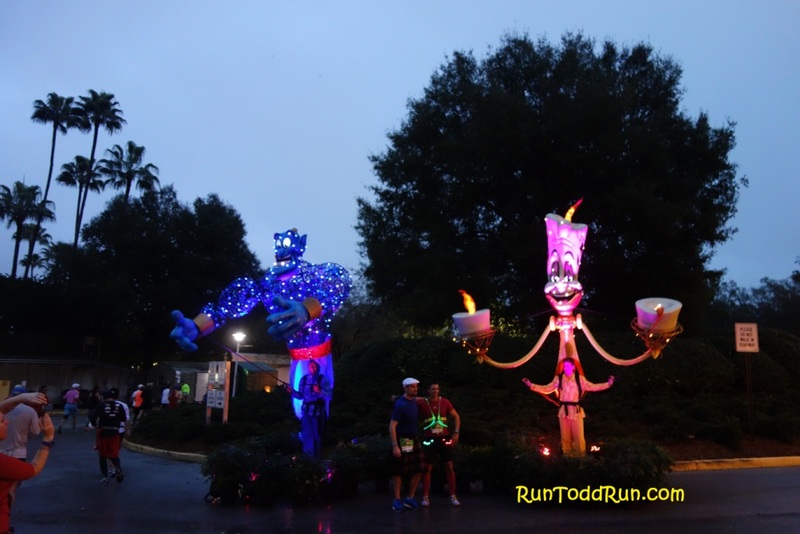 Next up, a possible 5 mile race on Thanksgiving morning, and the Santa Hustle Half Marathon in mid-December leading up to the Walt Disney World Half Marathon in January. I am looking forward to having my running partner back. 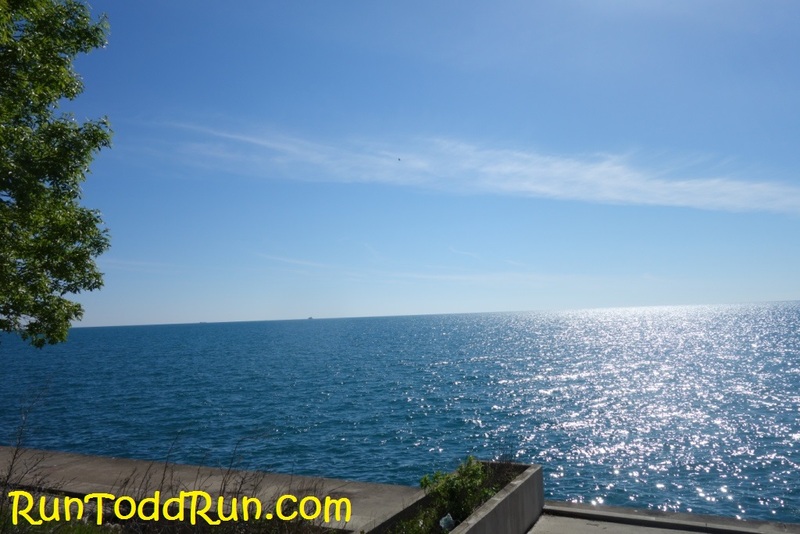 This entry was posted in Running and tagged Average Guy Running on November 22, 2013 by jtspurge. 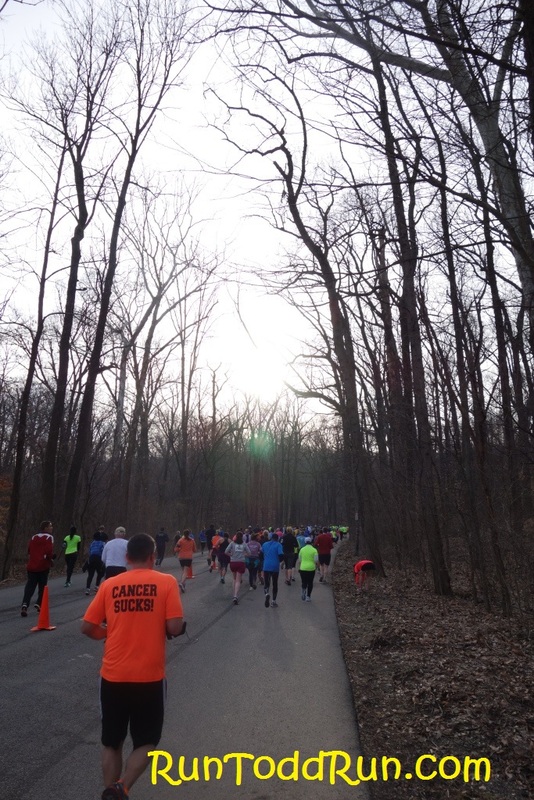 This weekend we returned to the race of our half marathon PR. 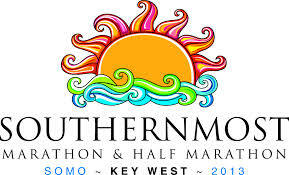 The weather could not have been more different than our last half two weeks ago at the Southernmost Half Marathon in Key West. SOMO start temp: 80. Big Hit start temp: 33. I must admit, I am not yet into the winter running mode, and am not in practice in properly layering. However, I luckily hit the nail on the head on this one. 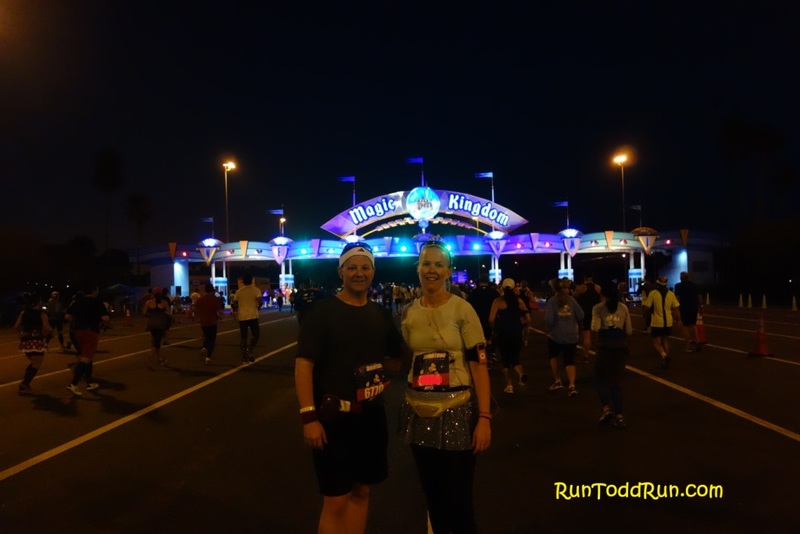 We arrived early to get in a couple of miles before the race, since we were scheduled to run 15 miles this weekend for our WDW Marathon training. We were not as early as we wanted to be, so we cut it to 1.5. Even then, we were not able to get a restroom break before the start since the lines were so long by that point. We decided we would just hit some along the way. Not the best choice. As you can see from the home plate in the race logo above, “Big Hit” is a baseball reference. 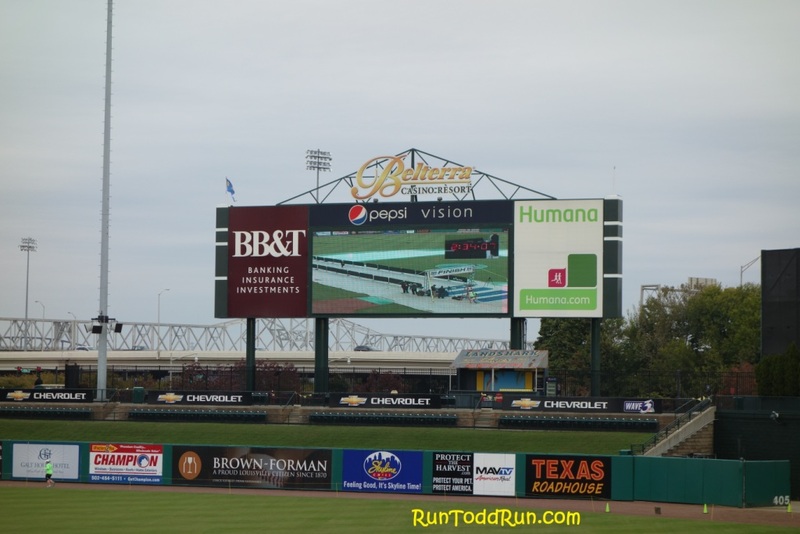 The race started just outside Louisville Slugger Field, a minor league stadium. The finish was at home plate, but more on that later. This is a small to medium-sized race with about 900 runners as far as I could tell from the bib listings. As a result, the start was smooth, and not very crowded. 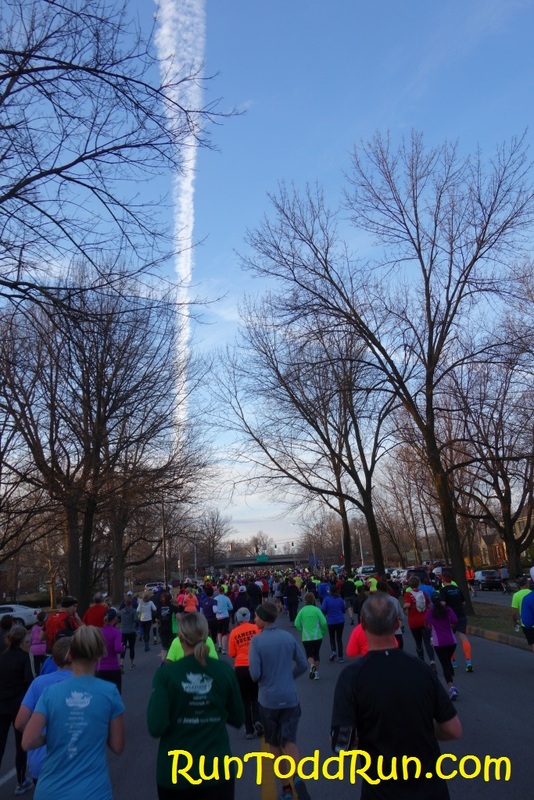 We lined up at the 11 minute mile pace sign, and we were on our way. The race headed out River Road for a short out and back before we headed back toward downtown Louisville. 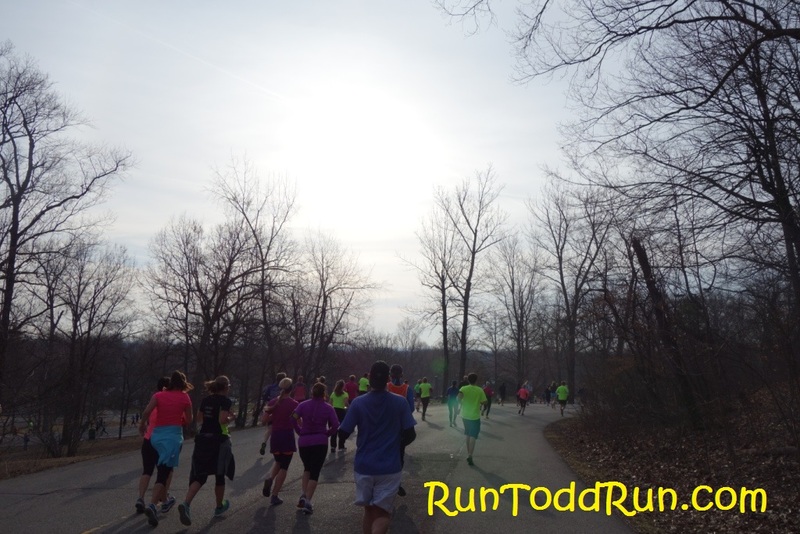 It was a beautiful morning for a run, and we started out at a comfortable pace. At about mile 1.5 we saw some porta pots off to the side of the course with no line. Score! Well, not really. They were locked! Teases! 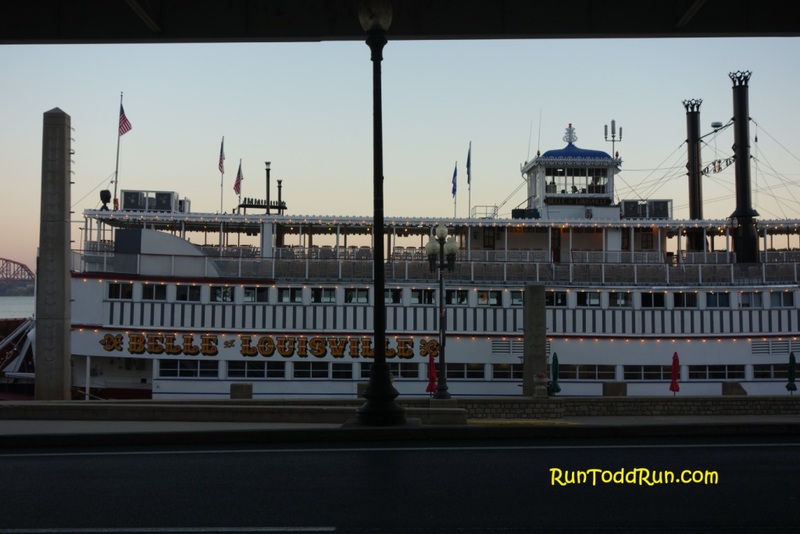 After about a minute delay for that failed mission, we made our way down River Road, past the Belle of Louisville steamboat. We were regretting not being able to make that bathroom stop before the race. The comfortable pace was not so comfortable any more. Just past mile two, at the water stop, we spotted some porta potties with only one person in line. Great! Well, not so fast yet again. I think the two folks in the porta pots ahead of us, and the one in line, were the slowest restroom-break-takers I have ever seen. That was a VERY frustrating 4 minute stop in the middle of a run. We weren’t necessarily shooting for a PR, but we are a competitive couple, and it was still a pain in the rear. If we didn’t have pains in the bladders, we would have moved on. But we weren’t taking any chances. 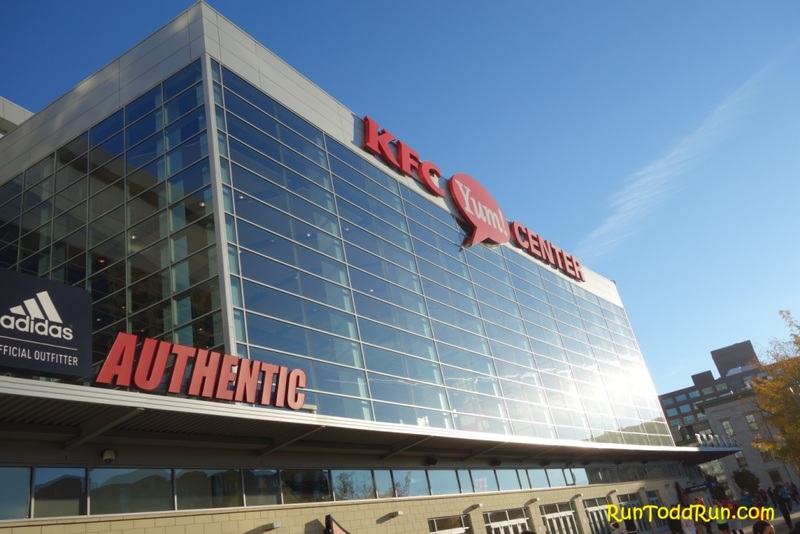 After that annoyance, we continued on through downtown Louisville, past the KFC Yum! 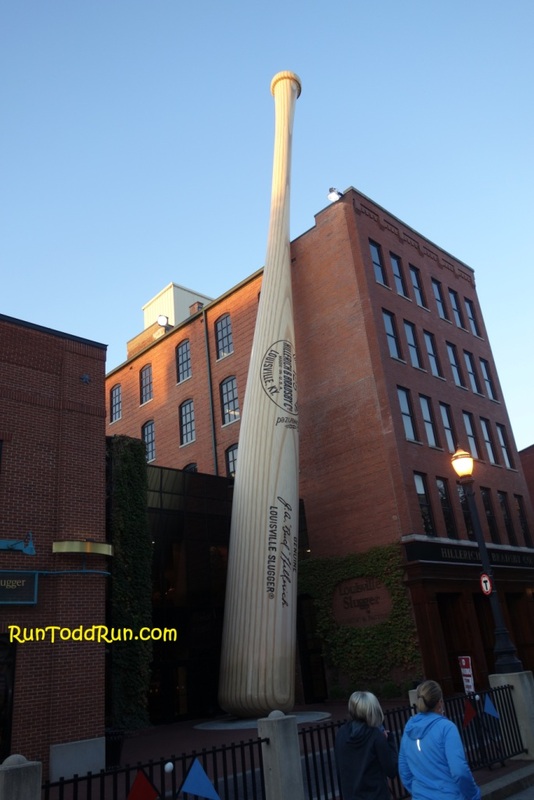 Center, and past the Louisville Slugger factory, home of the world’s largest bat. 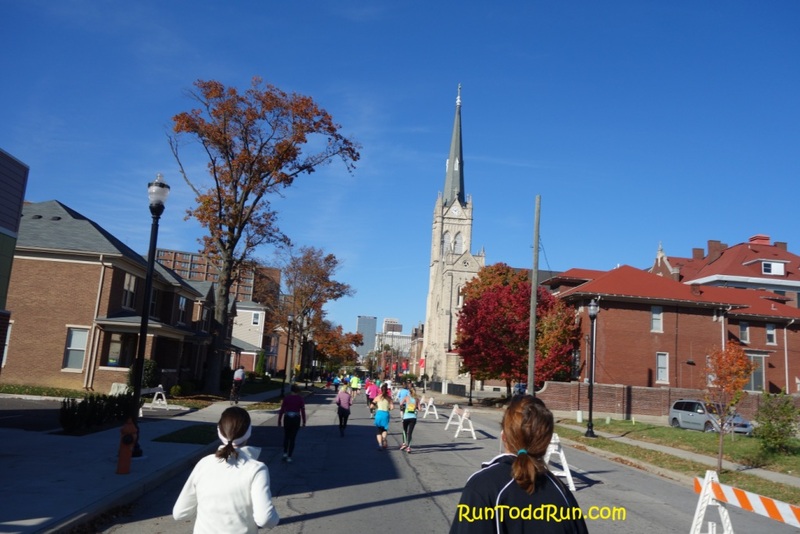 The race then took us out of downtown, where the 1/4 marathon race turned off, and we continued toward U of L and Churchill Downs. 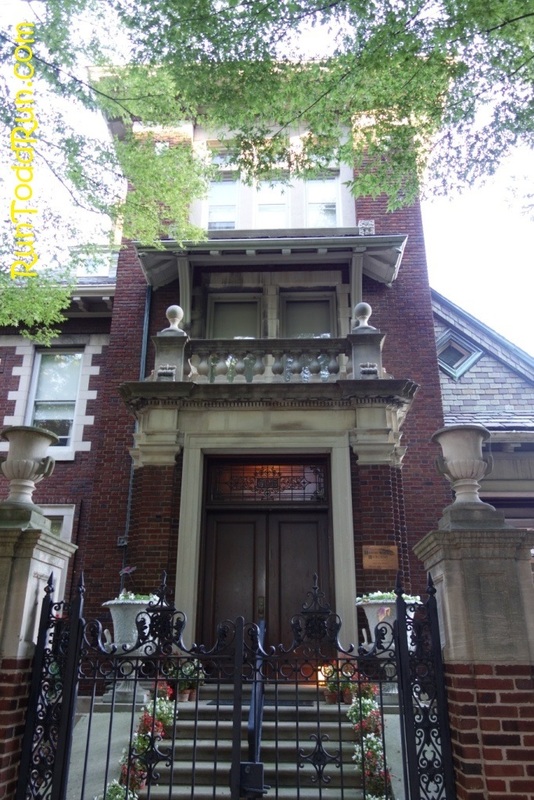 This is a gorgeous stretch of the run, following tree-lined streets with stately old homes. There were bands spaced along the course, which was great, and there was some good crowd support at spots along the course. 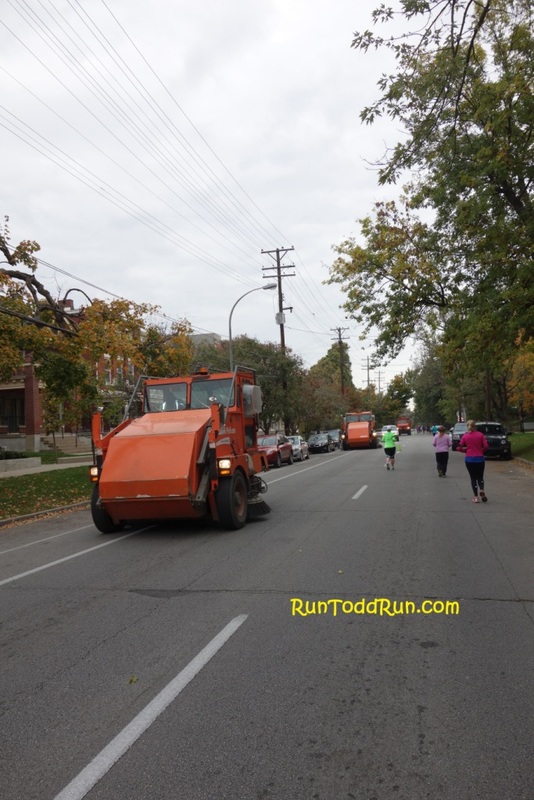 Much of the way out toward Churchill Downs, we had the great 2:30 pace group leader near us. 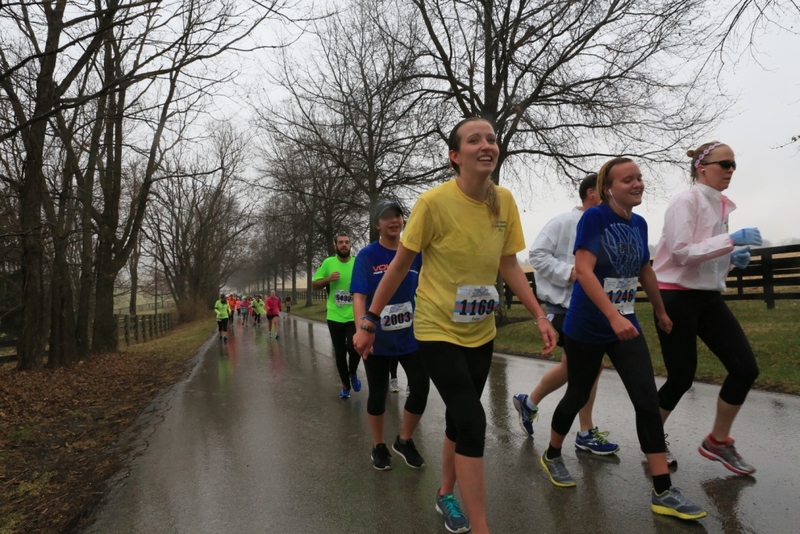 She cheered loudly for each and every runner she passed on the out and back portion of the course. It was certainly a pick-me-up, and it was great to see all the smiles she caused. We had made it a goal to catch her after our bathroom delay. We did that by mile 6, and we were out of earshot by about mile 8.5. 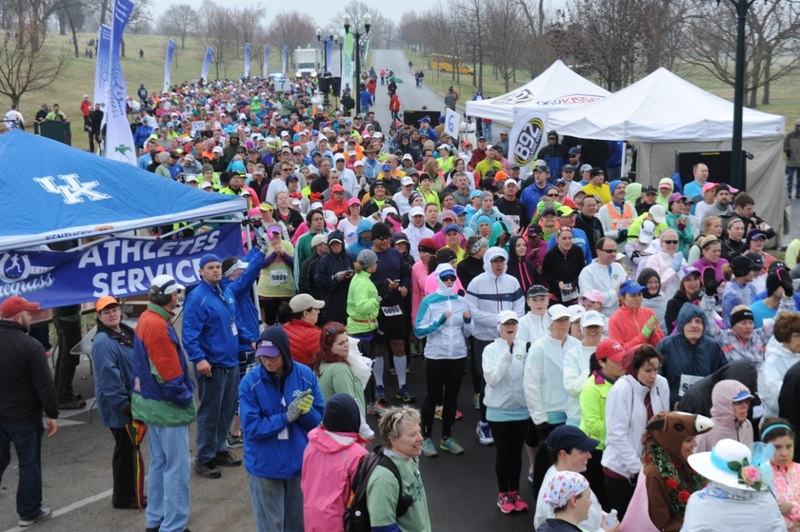 The race turned around at mile 8 outside Churchill Downs and made its way back to Slugger Field. (We got a cheer of our own from the 2:30 pace girl!) I really like this part of the course too. It is essentially a 4 mile stretch that feels downhill back toward the river, and it follows that same tree-lined street. We were able to see the folks still heading out on our way back, which is always interesting. We saw the last of the runners heading the other way. Right behind them were the sweepers. Not just any ordinary sweepers. The Big Hit doesn’t mess around when it comes to sweepers! When they say sweepers, they mean it! 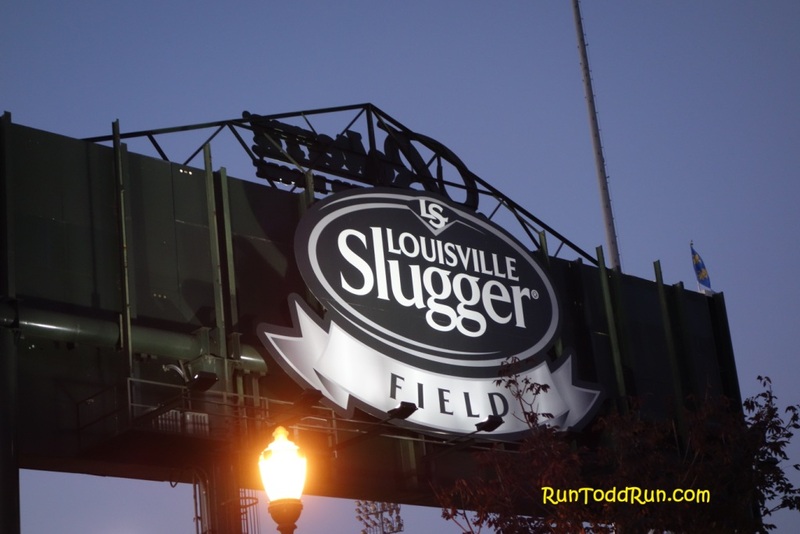 We continued back through downtown Louisville and made our way back to Slugger Field. 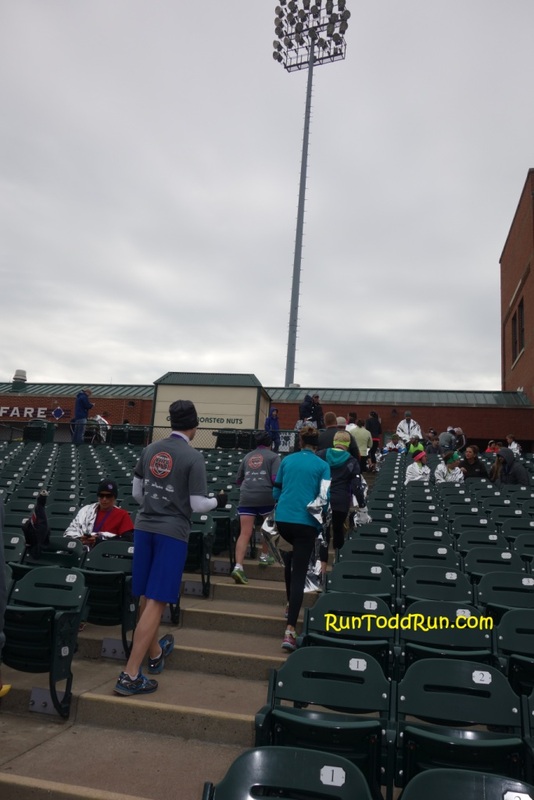 The route takes runners in through the center field fence, around the warning track, down the third base line, and finishes at home plate, which makes for a great experience to end the race. We finished our 11th half marathon strong, with a pretty decent pace for us. It was more than twenty minutes faster than the SOMO just two weeks prior, and knowing that we blew about 4 minutes on bathroom issues, we felt pretty good about our time. What a difference 40+ degrees makes! 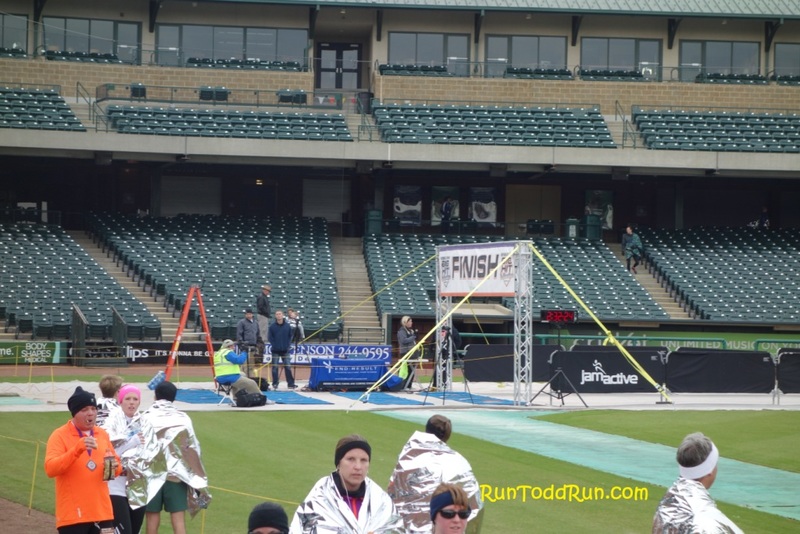 A lot of people make a big deal about running through Angel stadium at the Disneyland Half (me included) or Champion Stadium at Disney World, but having the opportunity to finish on home plate at Slugger Field tops both of those for me. Sure, the crowd is smaller than Angel Stadium, but the experience is certainly better than finishing in some parking lot. I like to think the Big Hit is an undiscovered gem. 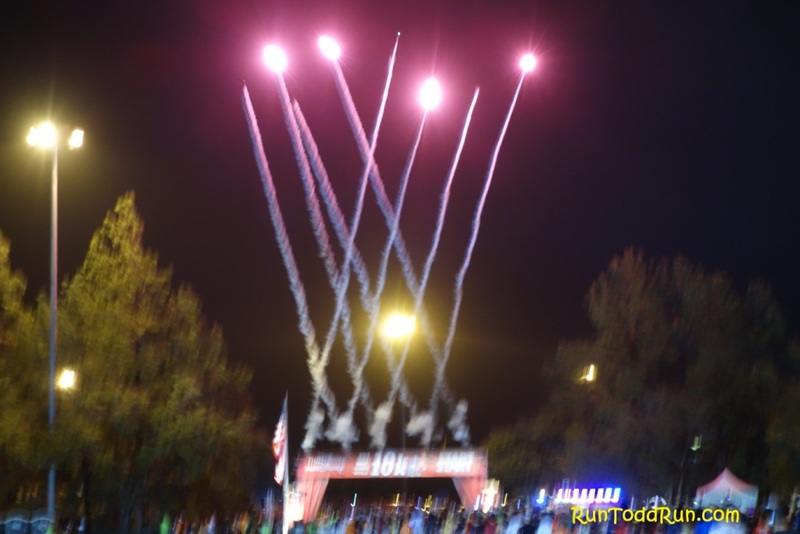 It has a great course, good organization, enthusiastic volunteers, and a really cool finish. Maybe I am just biased because it home to our PR. So be it. I hope to be back again next year. 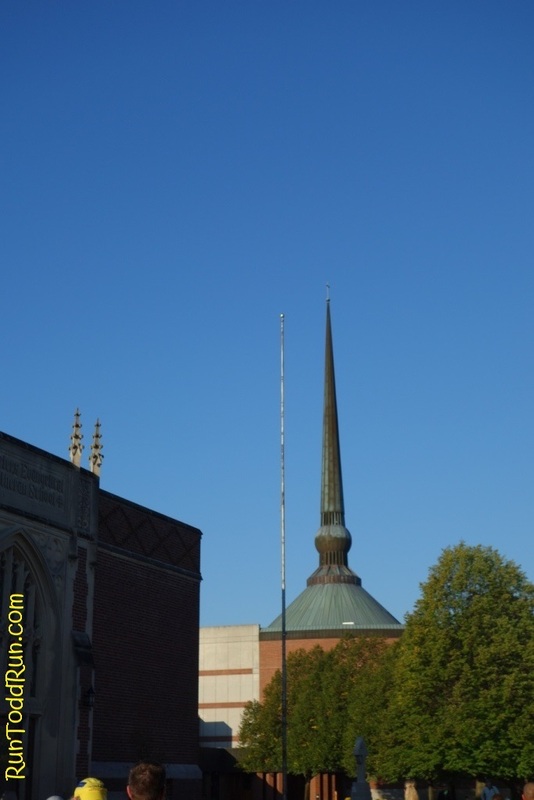 This entry was posted in Uncategorized on October 28, 2013 by jtspurge. I wonder how many will land here after they Googled looking for something totally different? Hot and Gorgeous. 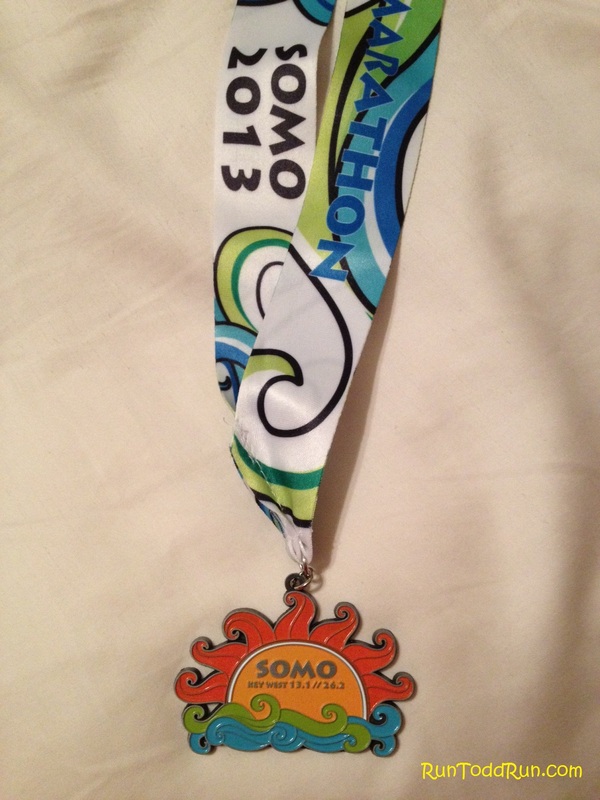 That is how I would describe the inaugural Southernmost Half Marathon (SOMO). It was hot. Really hot. It was gorgeous. Really gorgeous. It was memorable for the good parts, and just as memorable for the not so good. I had been looking forward to this race for quite a while. 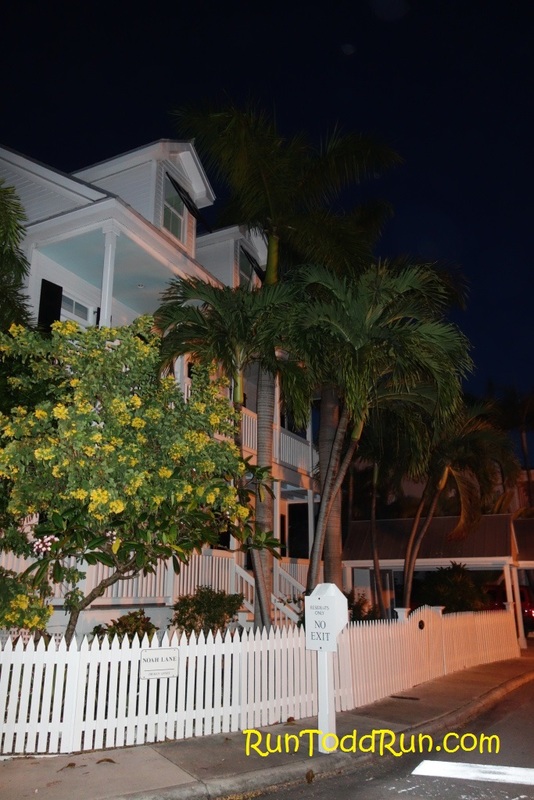 I love Key West, and having the chance to get a closer look by running through the streets and past the landmarks was something I could not pass up. Luckily, this race fell during our son’s fall break, so we made a vacation out of it. We came to the keys the weekend before, and spent the week enjoying all they had to offer. This also gave us time to attempt to get adjusted to the heat. My wife, Joyce, and I ran a couple of times during the week to see what it was like in the heat. We knew it was going to be a challenge, just like it was in Disneyland, maybe even more so. I was just glad I was not running the marathon. 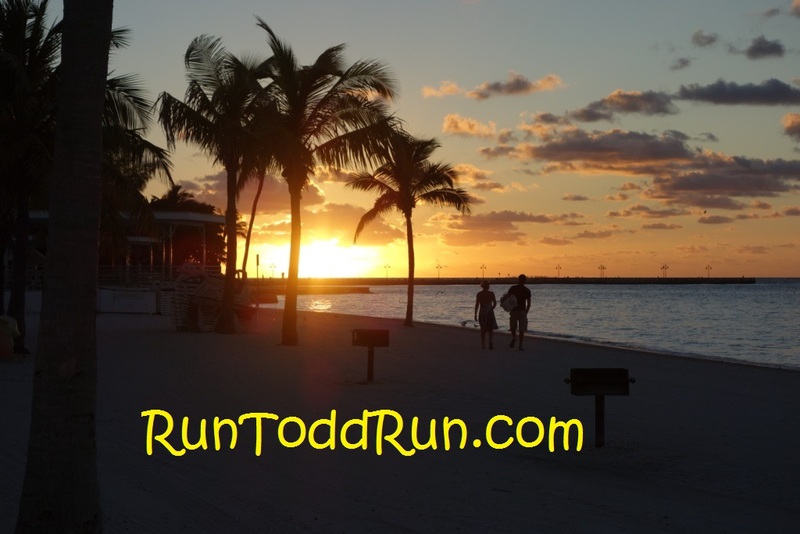 We picked up our packets early on Thursday before the Saturday race while we were in Key West. In a nice twist, they provided hats in addition to t-shirts for all the runners. 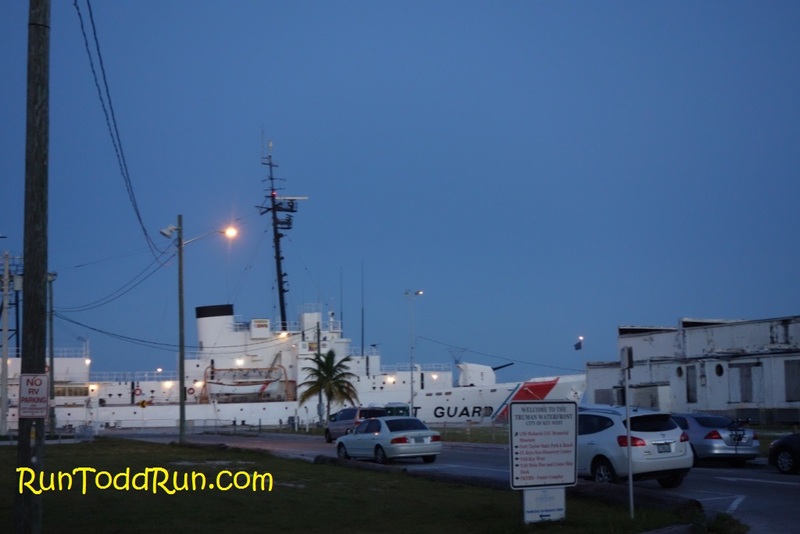 Then, on Saturday we got up early and headed down to Key West for the 6:45 a.m. start. The race started right outside the Rum Barrel restaurant. 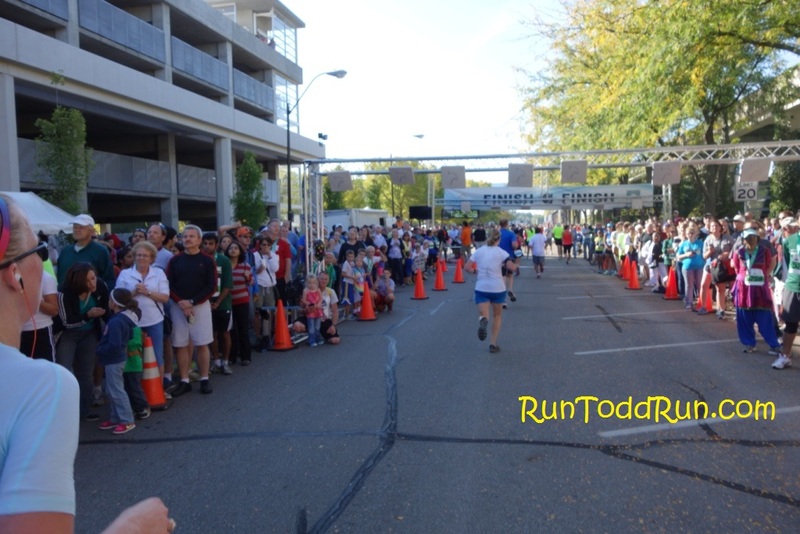 This was a smaller race, with 650 or so runners between the Marathon and Half, so the start was very smooth. 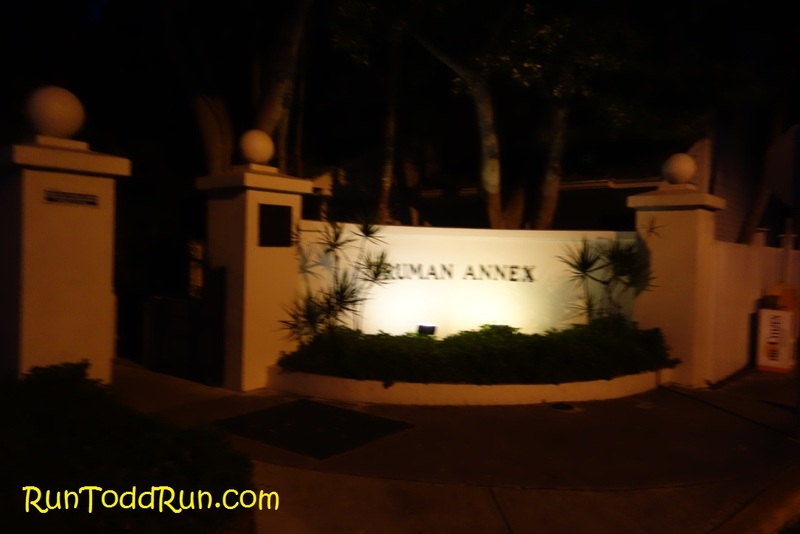 We headed out toward the Truman Annex and into Fort Zachary Taylor State Park. This route was classic Key West, and provided some great scenery. As we exited this area and headed toward the beach, the sun was starting to rise. Although it made for a gorgeous atmosphere, we knew it was about to feel a lot hotter. The sunrise did not disappoint. It was truly priceless. Then came the beach stretch. That is when the heat started to announce its presence. It is one thing when it is hot and dark out. It is quite another when it is hot and the sun is up. The stretch along the beach provided us with some great views, but was also a challenge since there was no shade to help. 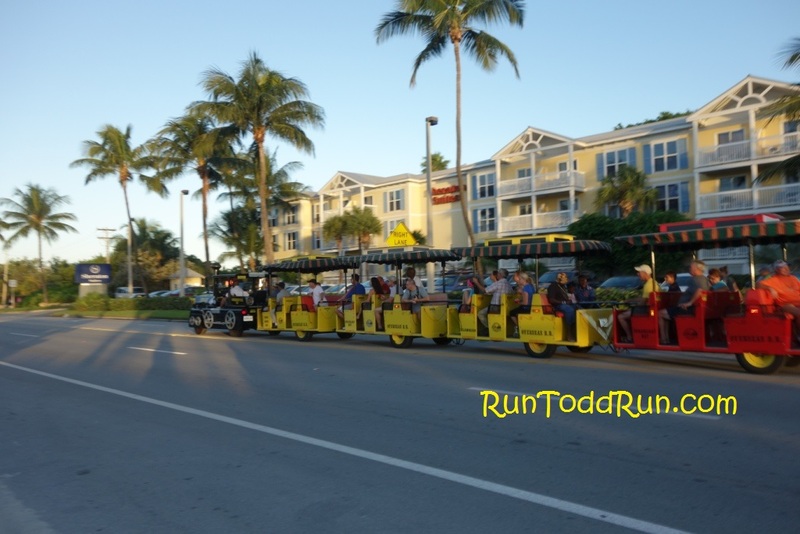 They had a conch train of cheering fans and cowbells that made a couple of appearances. This was a cool idea, since there was not much of a crowd on the rest of the course. There were a couple of pockets of ardent supporters though. One group at the beach was still there, misting hose in hand, cheering on the remaining marathoners hours later when we were on our way out of Key West. 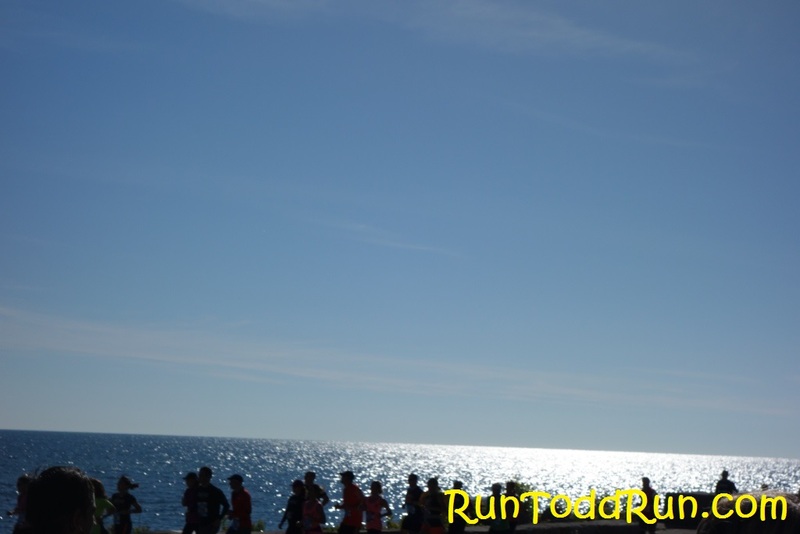 We ran out Roosevelt along the beach to the turn-around at about mile 7.5. The heat really started to get to Joyce at that point, and by mile 9 she was really struggling. At first, we extended our walk breaks, but in short order we were simply walking. The last four miles ended up being mostly a walk, punctuated by an oncoming mass participating in the cancer walk, which happened to share part of the same course. On our way back. . .
We finally made it back to Whitehead Street and trudged to the finish line back at the Rum Barrel to complete our 10th half-marathon. Our time was over 20 minutes slower than our time at the Columbus Half just two weeks before. What a difference the temperature makes. 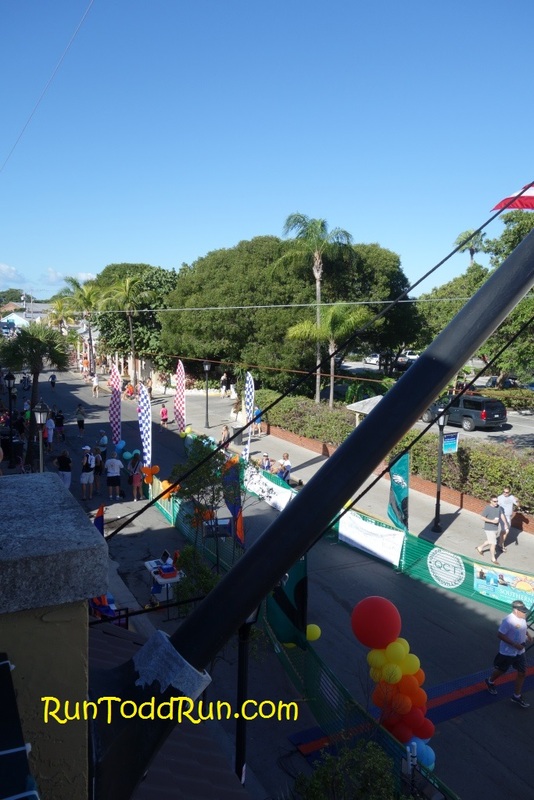 Still, it was great to be able sit on the top deck of the Rum Barrel and watch the Marathon finishers come in, and there is no shortage of post race shopping and entertainment in Key West. This was a tough run. The type than can make someone really contemplate why they do this. It was no fault of the race organizers. They did a great job. 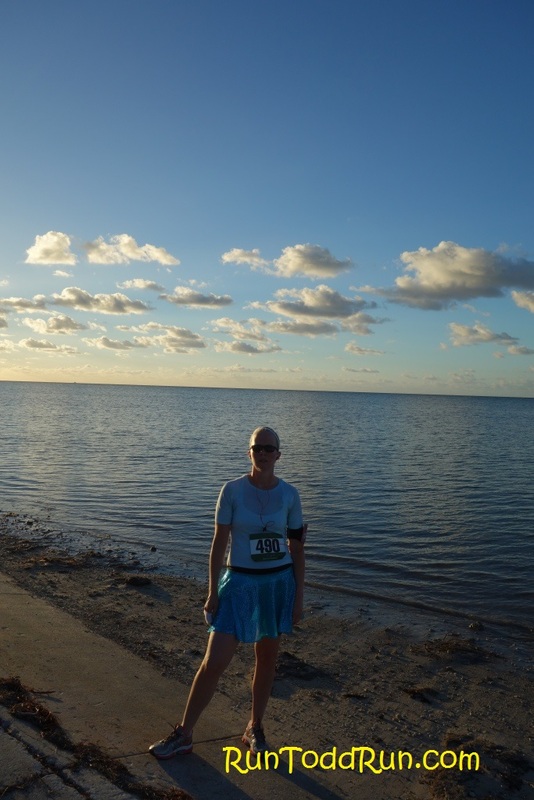 The course was beautiful and flat, the volunteers were awesome, the race swag was cool, and it was in Key West. However, it was South Florida in October, and the weather was challenging. It ultimately won out on this day, as far as time goes. But we finished. 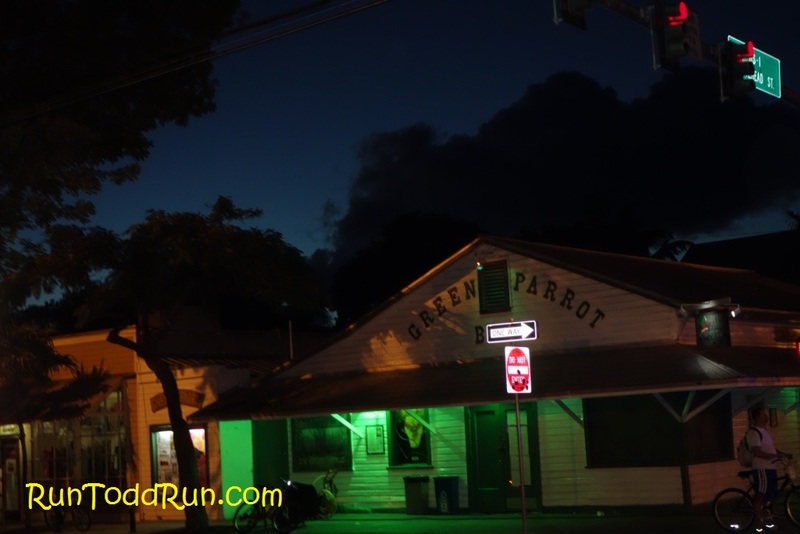 We got to see parts of Key West we had not seen in our many prior visits. We got to spend time together (though I was grumpy for a few miles of it), and we got to take part in a unique event. 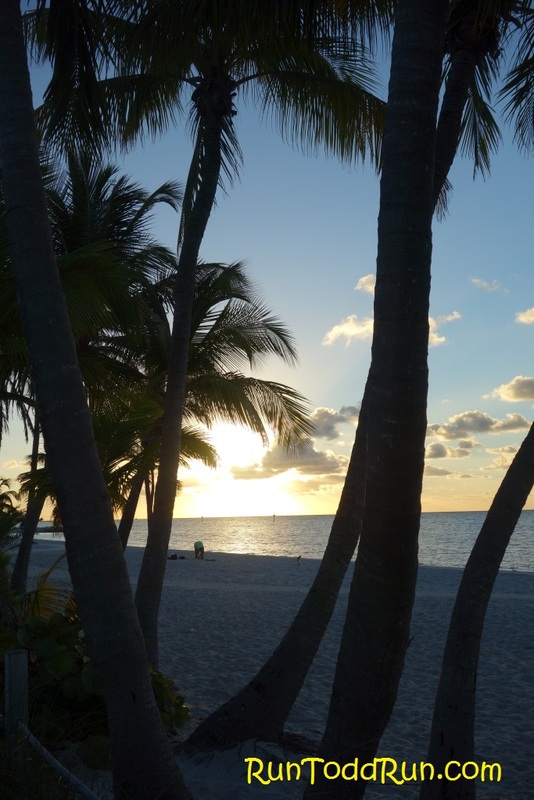 In the Keys, you will often see a sign that says “If you are lucky enough to be in the Keys, you are lucky enough.” That thought can be applied to so many things in life. 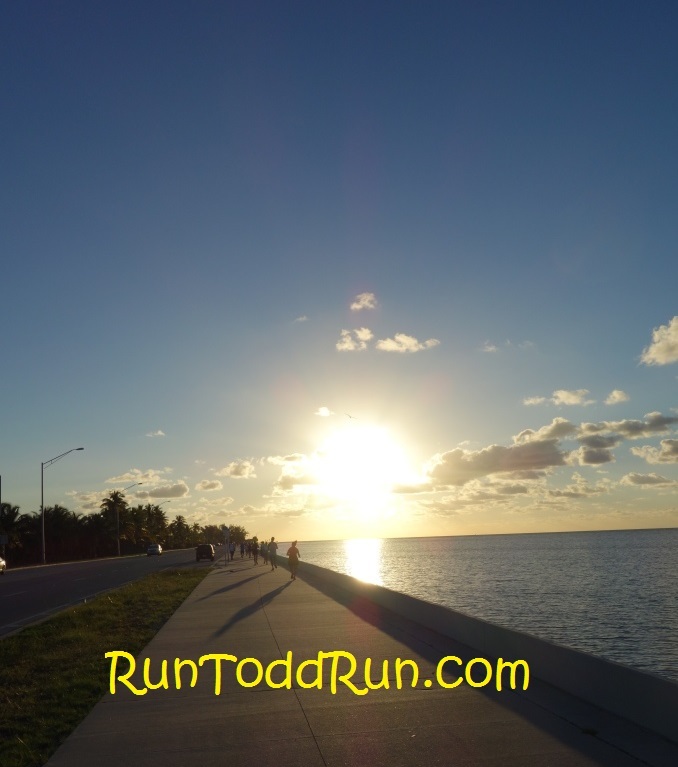 If you are lucky (and blessed) enough to be able to run 13.1 miles in Key West, you are lucky enough. So true, and that is what I will take away from this run. No matter how challenging the heat was, the course was just as beautiful, and we were blessed to be able to be there to experience it. I would certainly recommend it if you ever get the chance. 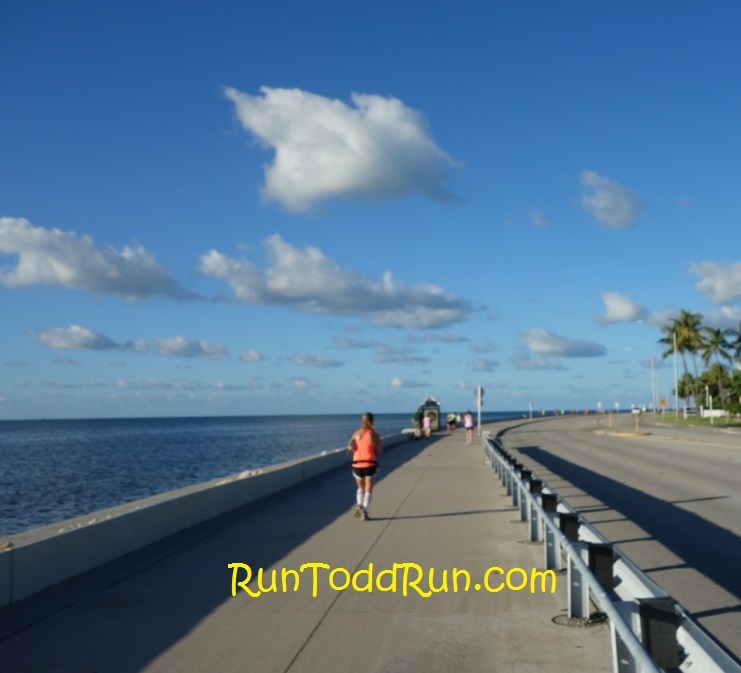 This entry was posted in Running and tagged Key West, Southern Most Half Marathon on October 15, 2013 by jtspurge. 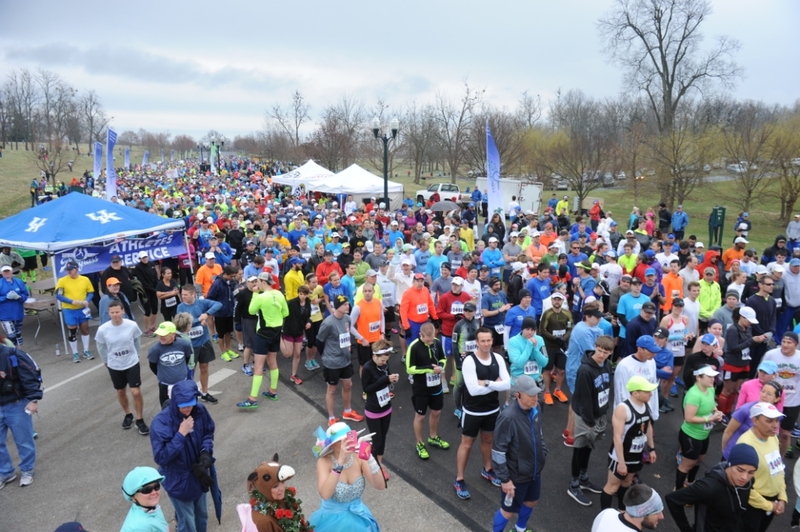 This year marked the inaugural Mill Race Marathon, Half Marathon, and 5k, which took place in Columbus, IN. 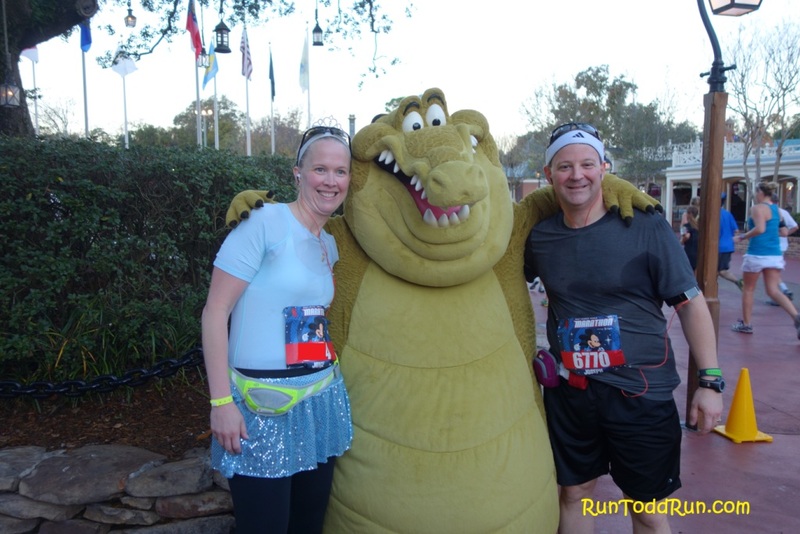 We ran the half marathon as part of our training for the Walt Disney World Marathon coming up in January. I must say, for a first year event, it was stellar. Even the governor of Indiana, who is from Columbus, participated in the 5k. The event included a two day expo prior to the Saturday races, as well as an after party in downtown Columbus. That after party included rock climbing, activities for kids and adults, and even a zip line through downtown Columbus. We had to leave right after the race, so we did not get to experience that firsthand though. As for the race, I must say I was a bit worried as the weekend approached. The weather man was calling for high temps in the mid-80s, and I was having flashbacks of the heat of the Dumbo Double Dare. 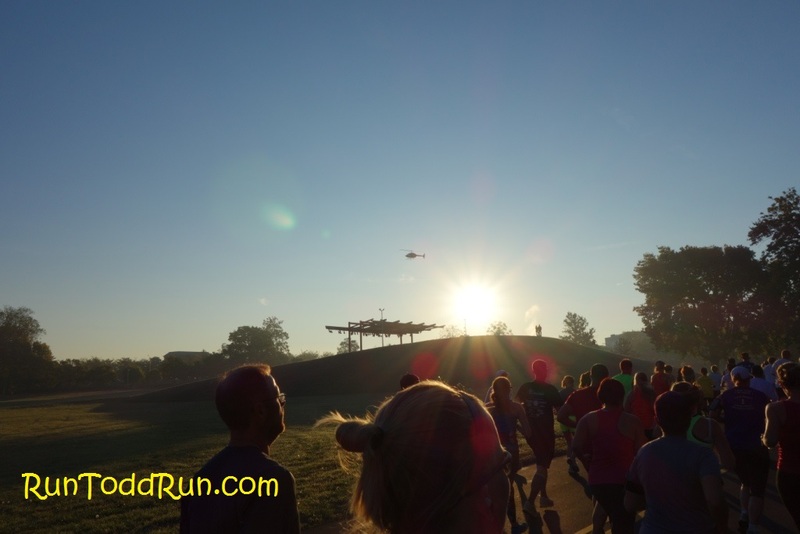 However, the morning started out in the upper 50s, and we could not have asked for better weather for the first part of the race. 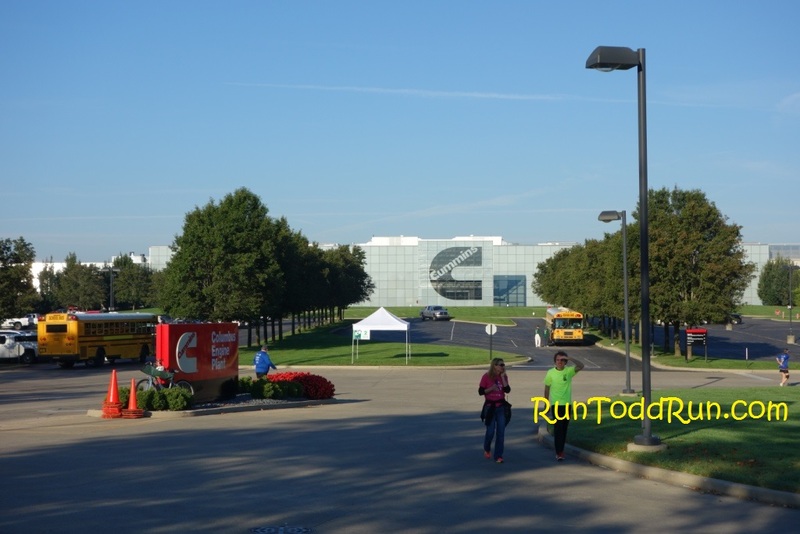 The race started in downtown Columbus, just outside the Cummins Corporate Headquarters. (Cummins is the world’s foremost manufacturer of diesel engines – which explains the medal you will see later). 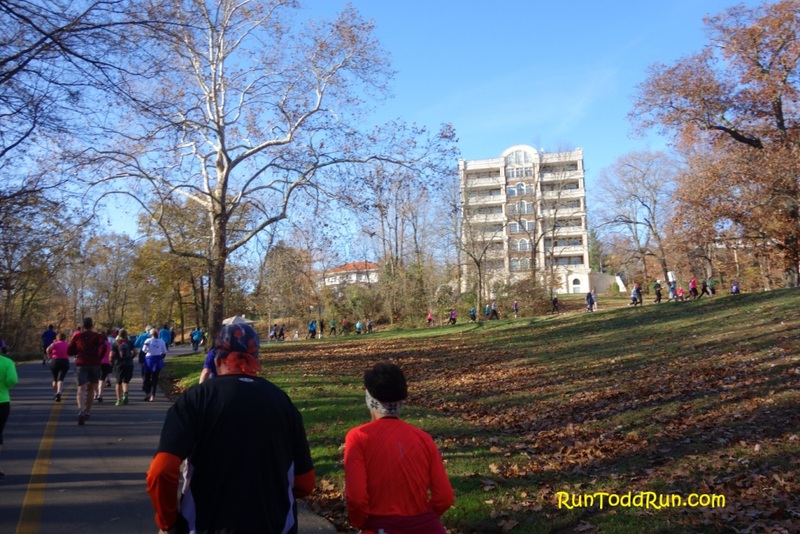 The race then wound through its namesake, Mill Race Park. The park was beautiful at that time in the morning, with sunlight streaming through the trees, and fog rising from the ponds. It was really a great start to the race. There was a rather narrow stretch right after the start, but it was nothing compared to some of the Disney races we have been in. After exiting Mill Race Park, entered the streets of Columbus. 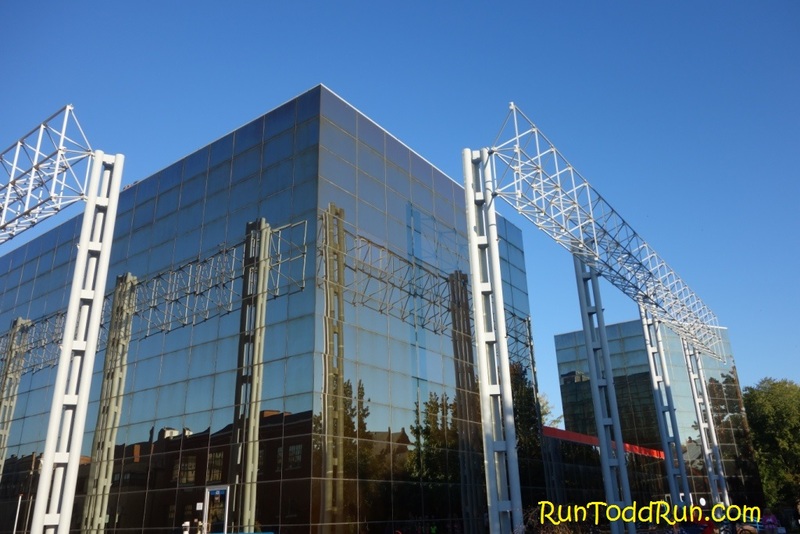 The city is known for its architecture, and the race course took us by several interesting sights. All in all, it was a great course: Flat, with plenty of great sights and shade. The crowds were awesome all along the course, the volunteers were very enthusiastic, and the bands on the course were great. It seems the community really embraced this event. Below are some of the views from the course. We were really impressed by this race. The course, again, was great, and we saw some wonderful sights along the way, including one particularly touching running group. Since this was a training run on the way to the WDW Marathon, and with the questions about the weather, we were not really gunning for a PR. However, for the first 11 miles, we ran a pace that was faster than our prior best. In the end, we missed it by about 2 minutes, but it was good to know we could get close, especially after the beating it felt like the summer gave us. The crowd for the finish was great, and we got a very unique medal out of the effort, which paid homage to Cummins. After this inaugural event, I cannot wait to do it again next year. Great crowd lining the finish. 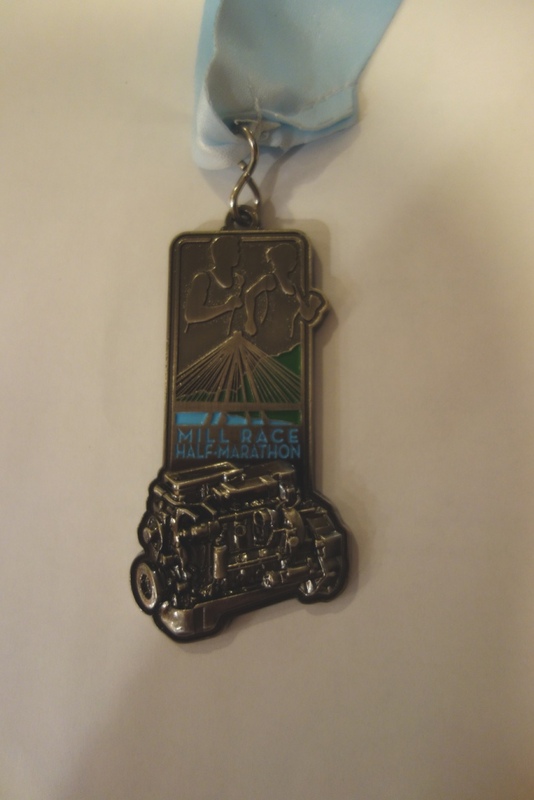 Medal with a Cummins Engine on it! 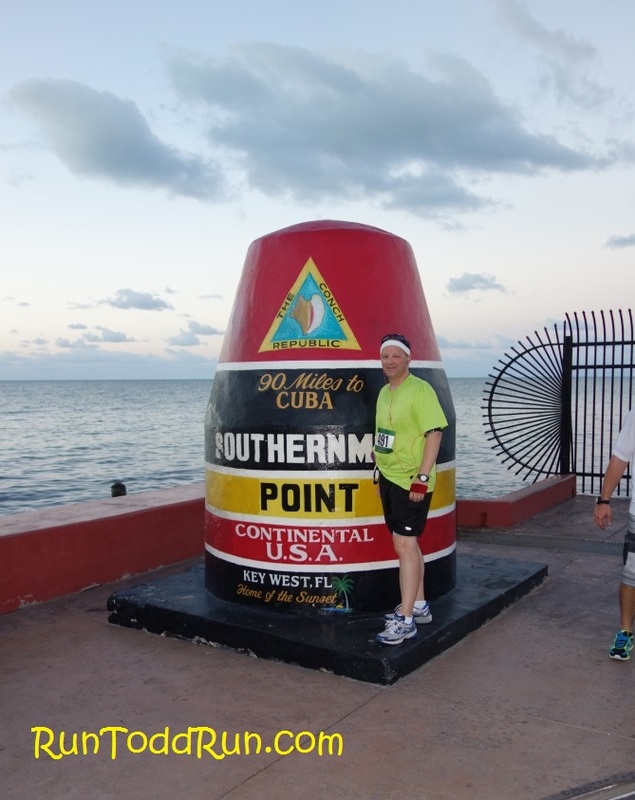 Now its off to the Southernmost Half Marathon. No doubt that one will be a hot one, but it is Key West, so I am not complaining! There is no shortage of icy drinks to cool you off. . . 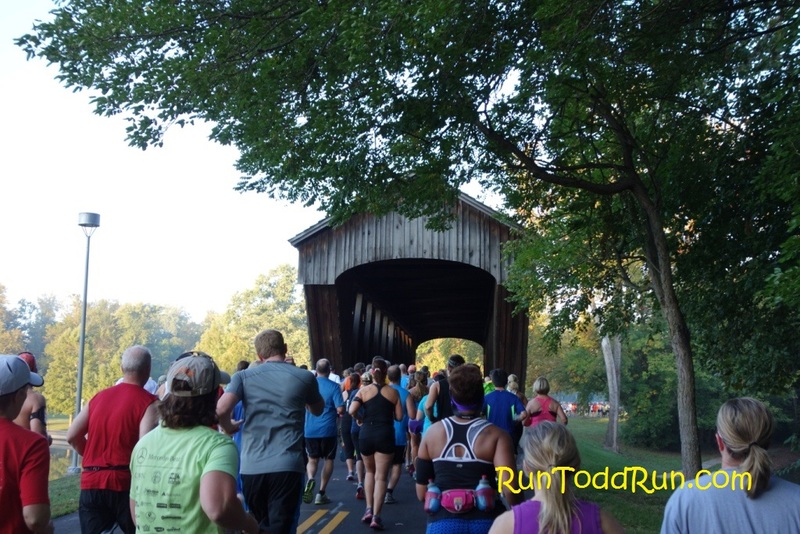 This entry was posted in Running and tagged Average Guy Running, Mill Race Half Marathon on October 1, 2013 by jtspurge.